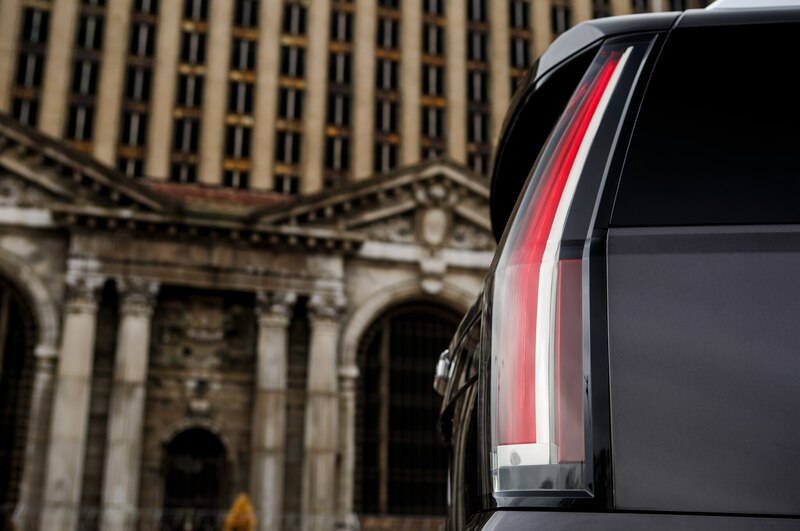 Do you want style or substance? 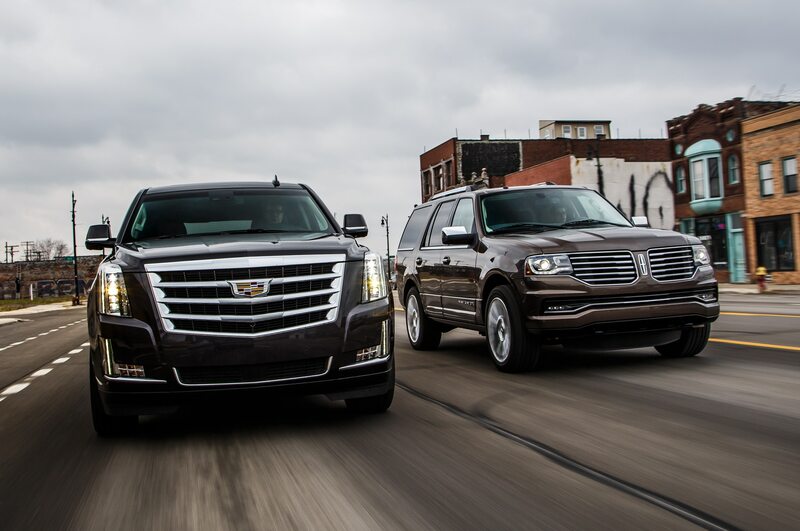 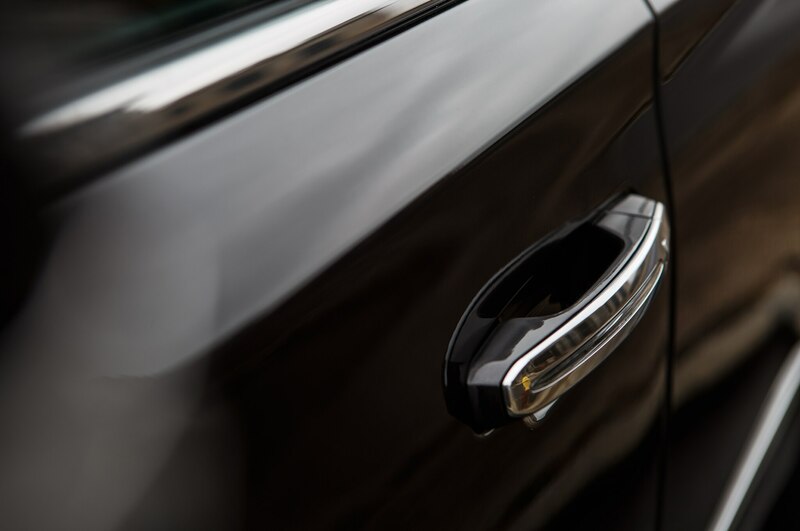 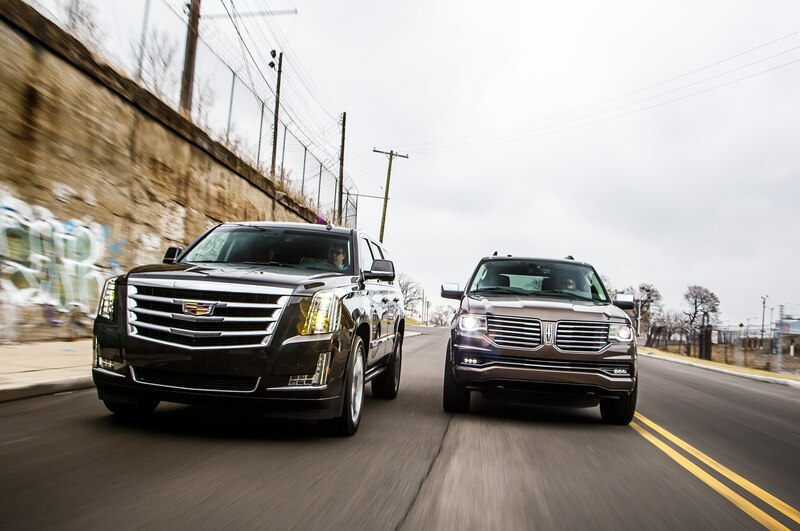 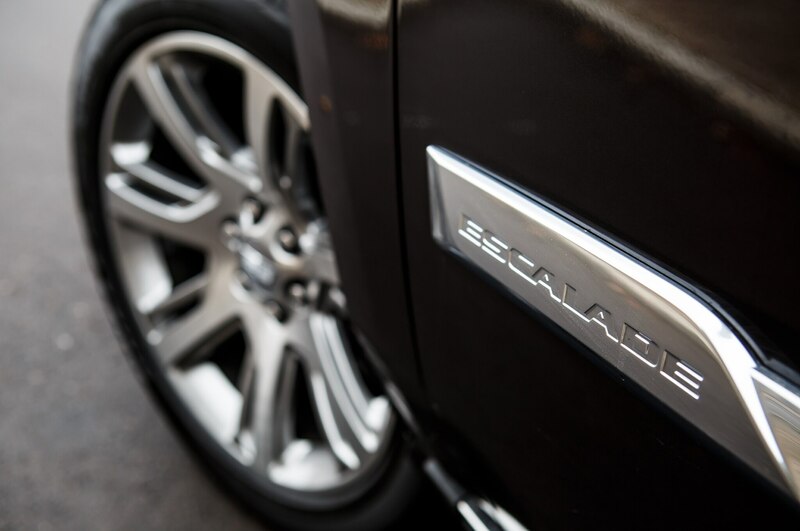 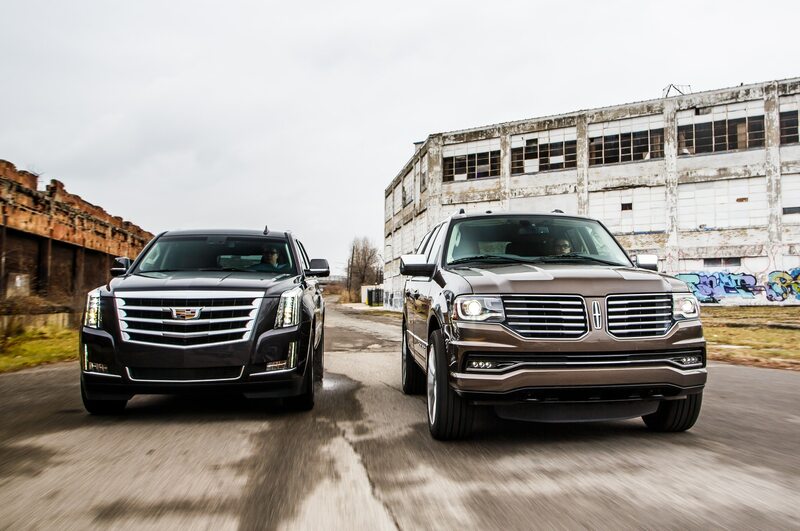 Just like the city from which they hail, the 2015 Cadillac Escalade and 2015 Lincoln Navigator have been renewed and rejuvenated. 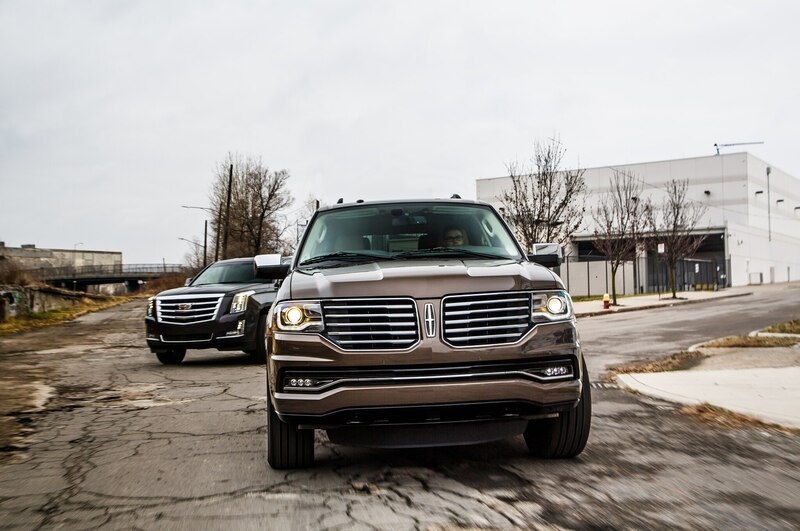 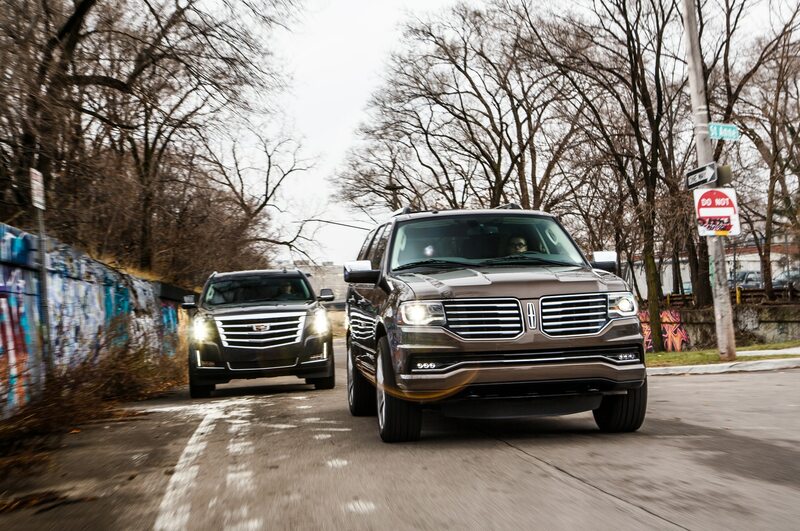 Big, truck-based luxury SUVs faced just as rocky a road as the Motor City over the past 10 years, yet both the Escalade and the Navigator got a new lease despite all the odds. 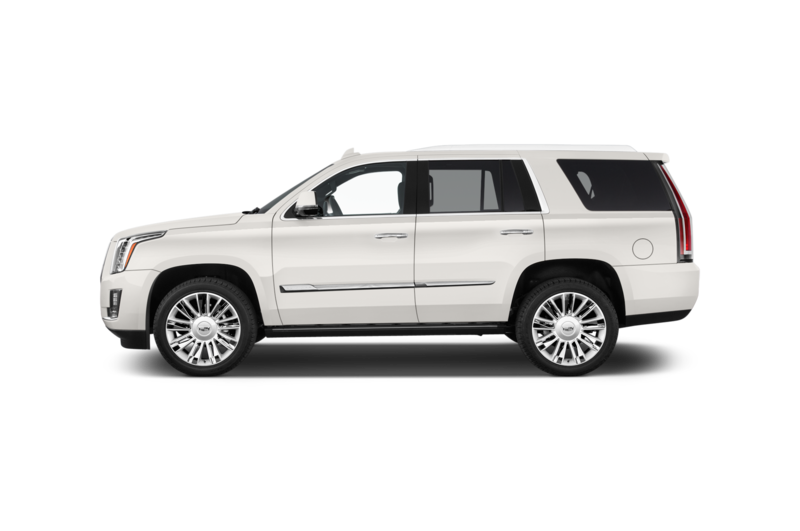 Pricey gas, economic recession, and vehicular downsizing be damned, full-size luxury SUVs are here to stay. 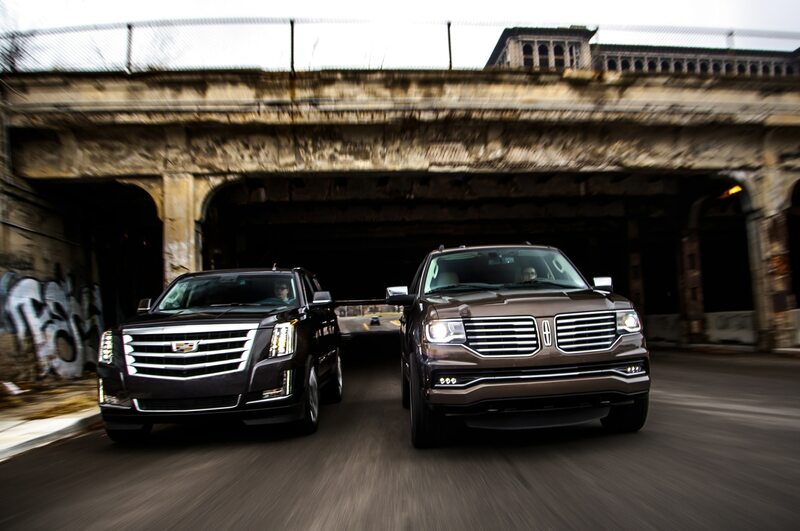 That’s not to say these behemoths haven’t changed. 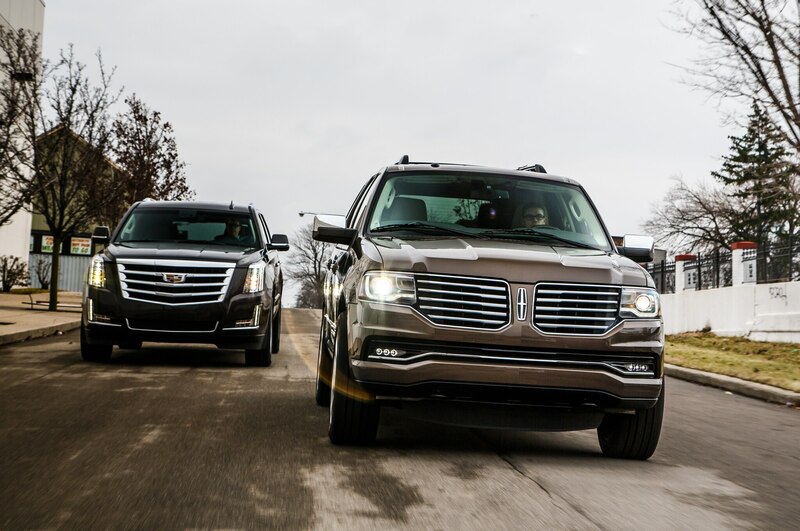 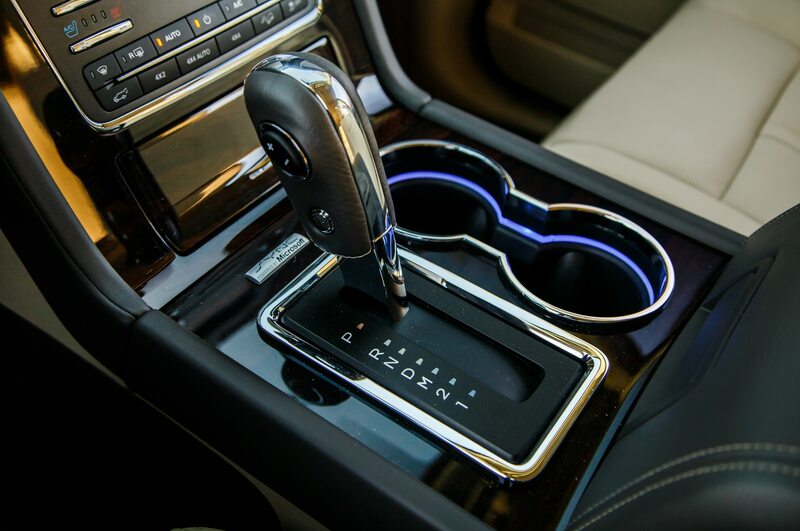 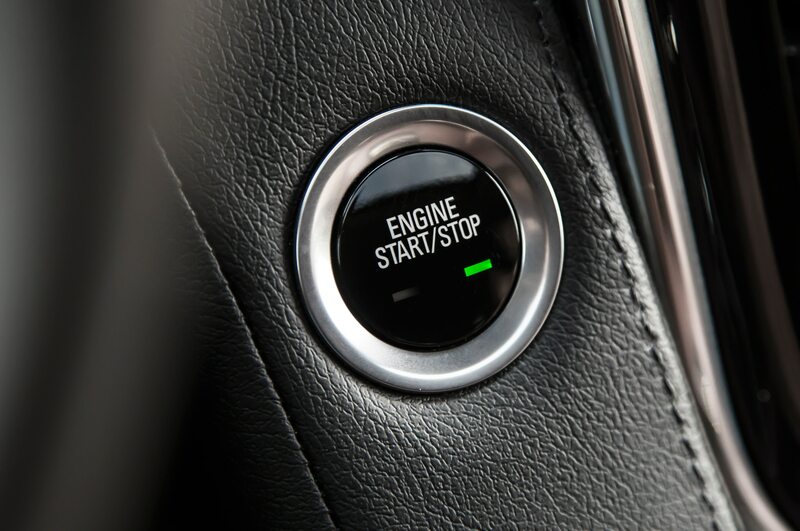 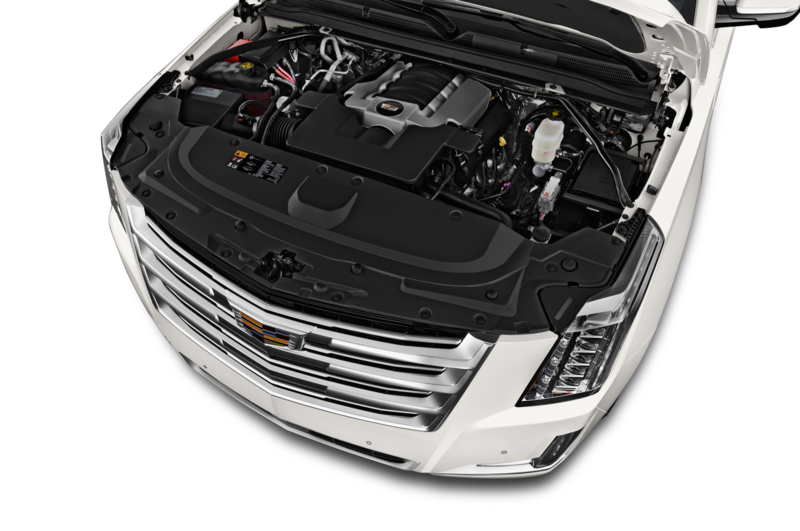 Updated powertrains, an increased number of luxury gadgets, and more modern designs help the 2015 Cadillac Escalade and 2015 Lincoln Navigator stay relevant in today’s new-car market. 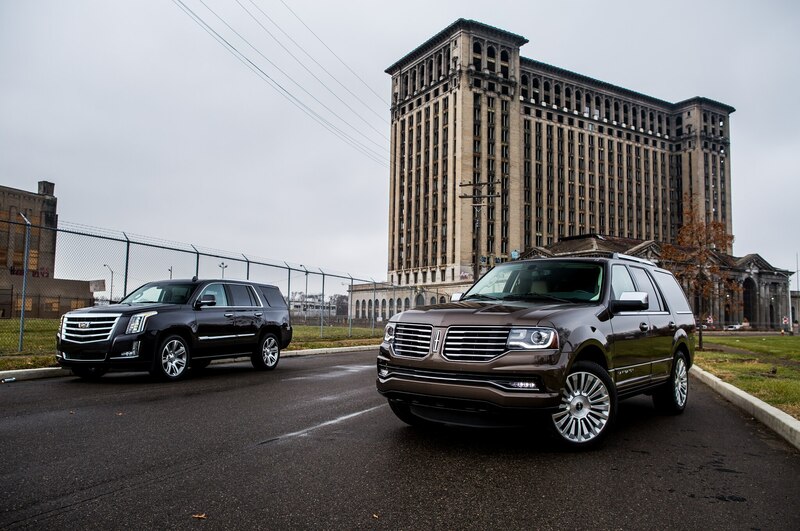 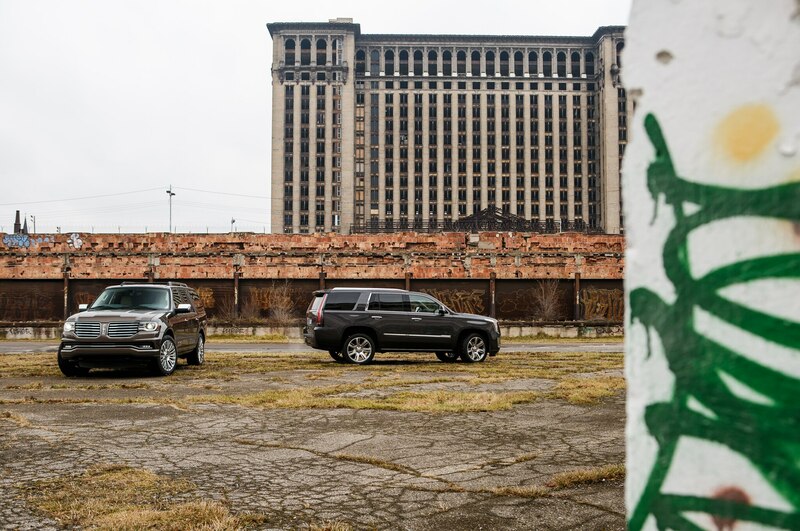 The SUVs are better than ever, but stark differences remain between Detroit’s luxury giants. 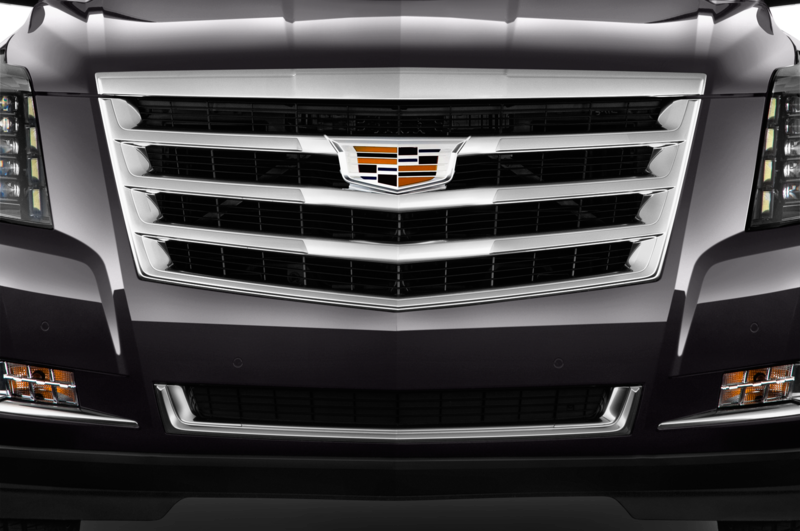 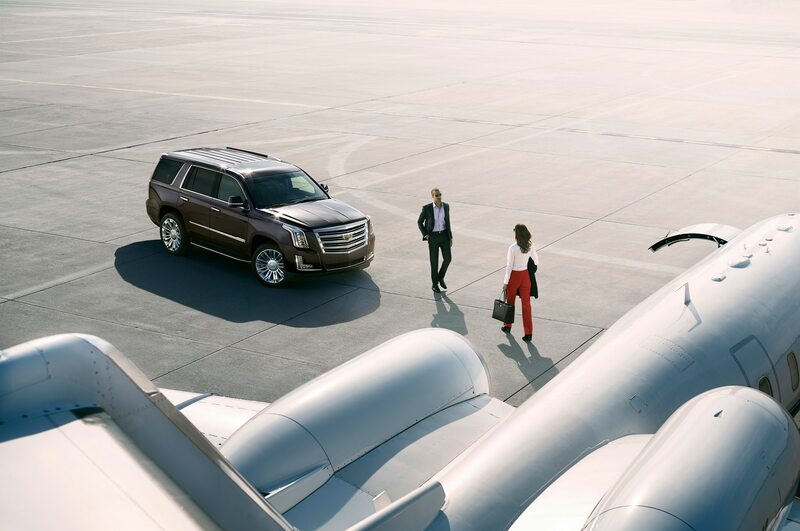 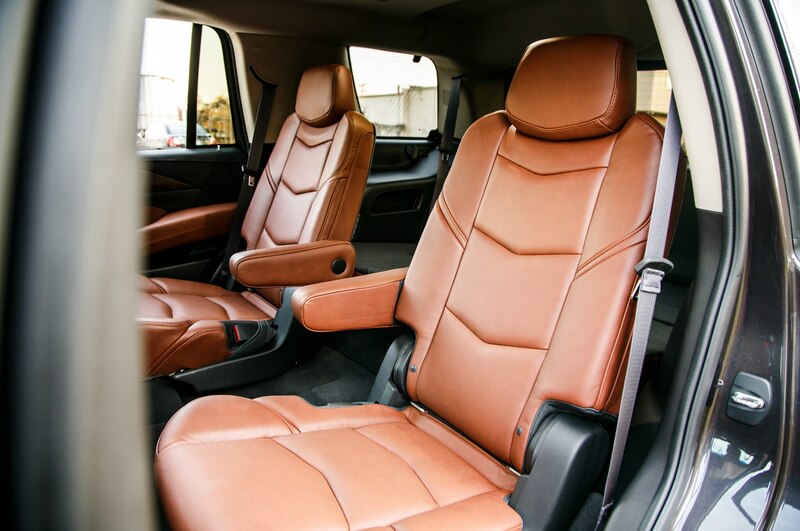 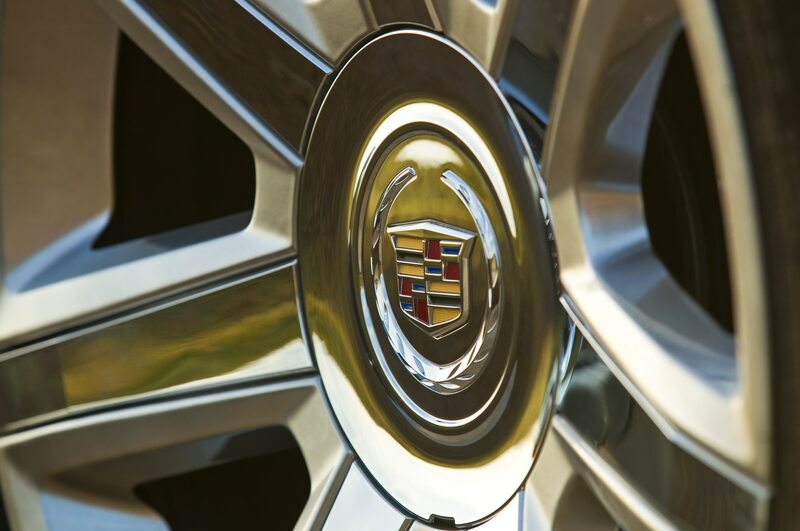 One of the biggest disparities comes at the F&I desk, where prospective shoppers will find themselves spending far more for an Escalade than a Navigator. 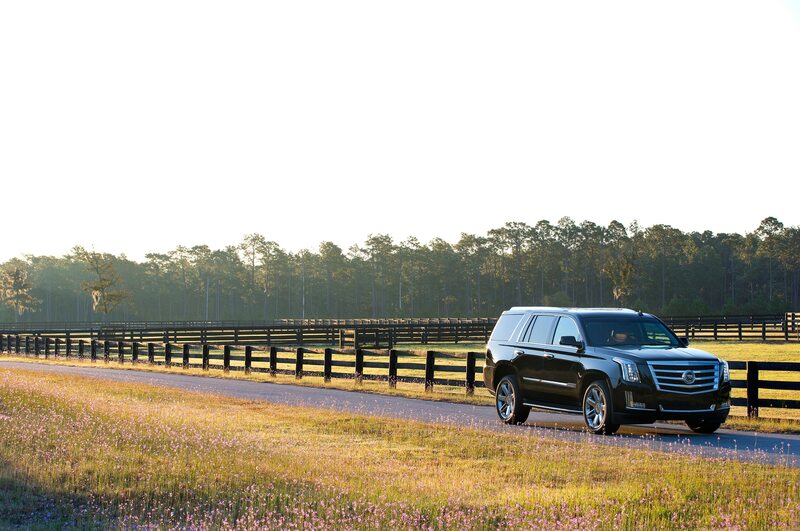 As tested, this Escalade demands an extra $15,960 from buyers than the Navigator. 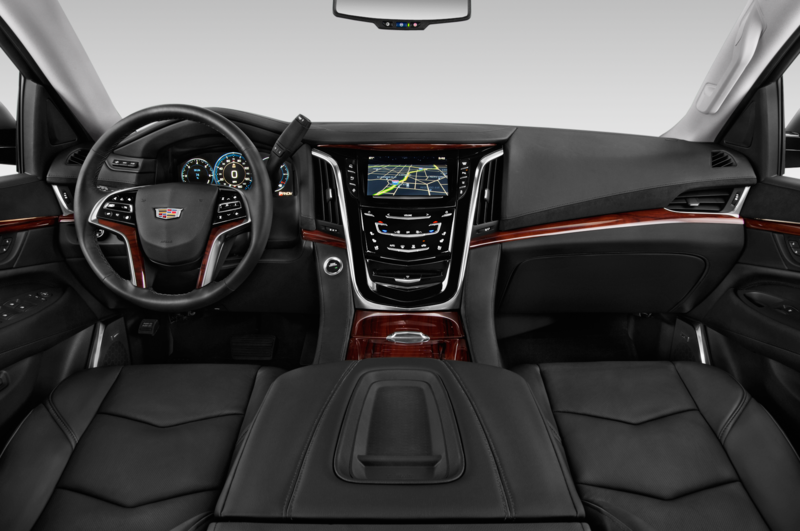 Even at this price level, that’s a big gap — although part of it stems from the fact that the Cadillac had features such as adaptive cruise control and a flip-down DVD player not fitted to the Lincoln. 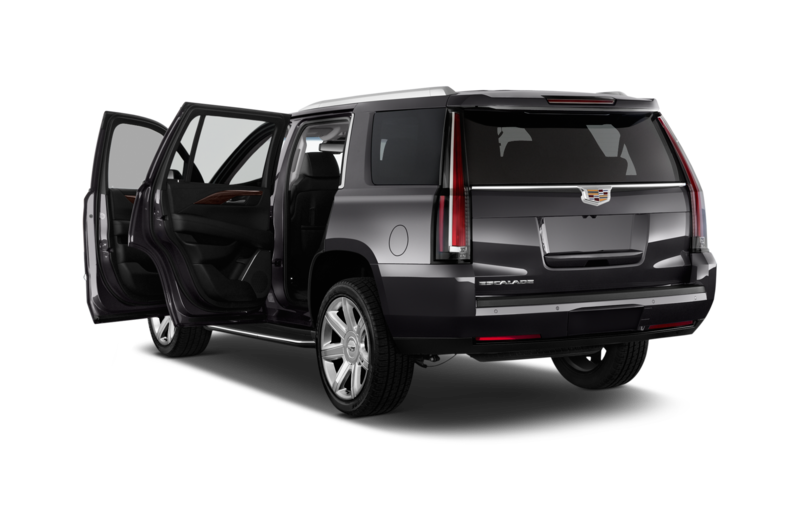 But, ultimately, anyone scrimping and saving to buy a new SUV probably shouldn’t be looking at either of these vehicles. 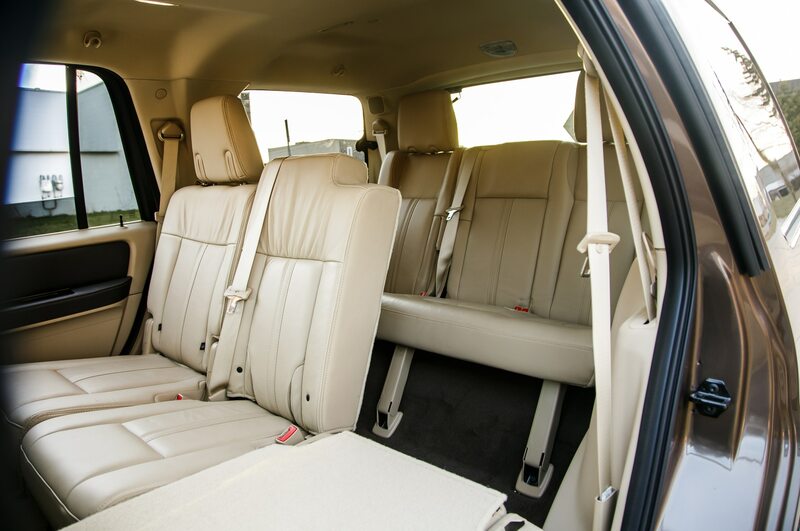 The question is, then, is how much luxury SUV buyers are willing to spend for a more premium experience. 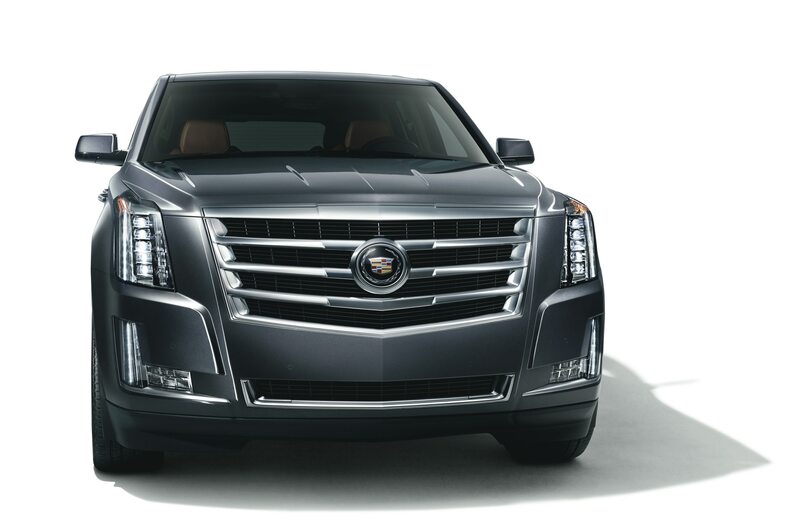 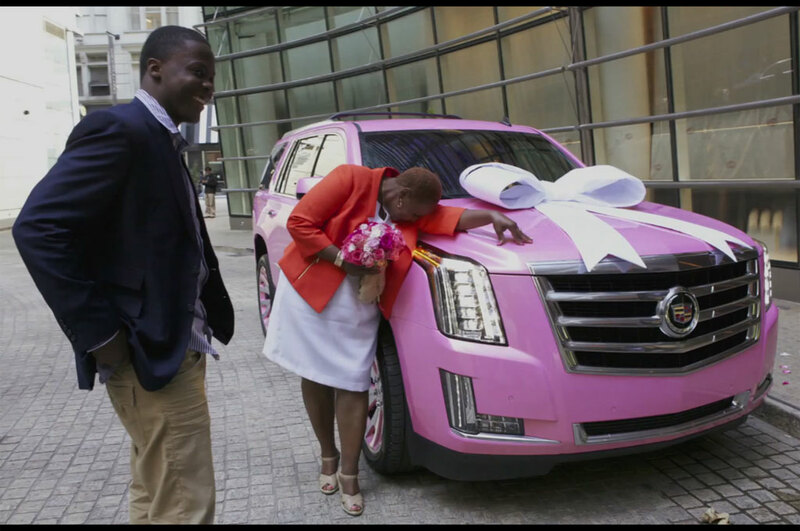 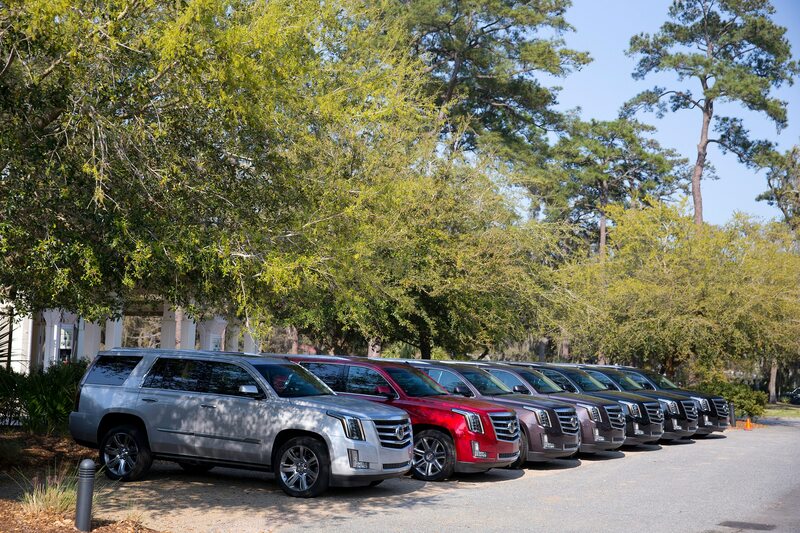 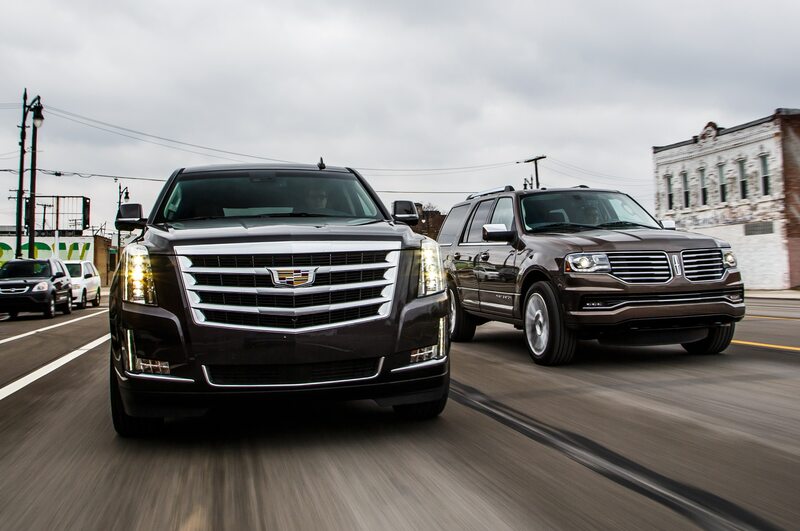 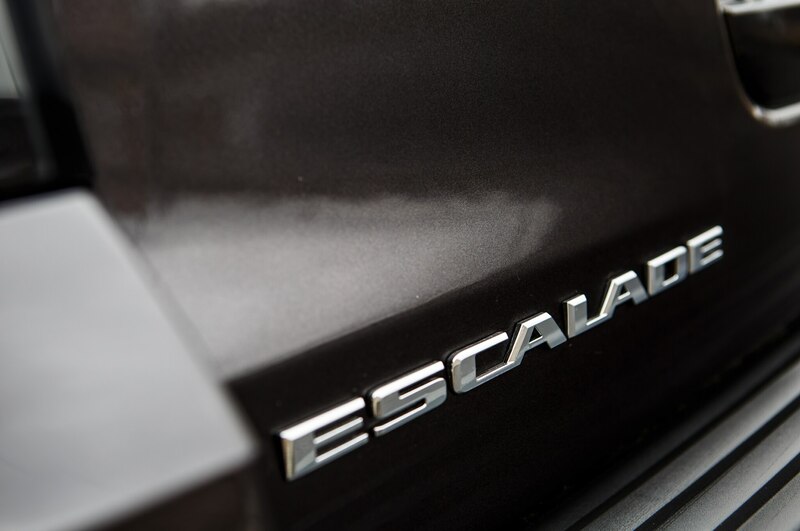 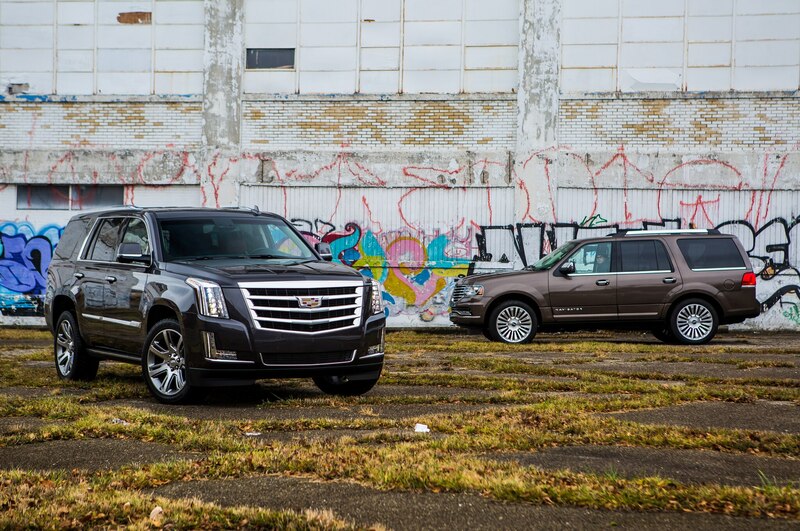 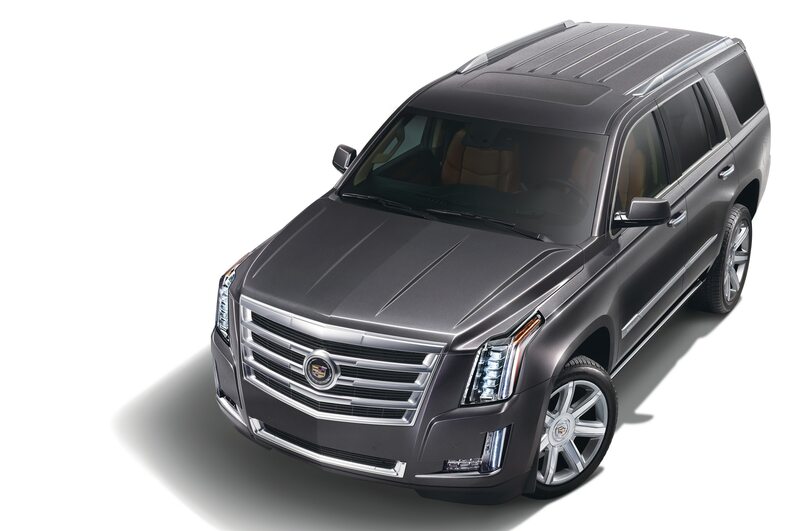 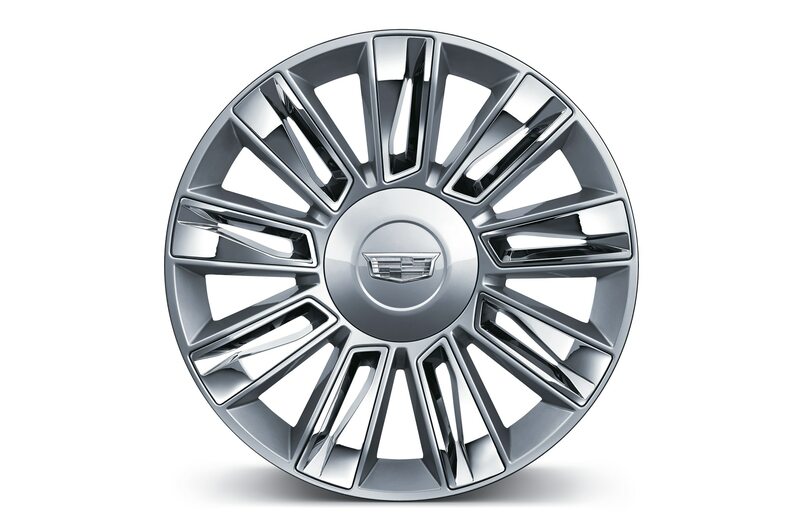 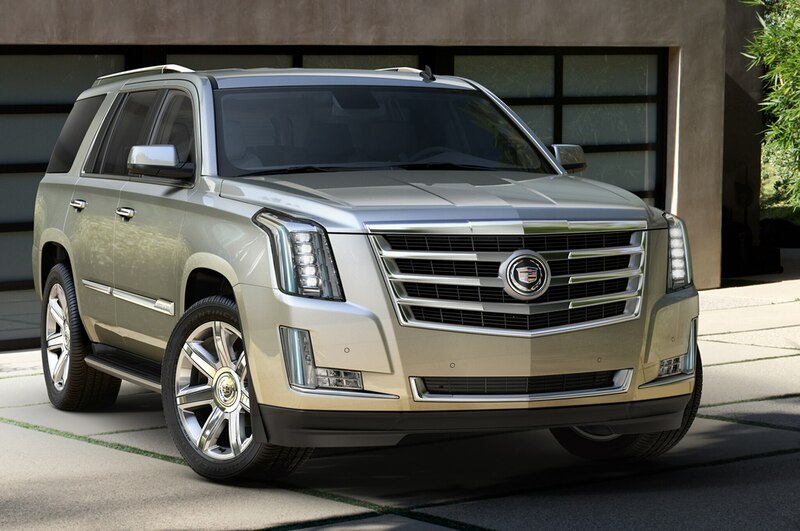 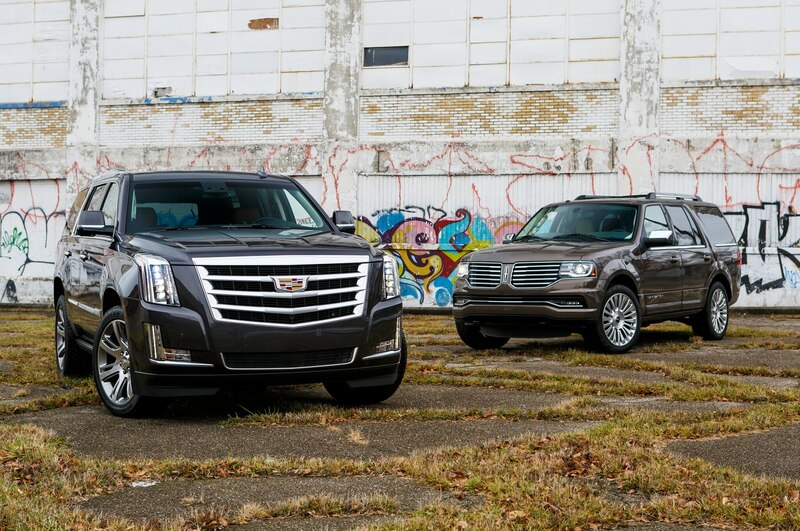 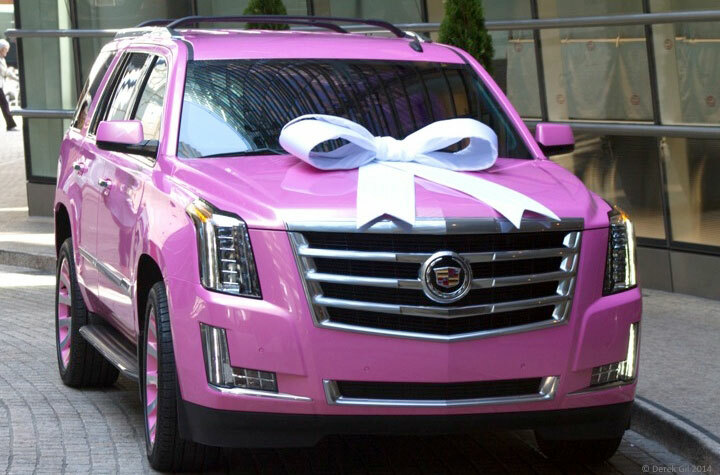 Of this pair, the 2015 Cadillac Escalade attracts the most attention. 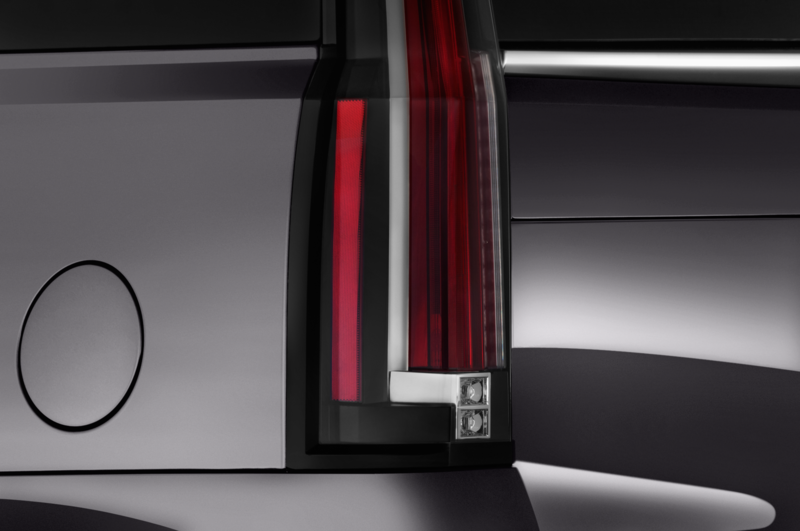 Its tidy, creased sheetmetal and elegant lighting stand out from the crowd. 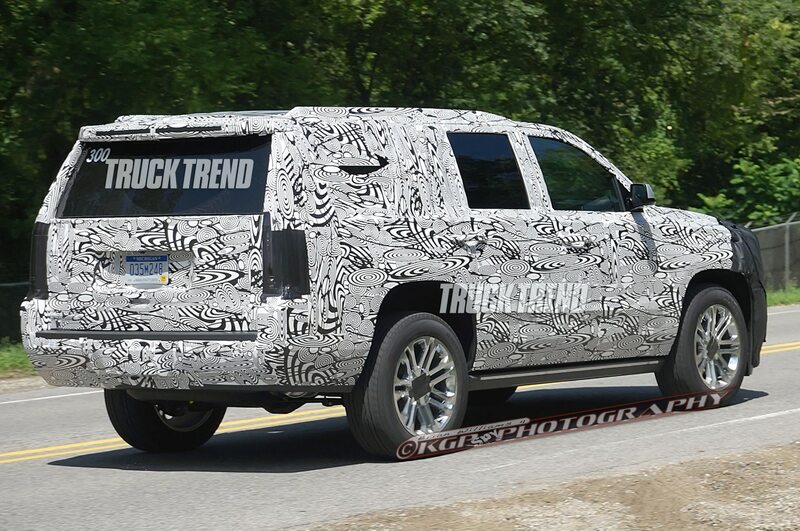 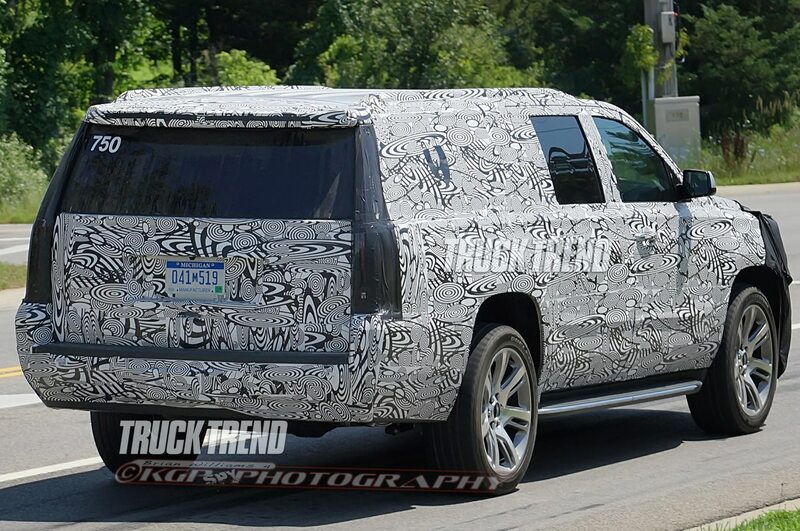 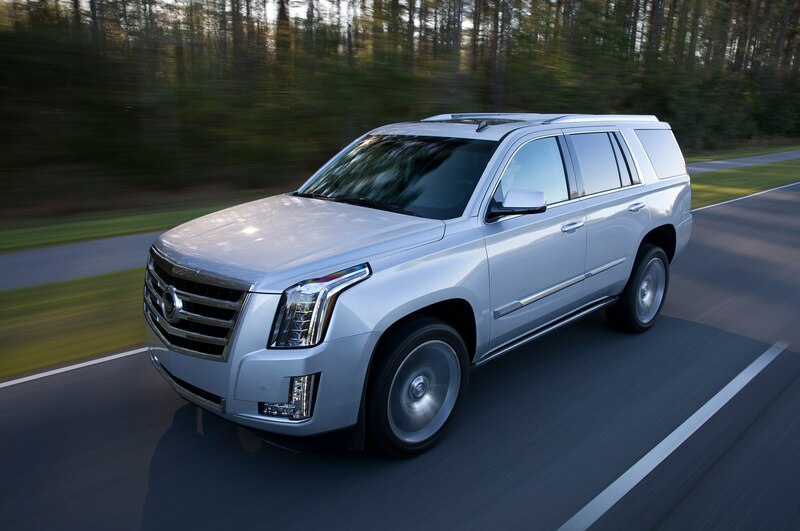 It’s a modern take on what it means to build a big, boxy SUV, and the taut lines make the new Escalade look leaner and smaller than its measurements suggest. 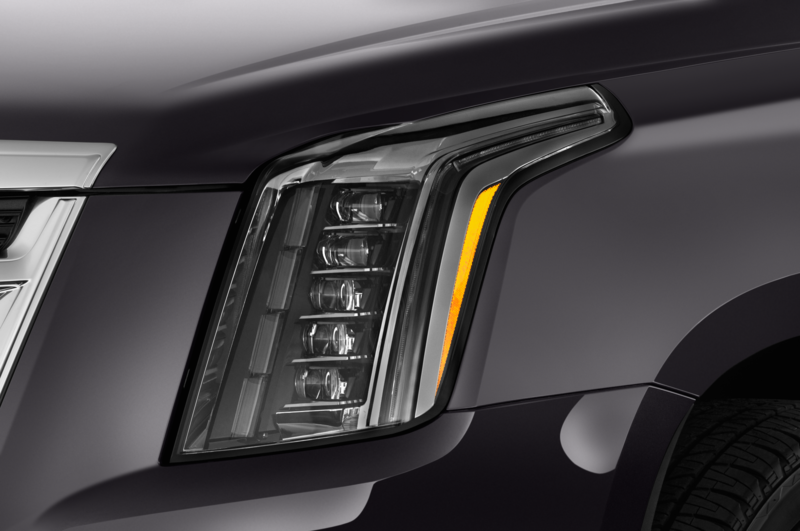 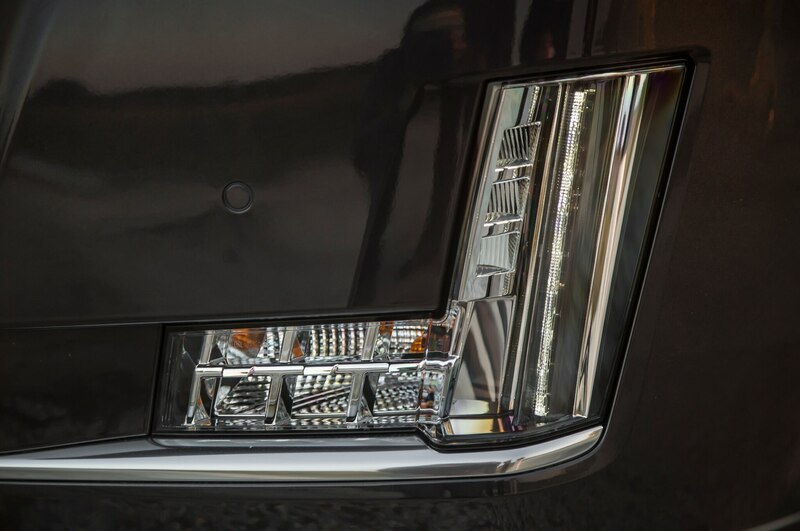 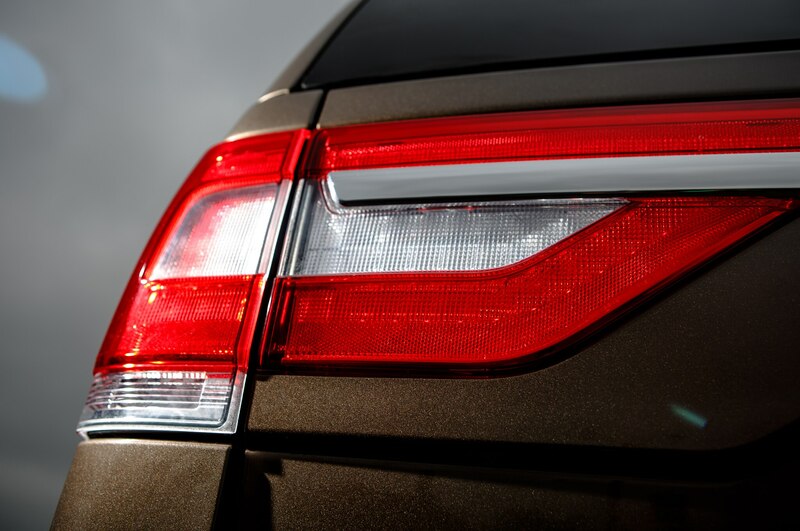 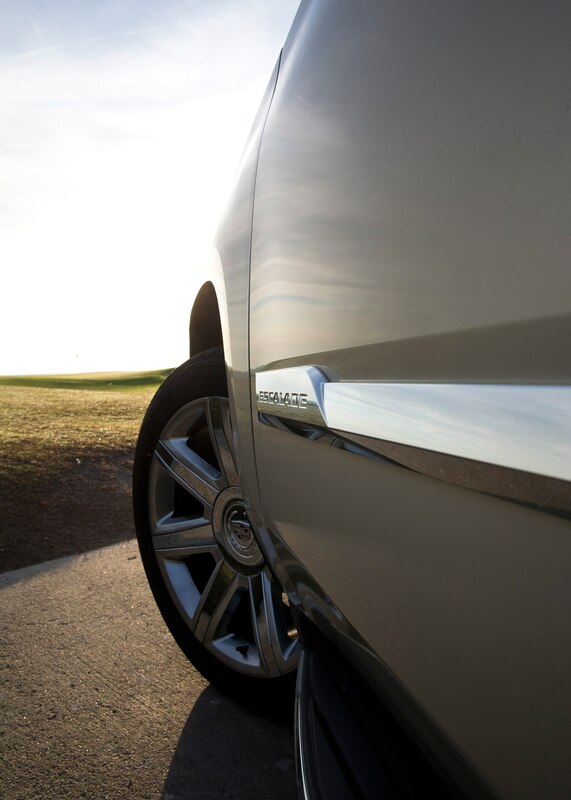 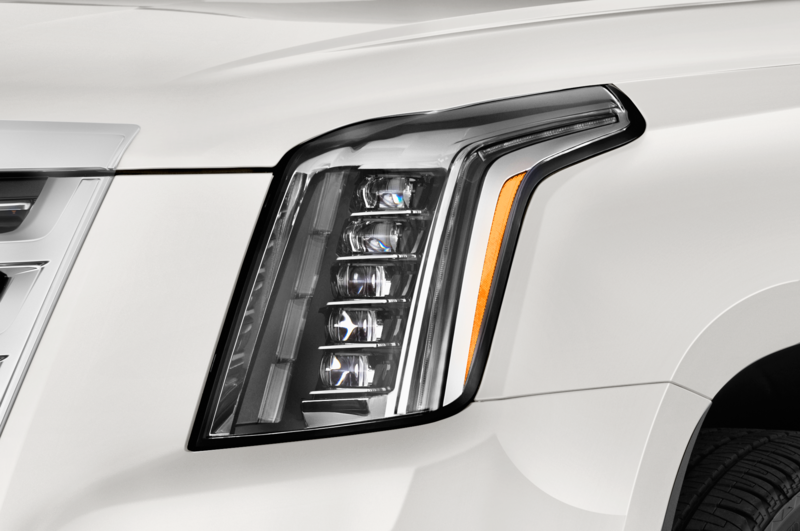 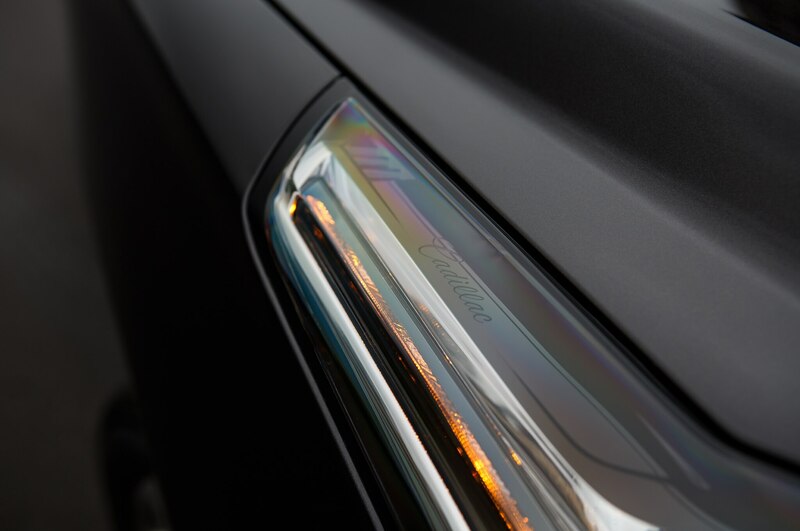 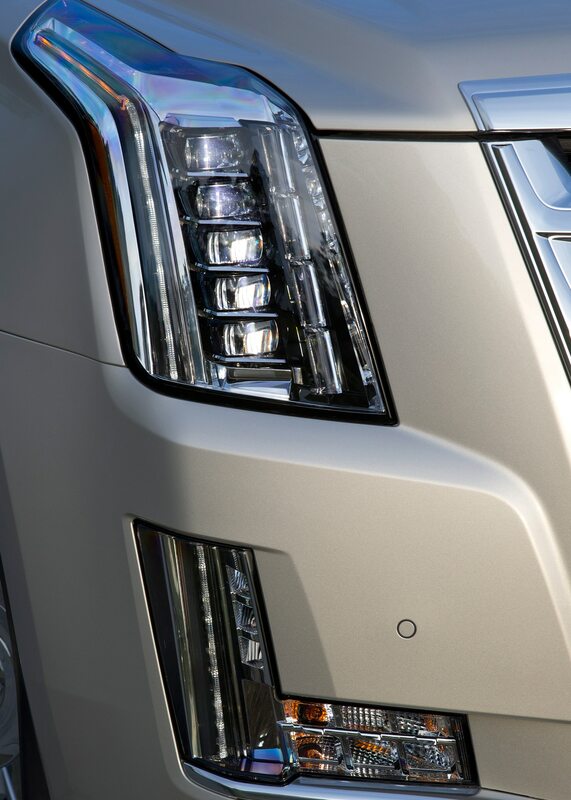 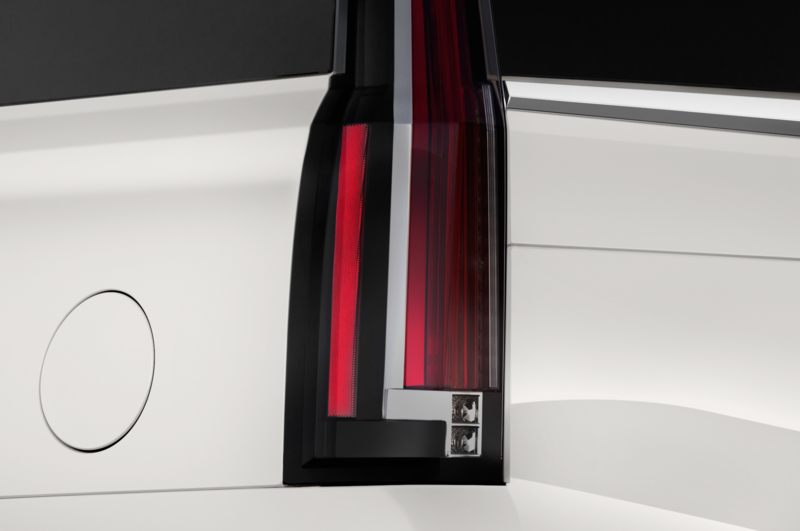 With LED lighting front and rear, it’s easy to pick the Caddy out of the sea of crossovers in traffic. 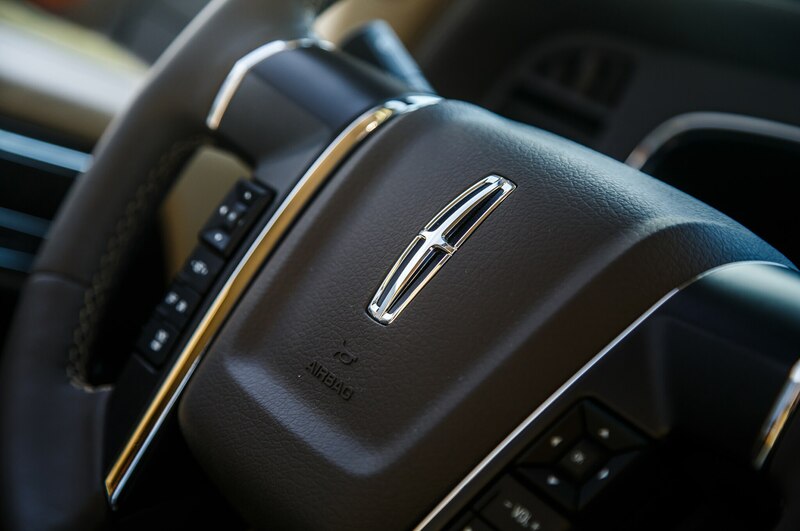 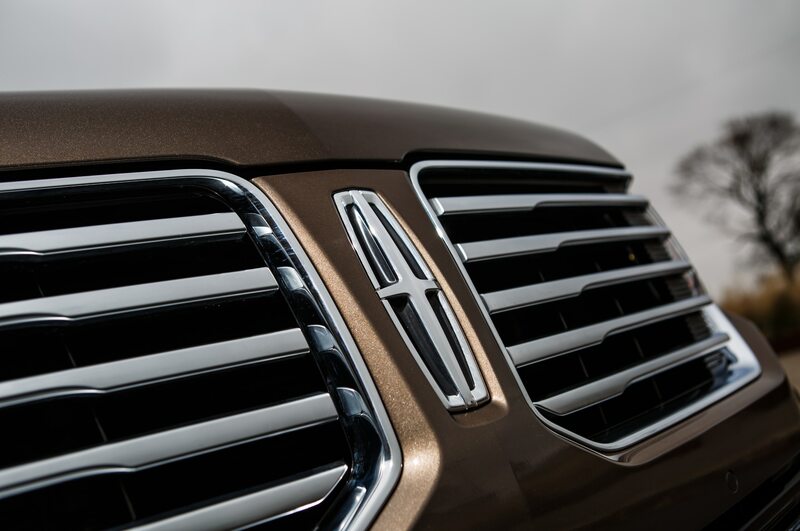 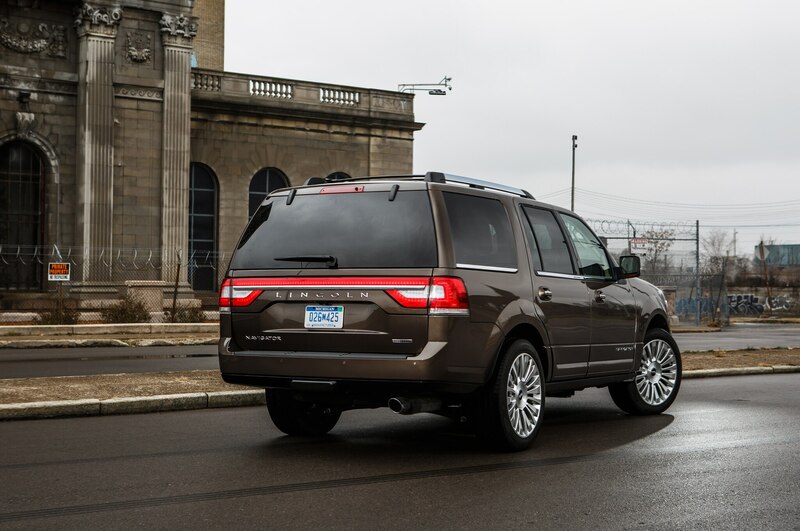 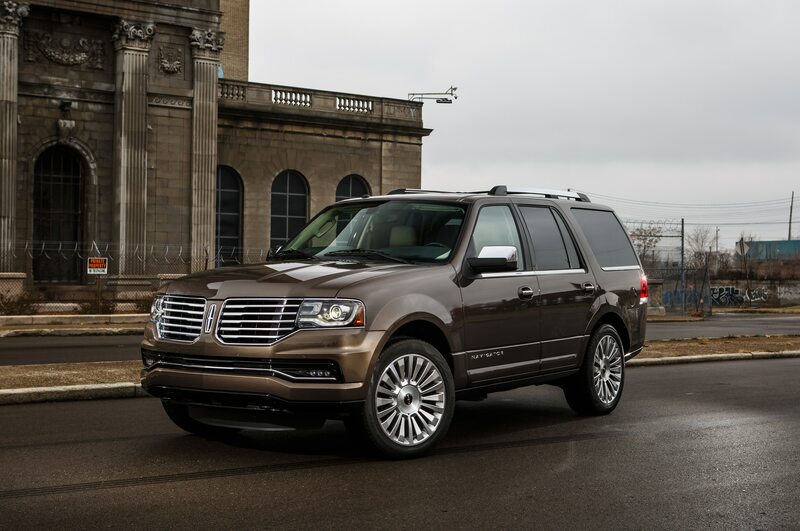 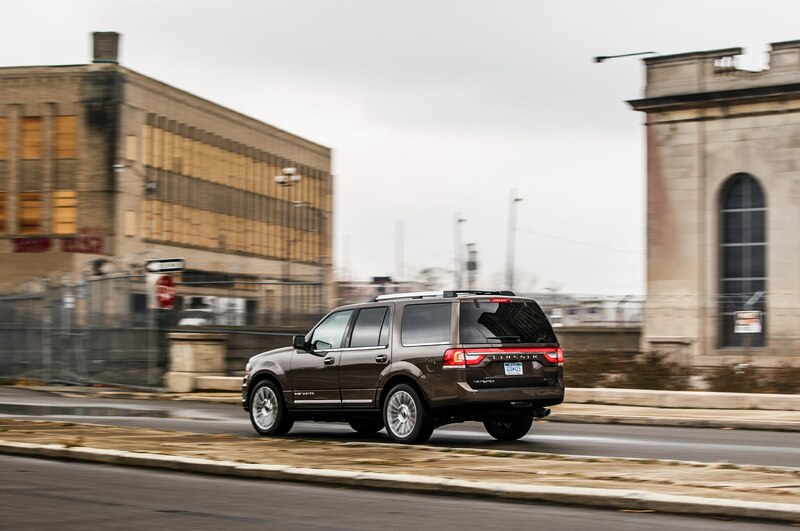 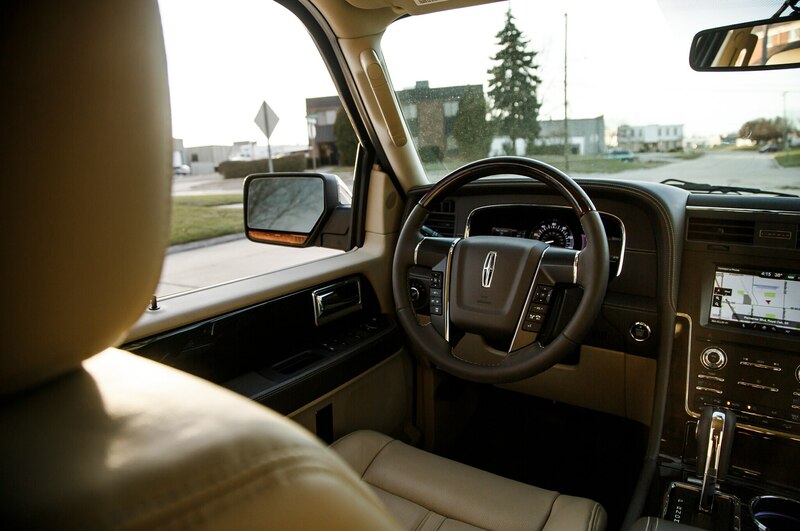 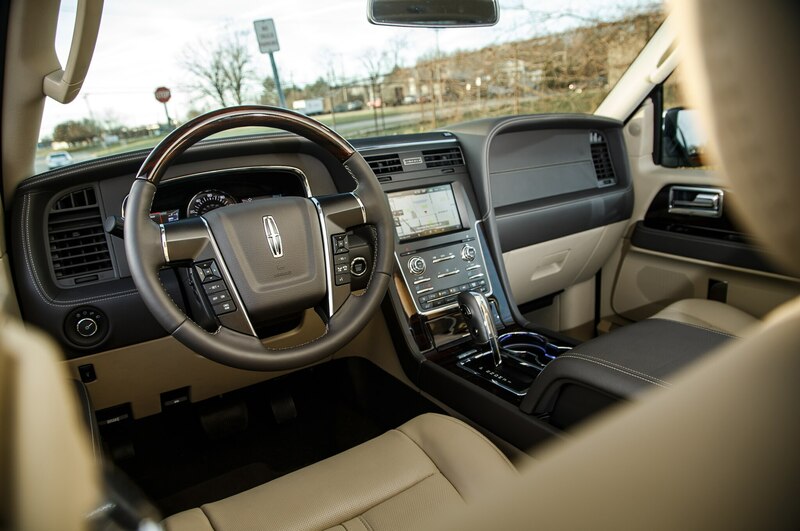 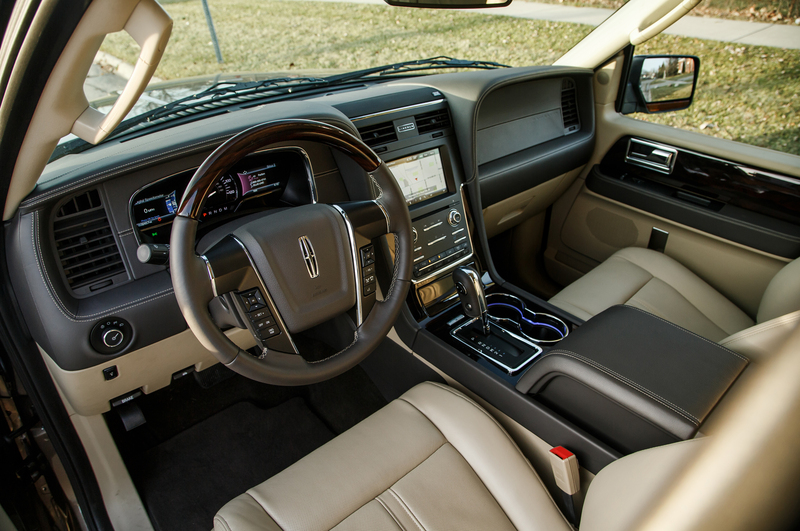 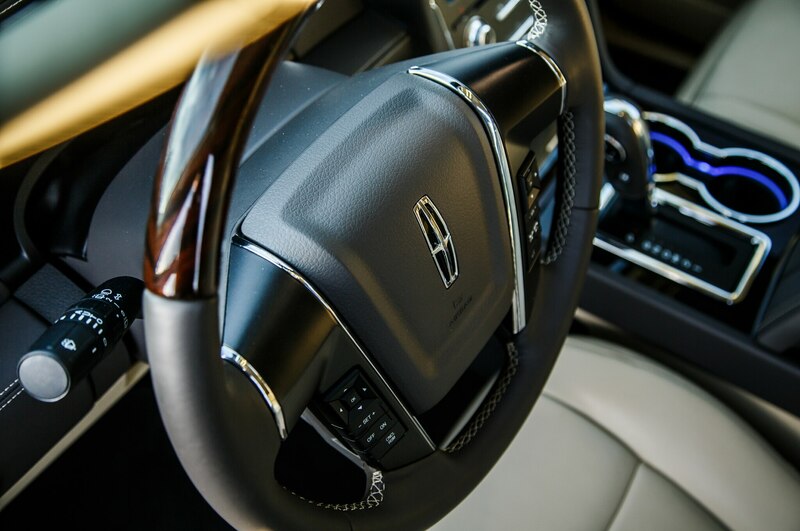 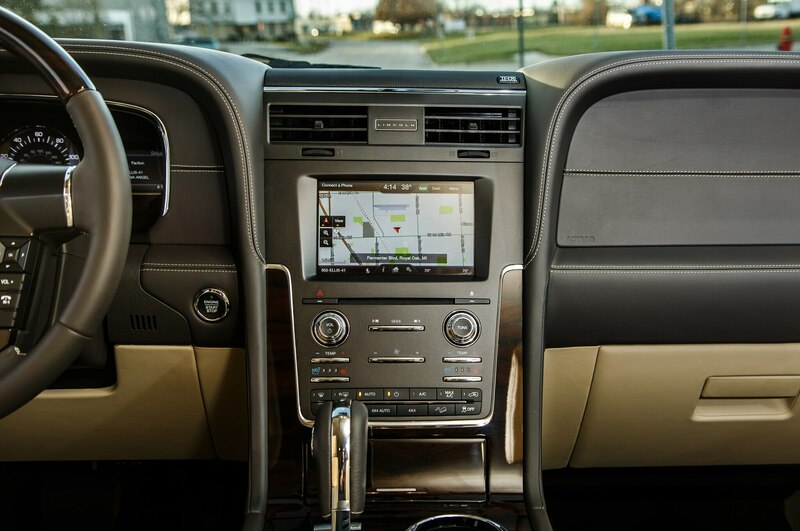 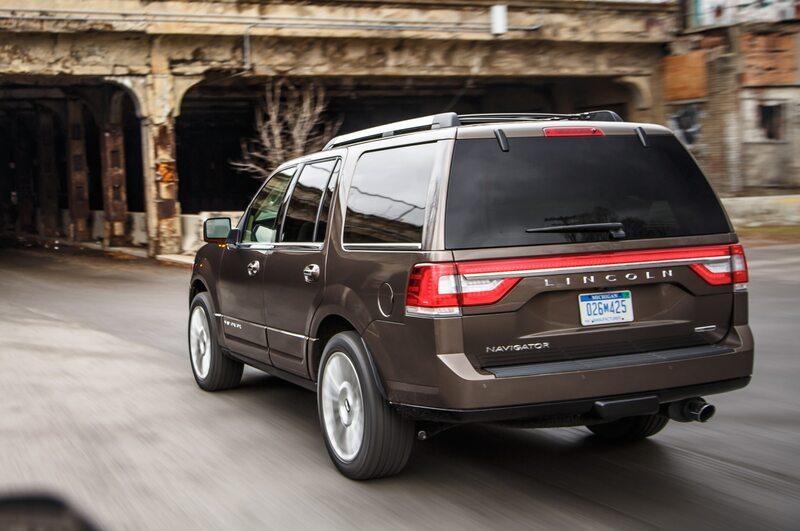 The 2015 Lincoln Navigator, on the other hand, could be any Navigator from years past. 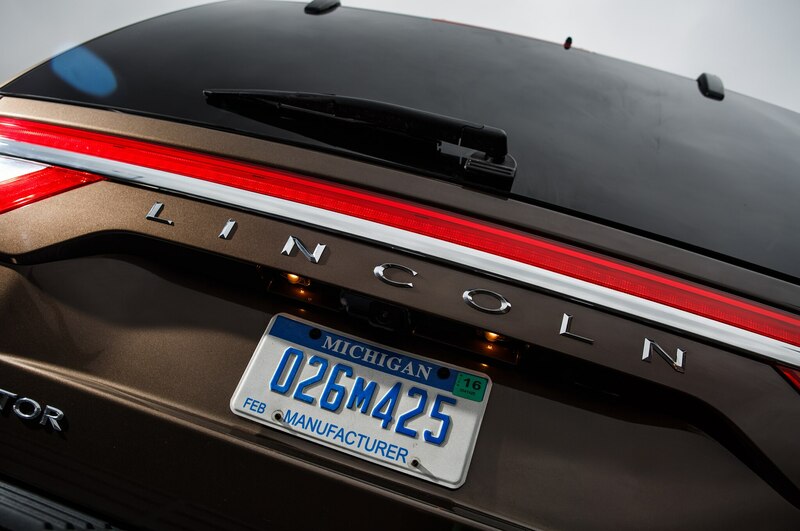 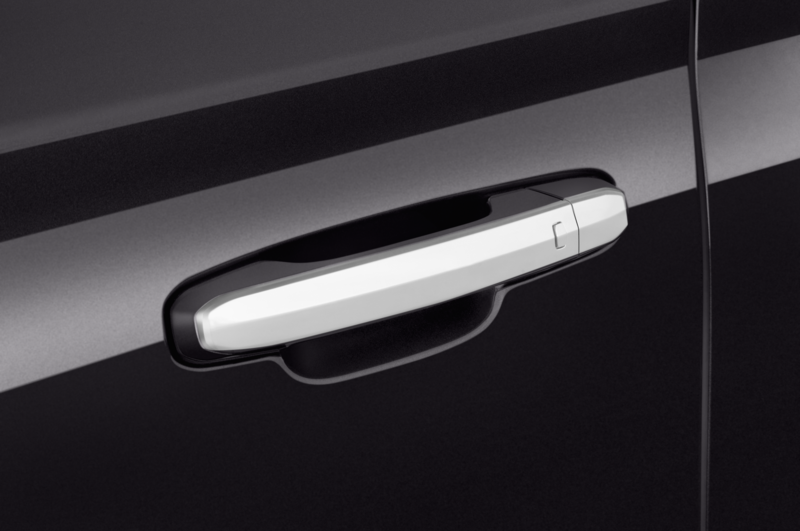 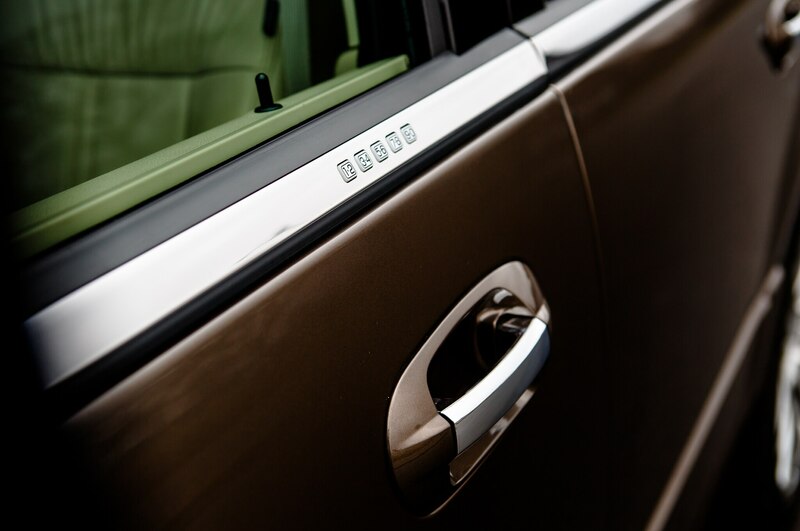 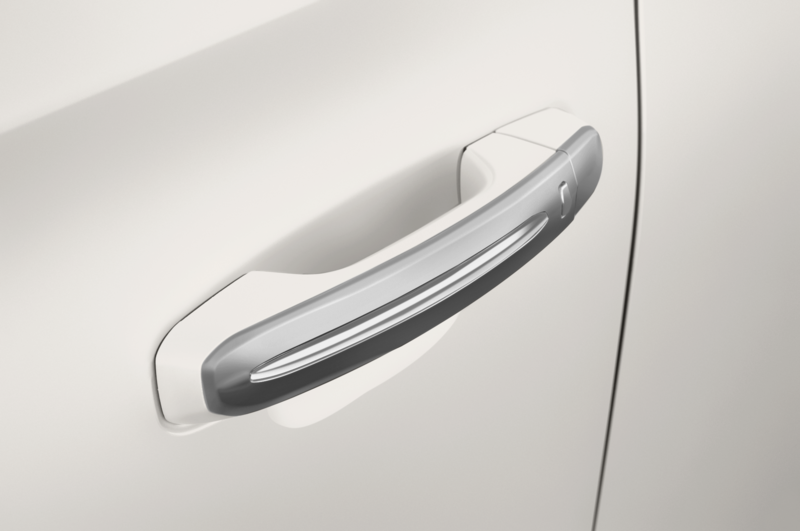 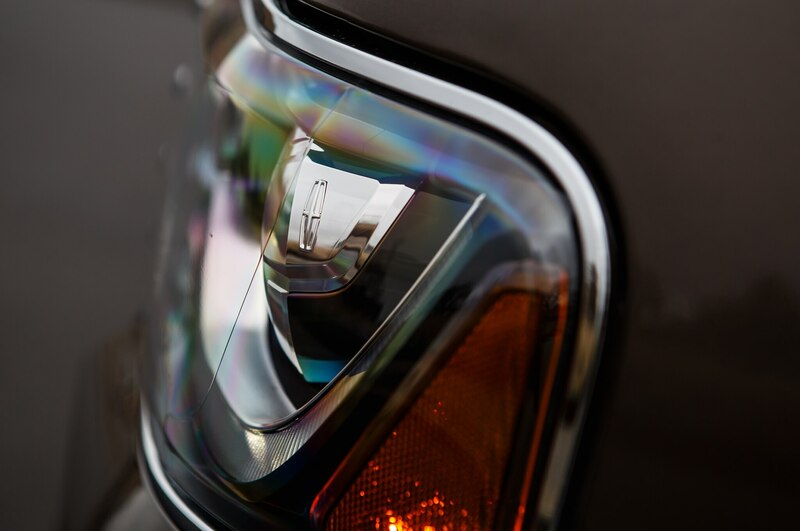 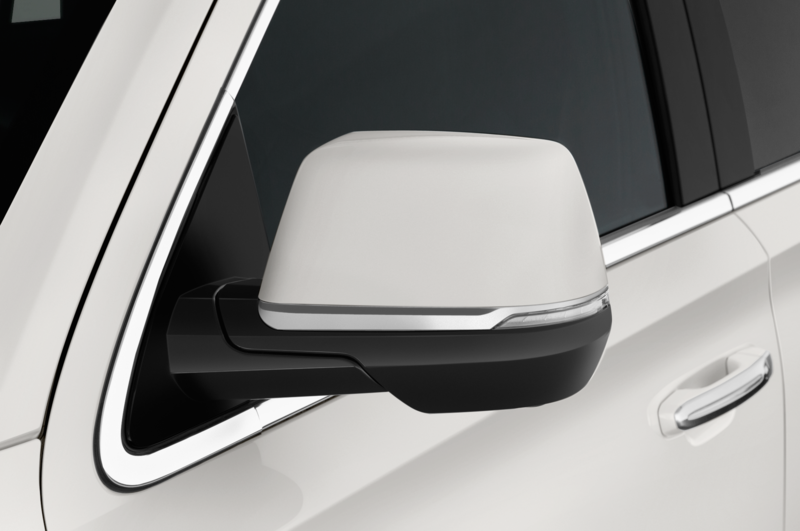 Though there’s a new split-wing chrome grille up front and reshaped lighting on the liftgate, little has changed compared to when Lincoln first entered the luxury SUV game. 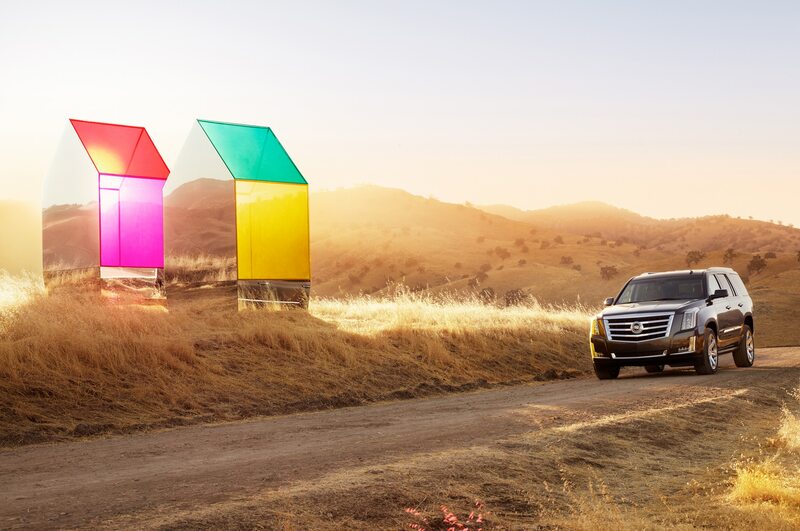 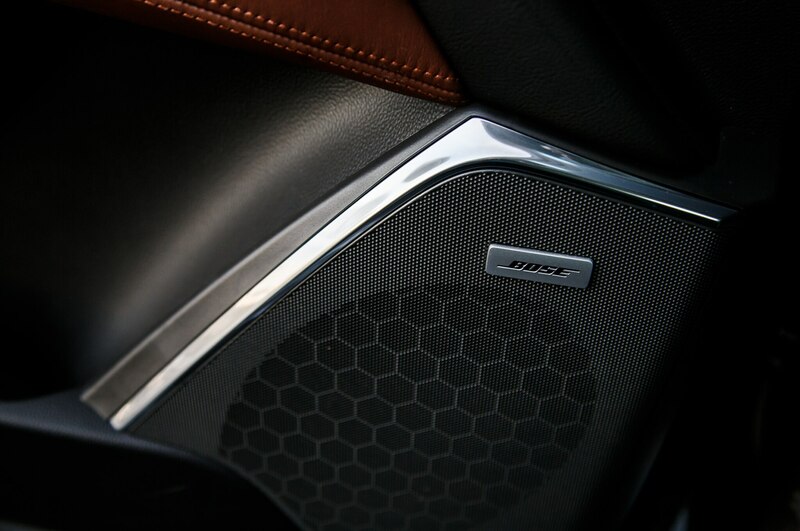 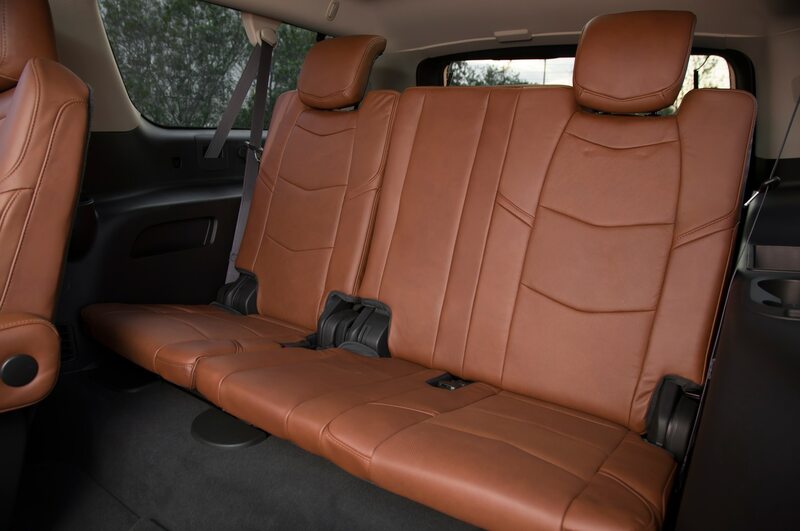 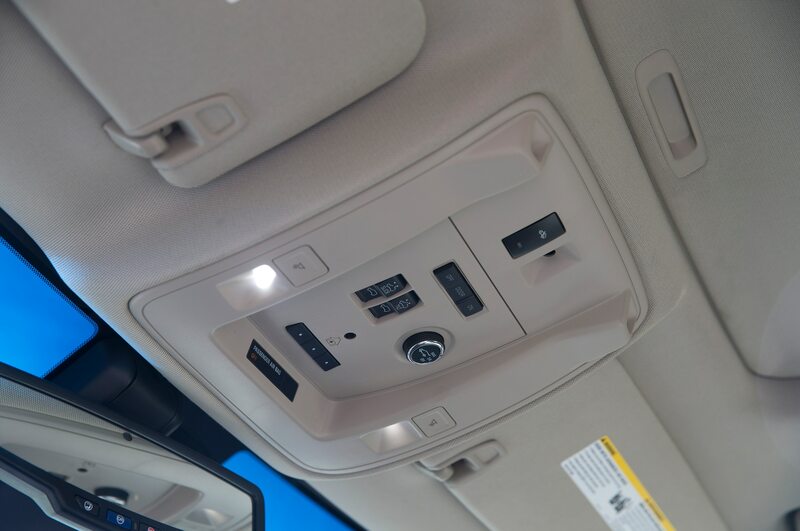 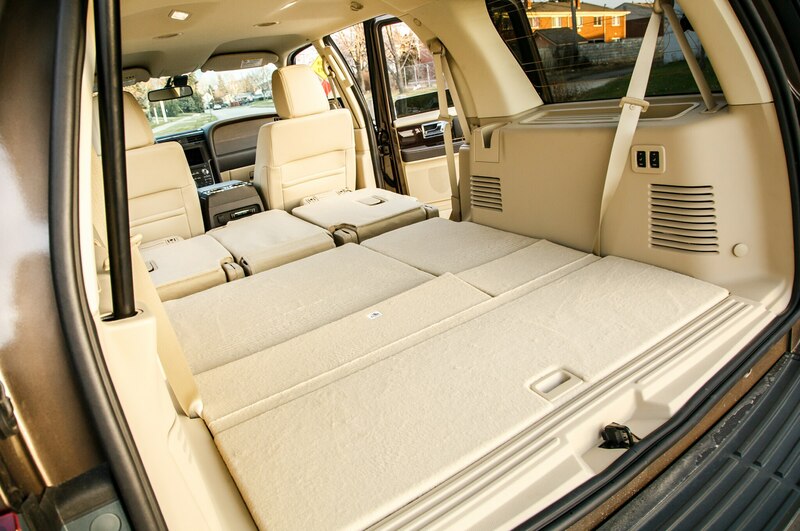 It’s an indubitably stylish vehicle, but there’s not much more curb appeal than in a loaded-up Ford Expedition. 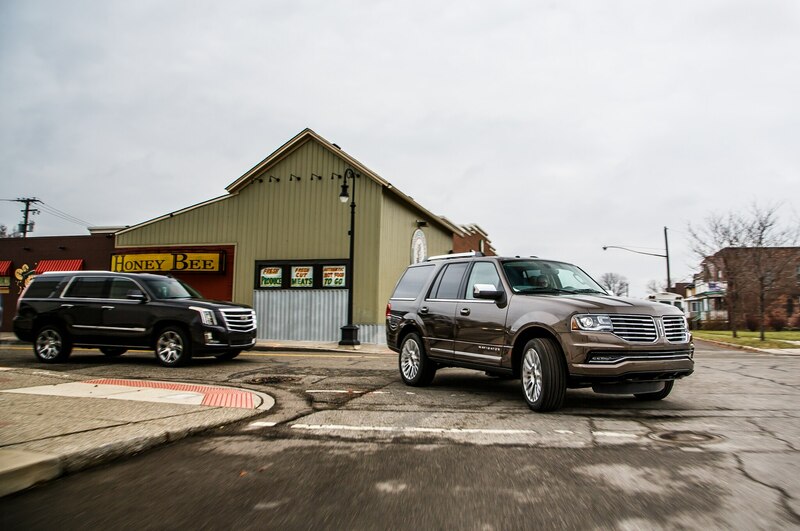 The ’15 Navigator is a reheated version of last year’s model while the Escalade is brand new, and the age difference shows. 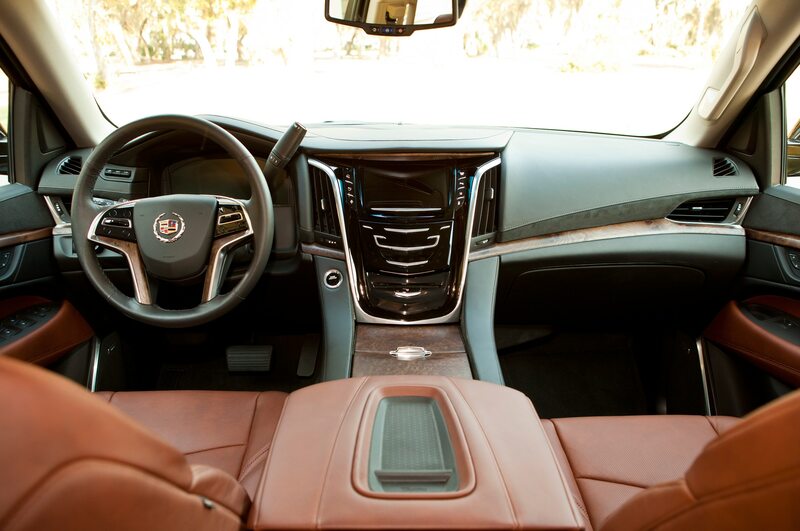 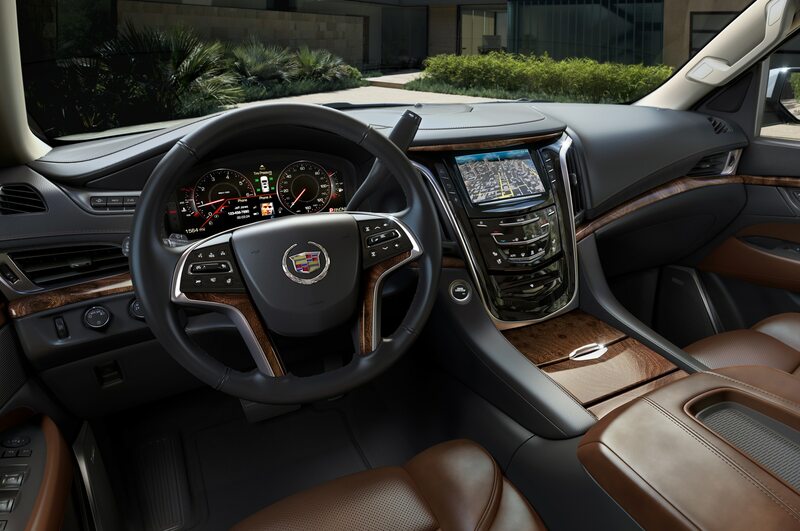 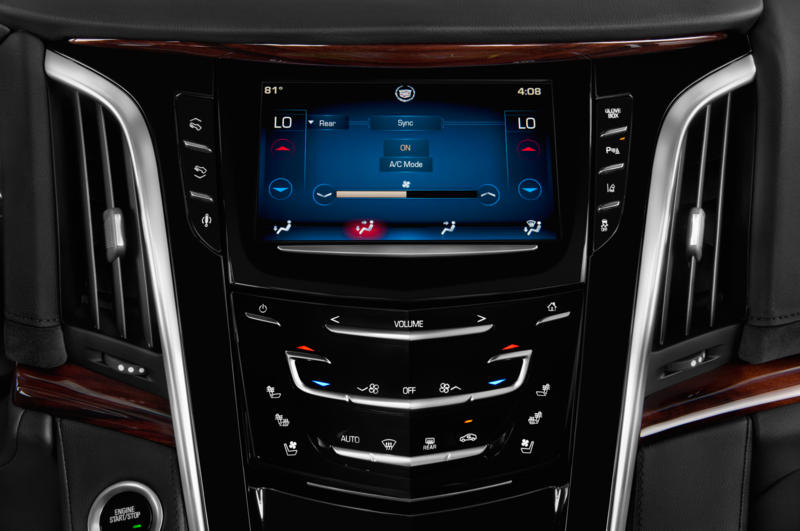 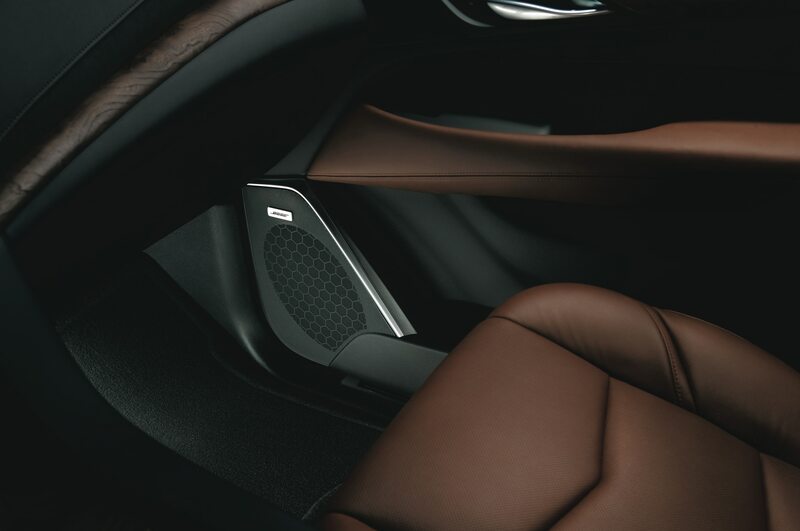 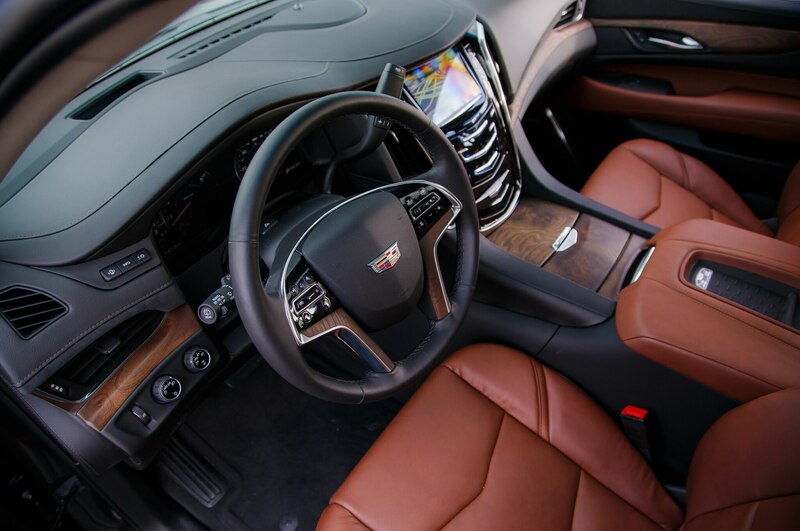 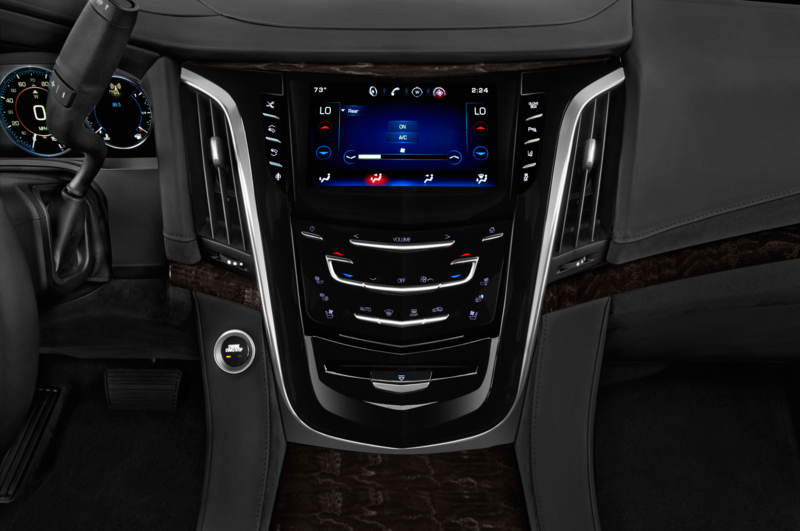 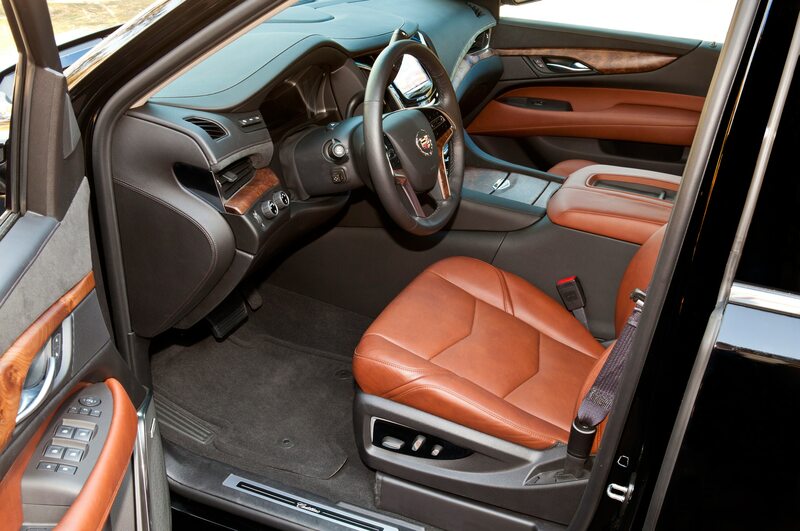 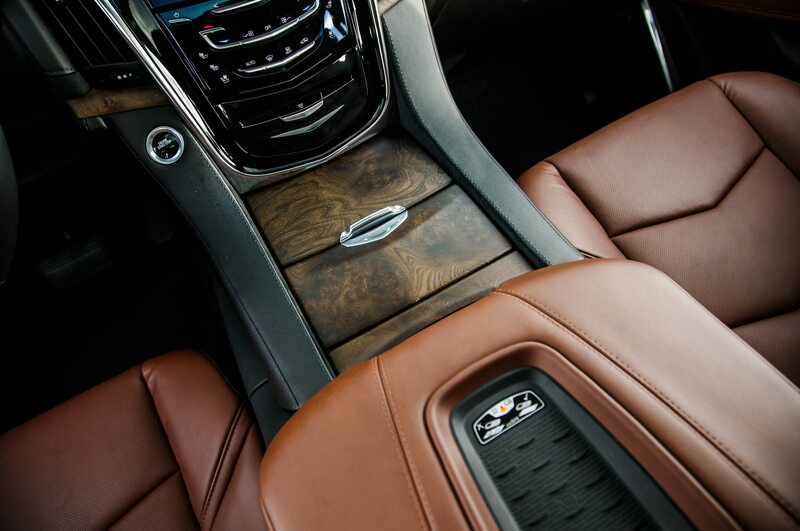 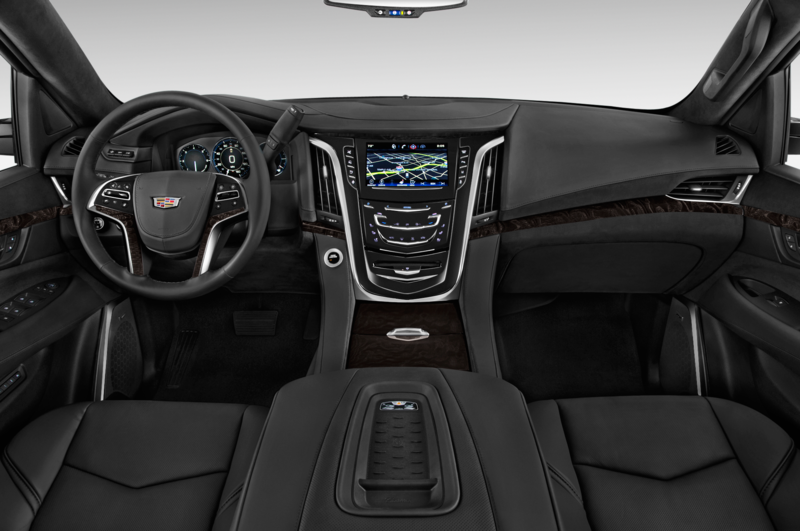 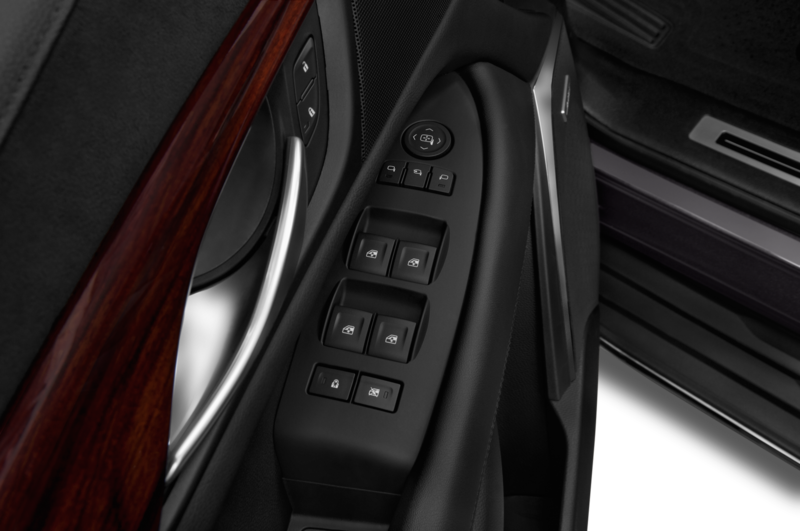 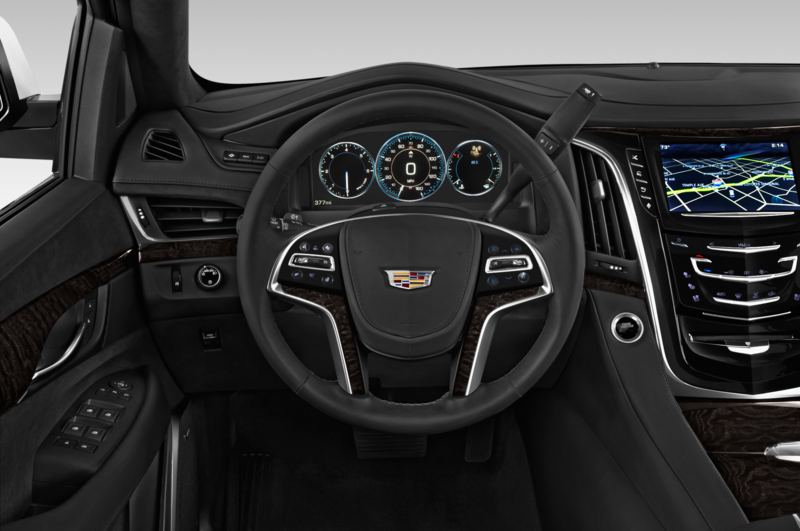 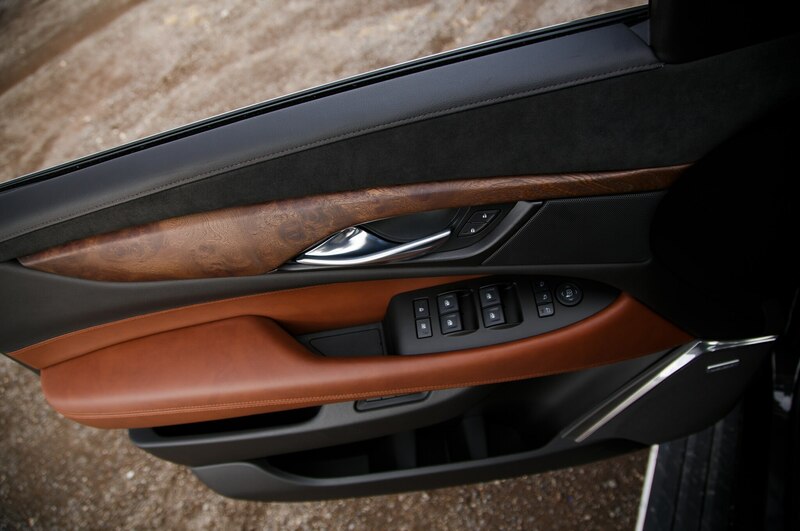 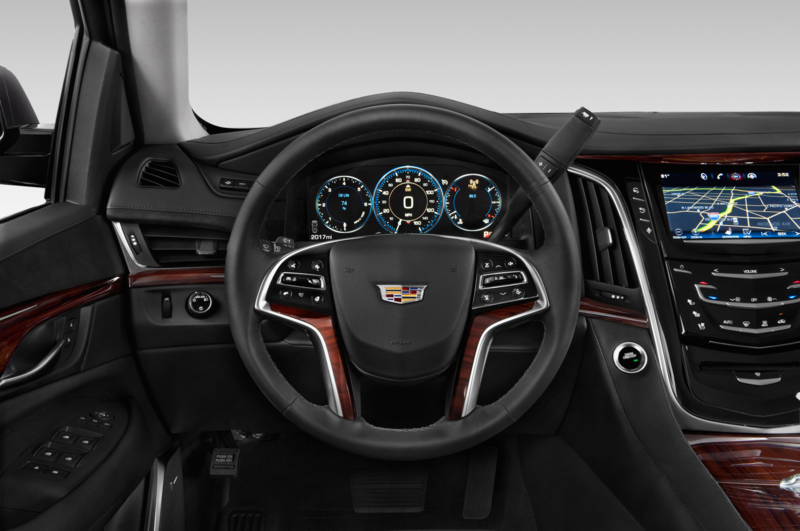 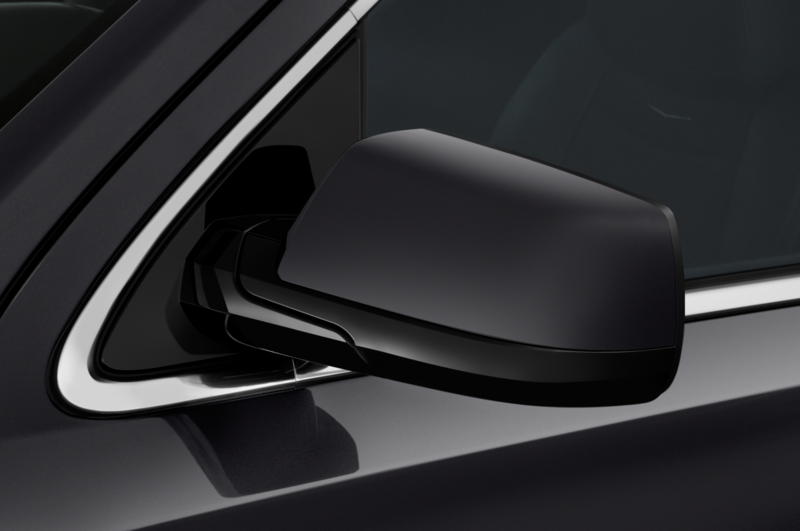 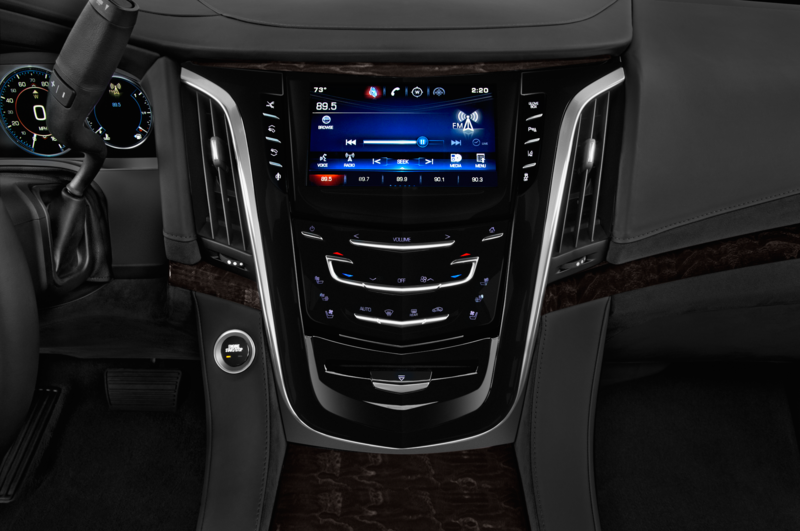 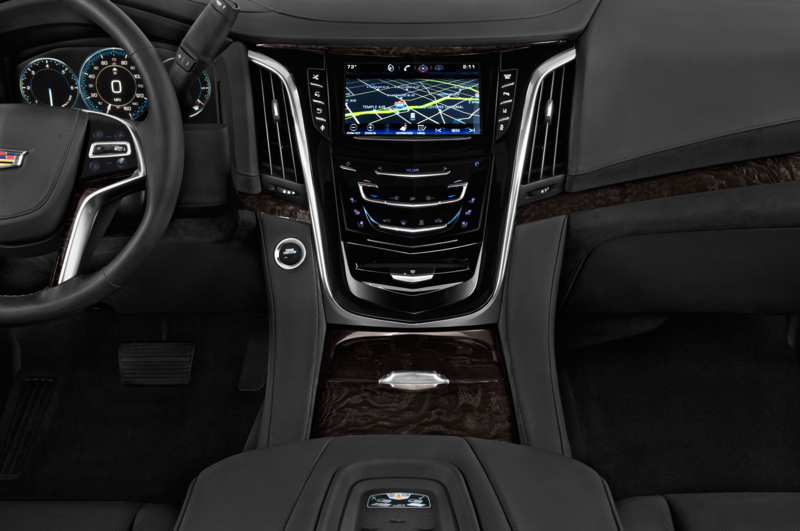 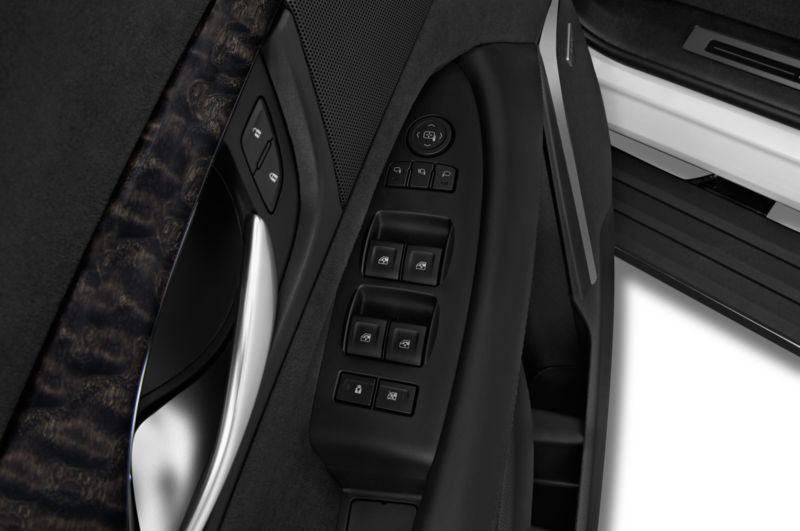 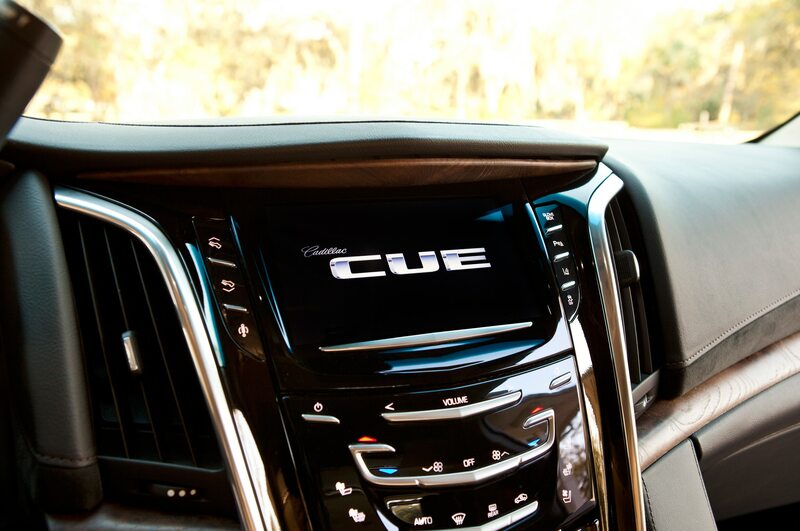 That’s also the case inside, where Cadillac’s matte wood and leather upholstery shout “luxury car.” The full-LCD instrument cluster can be reconfigured in countless ways, and all the physical switchgear is solid to the touch. 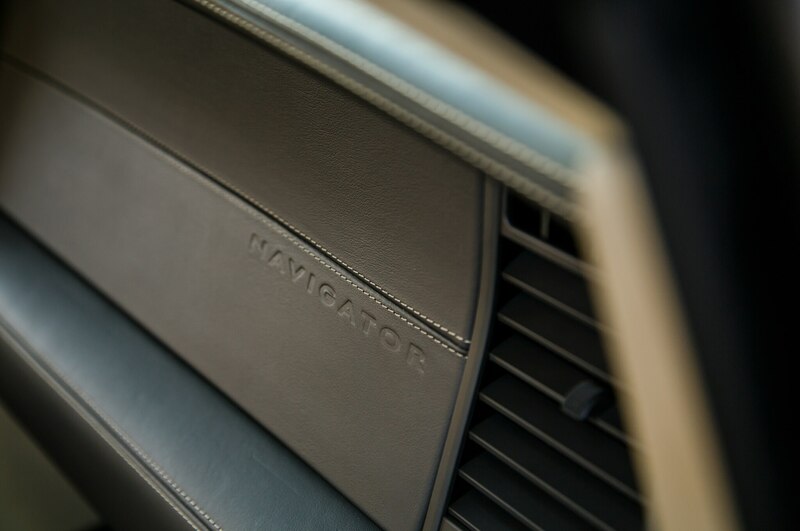 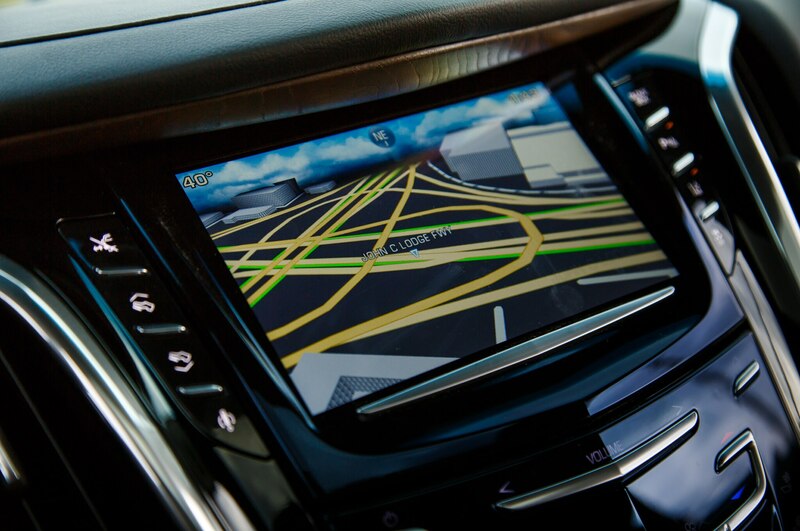 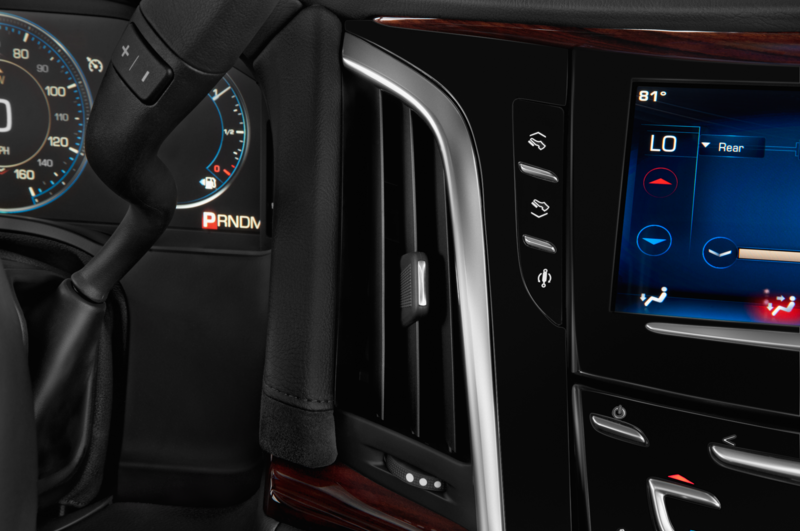 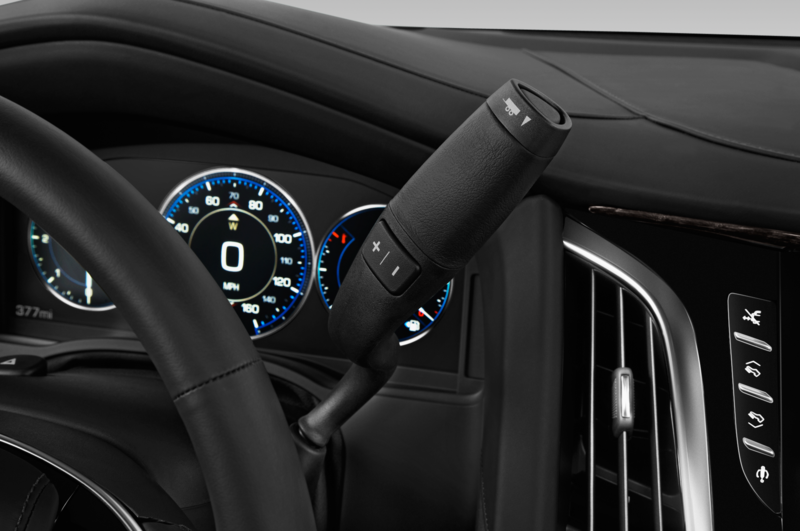 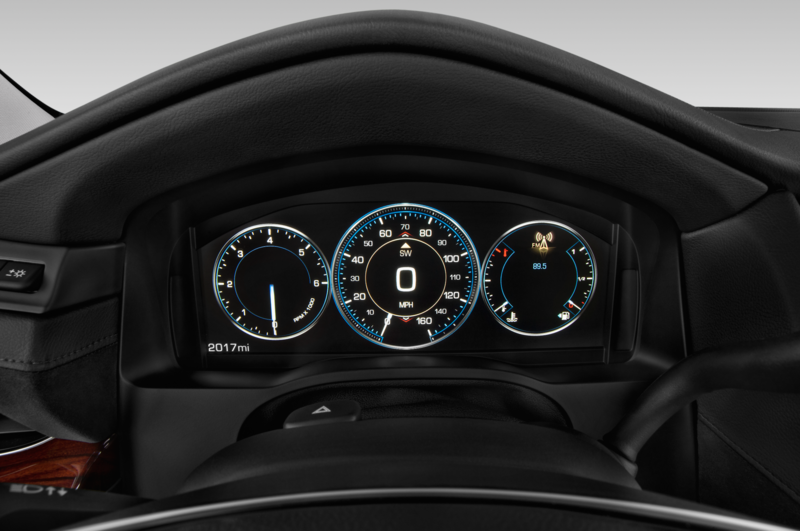 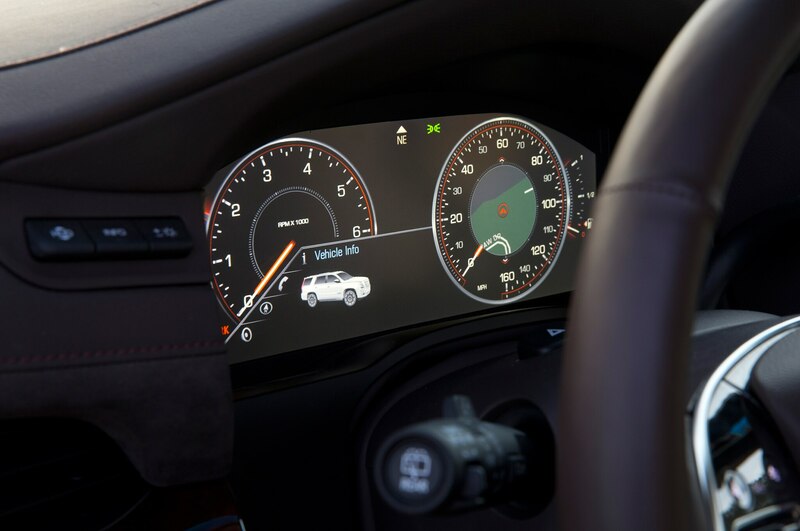 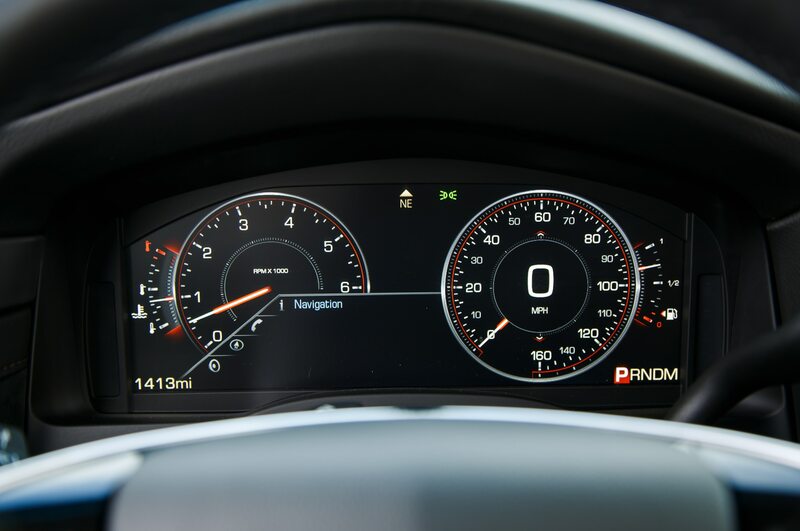 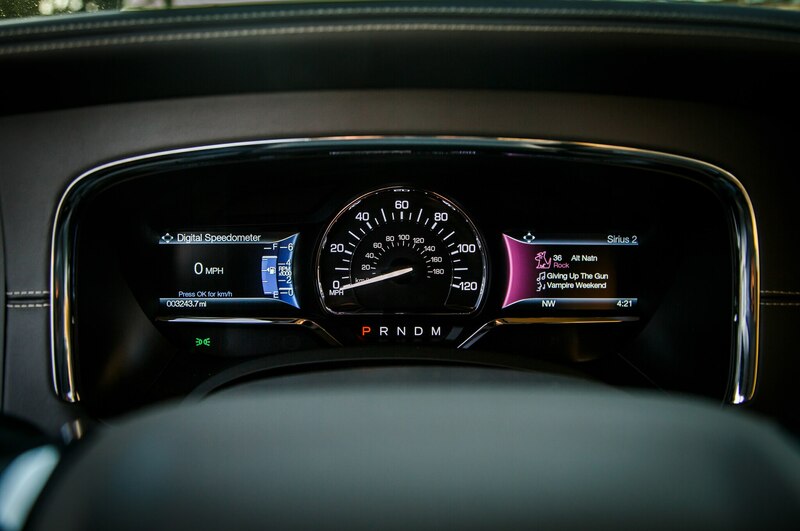 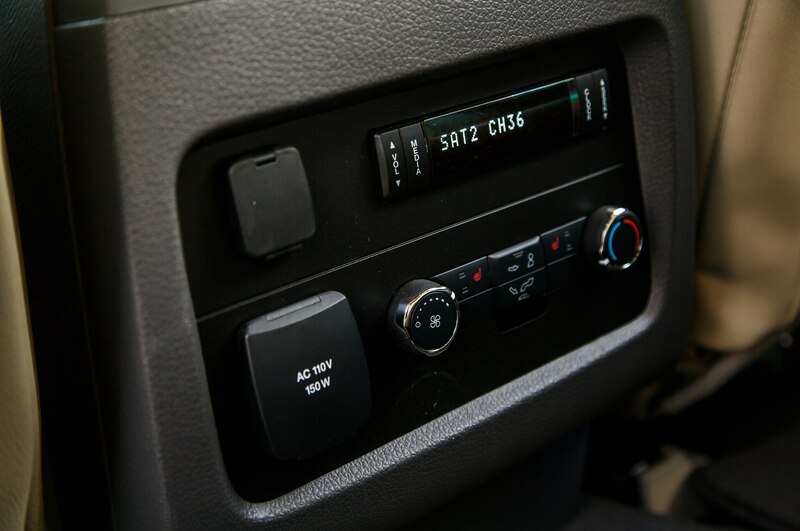 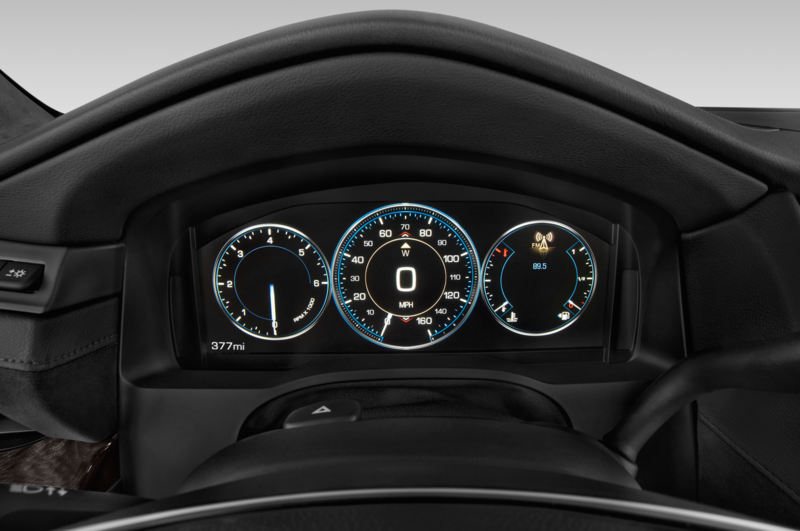 Navigator drivers face a tiny analog speedometer sandwiched within a small color display. 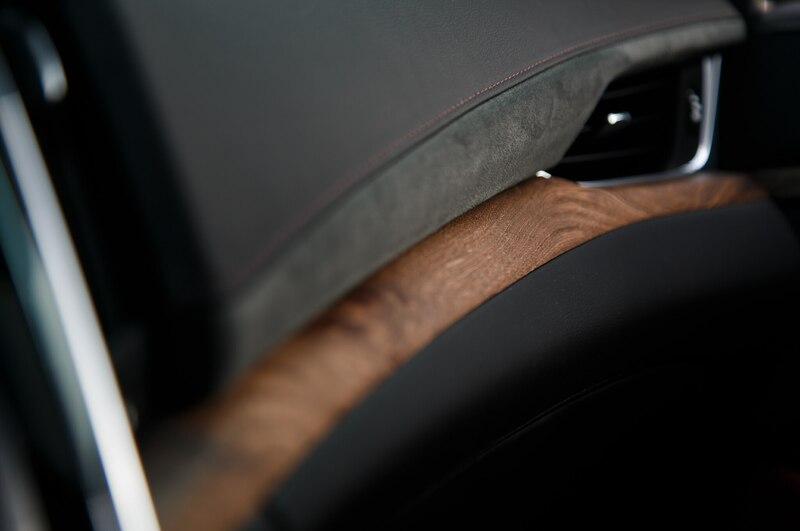 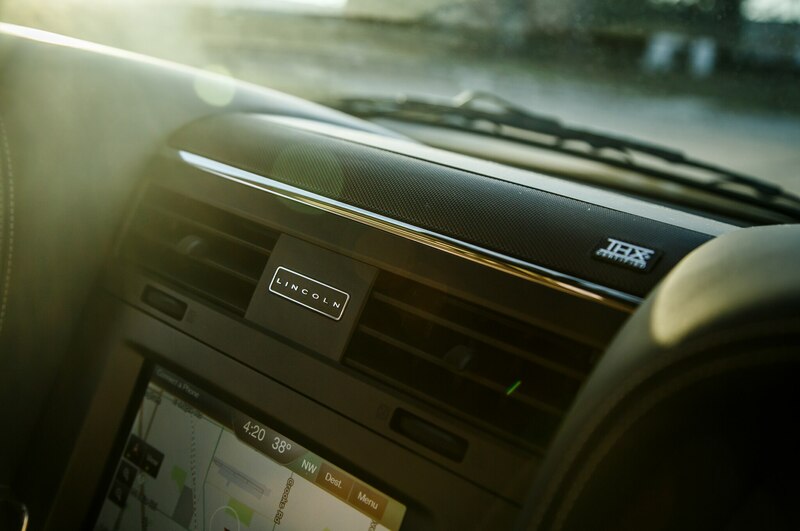 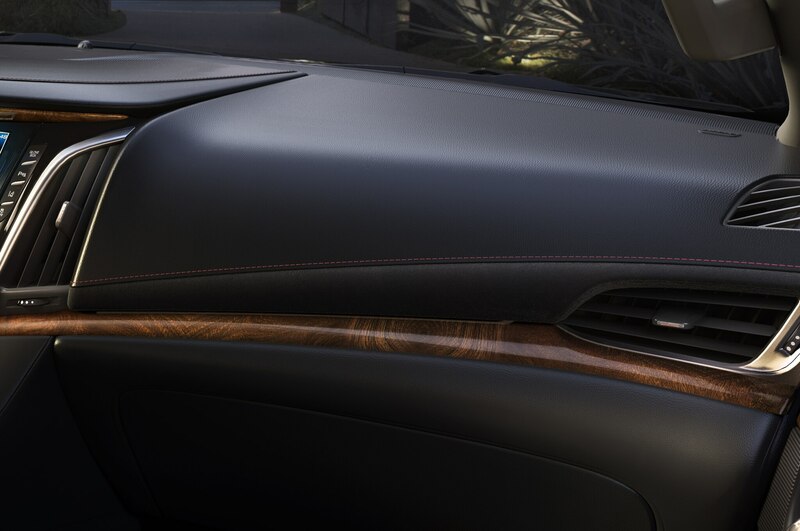 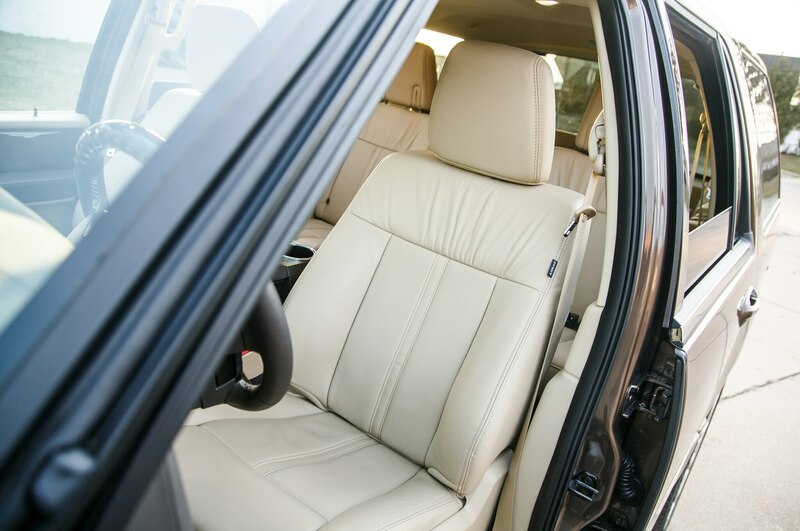 Prominent protrusions from the dashboard create an interesting shape, and leather and wood are available, but mostly this interior is plain and dated. 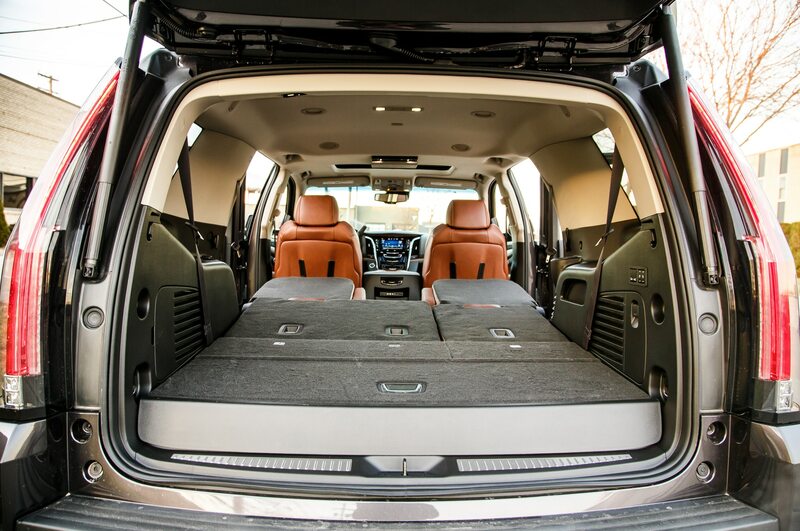 The most compelling practical reason for buying these big SUVs versus smaller offerings is the amount of room in the third row. 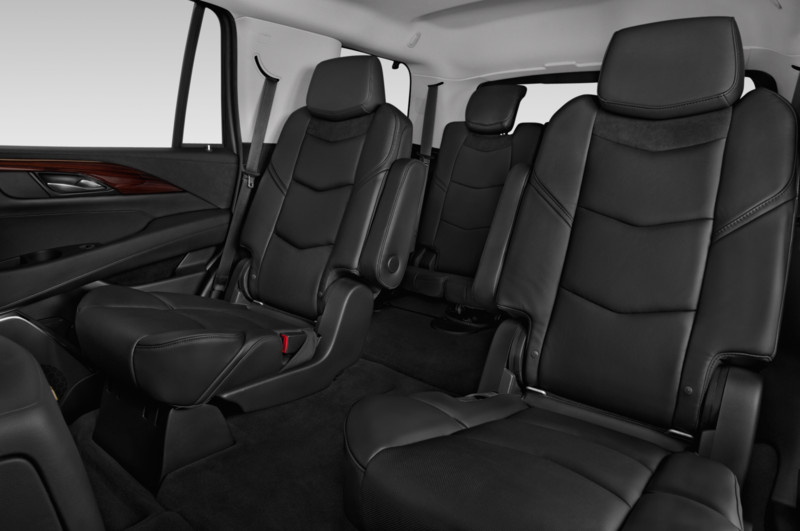 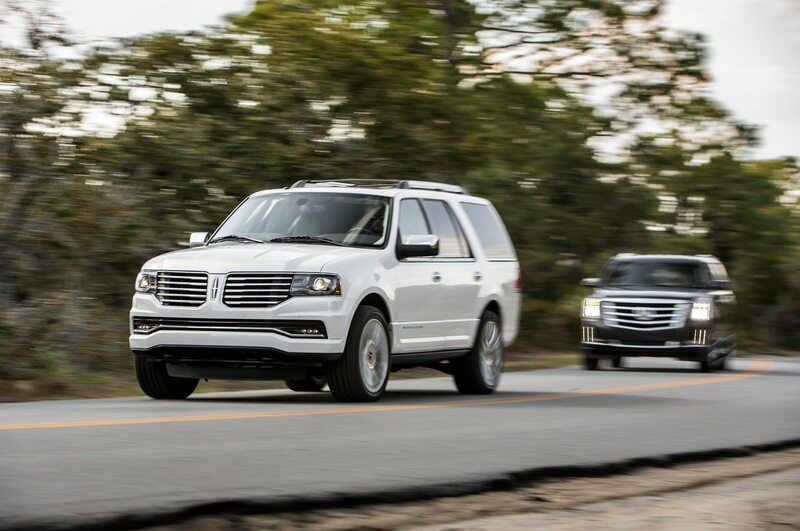 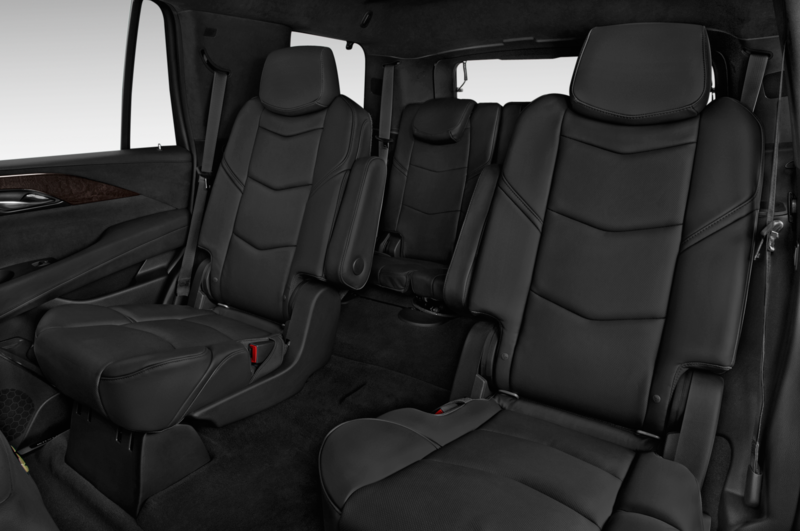 The 2015 Lincoln Navigator more readily swallows a seventh and eighth occupant. 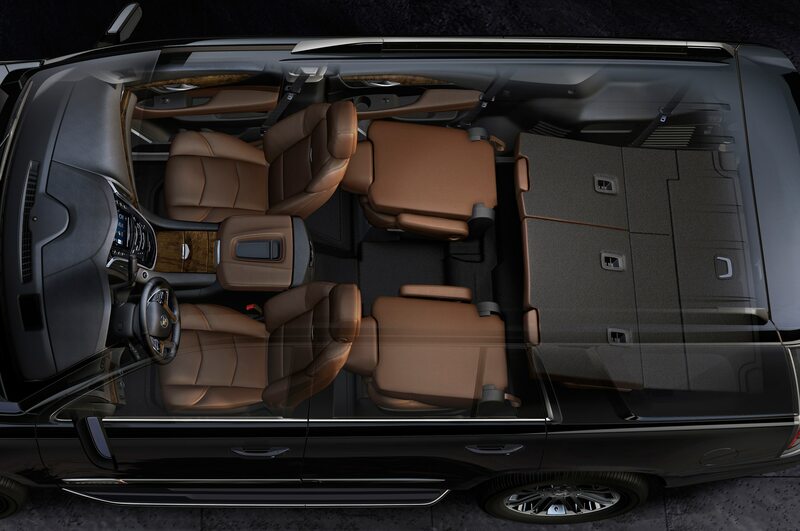 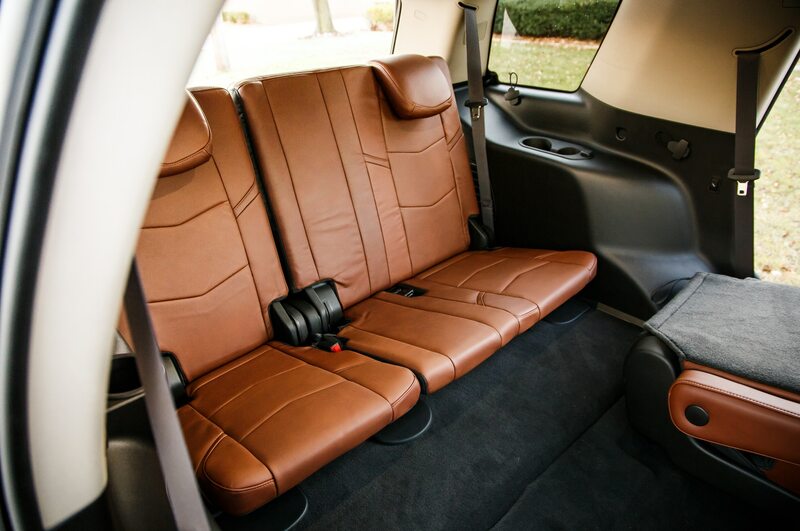 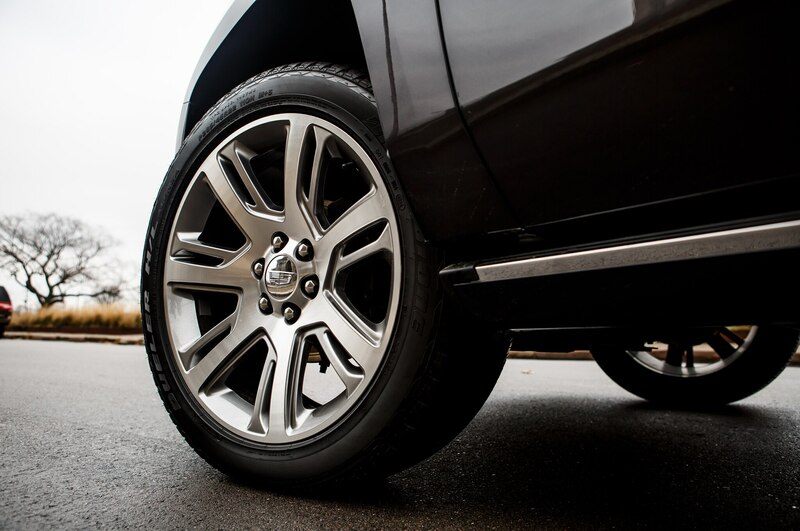 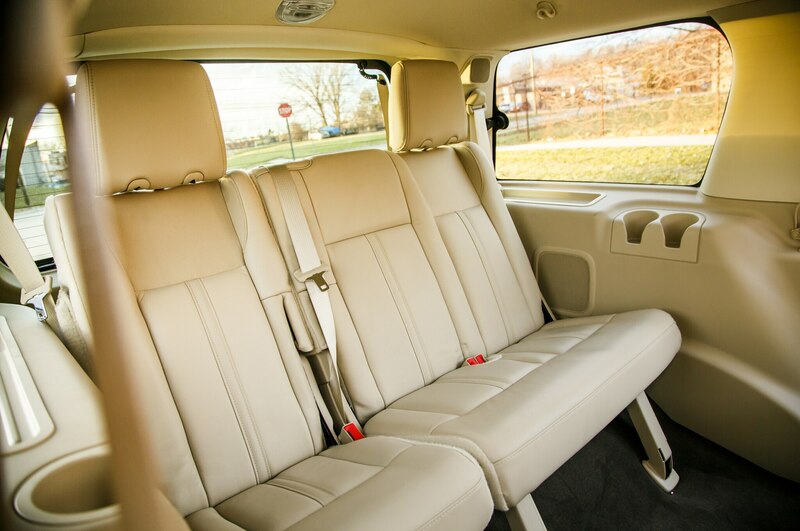 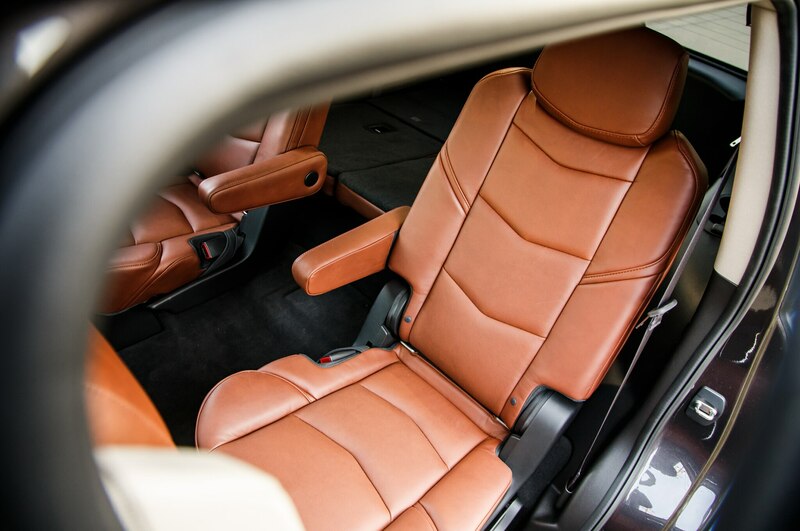 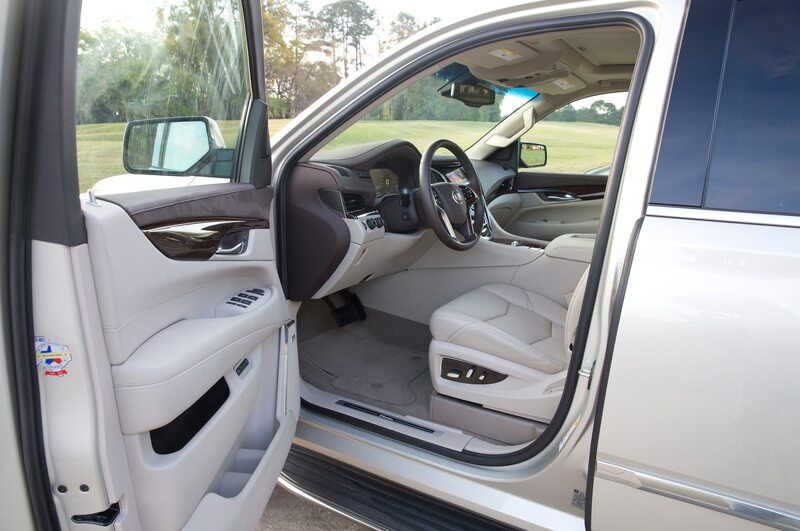 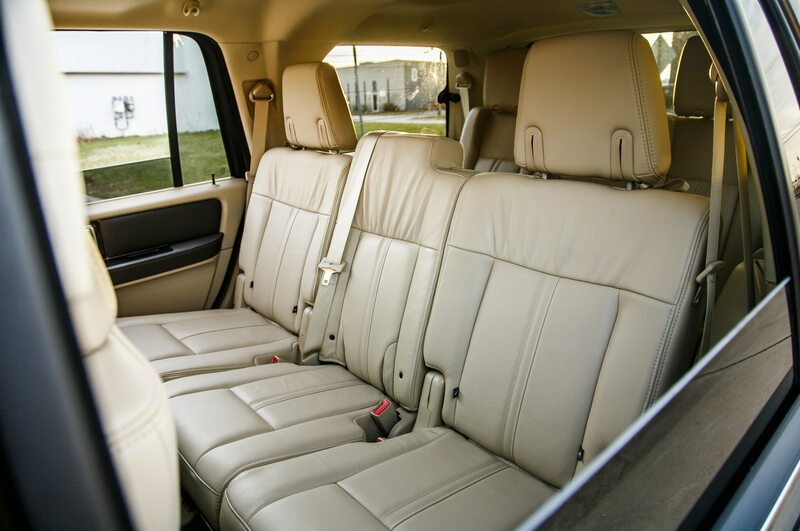 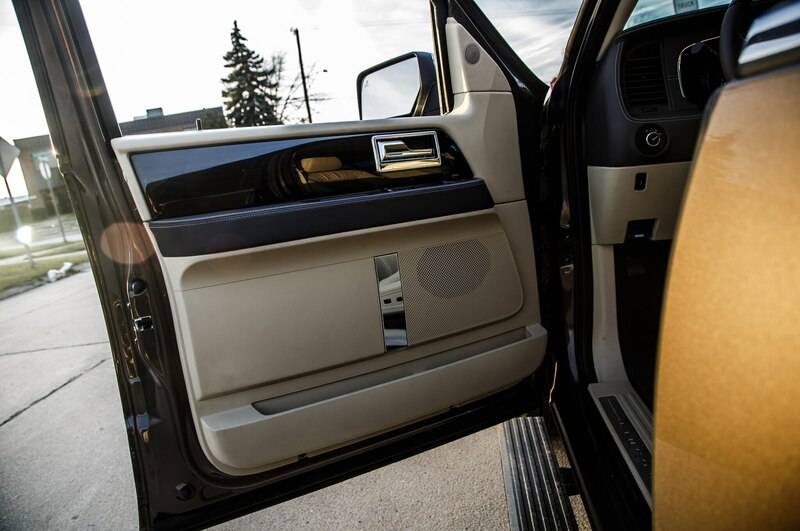 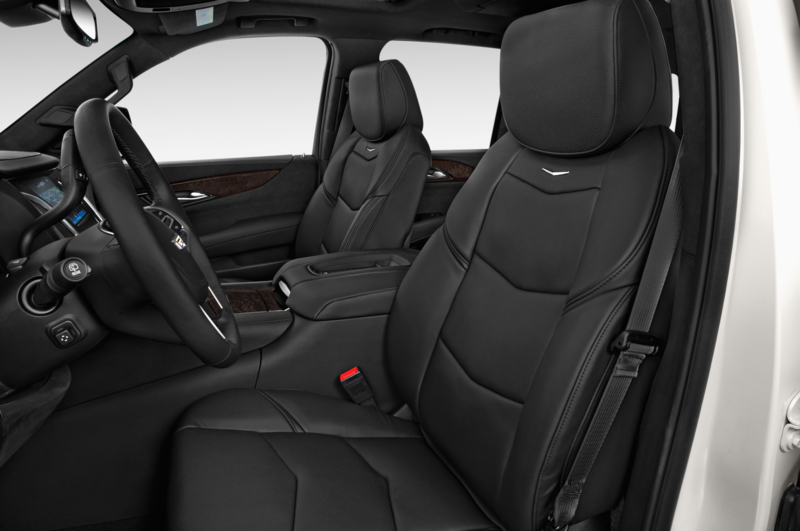 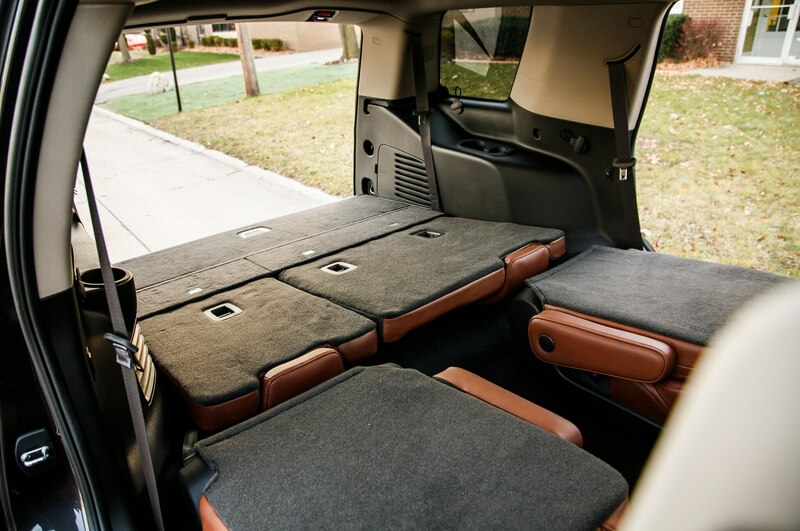 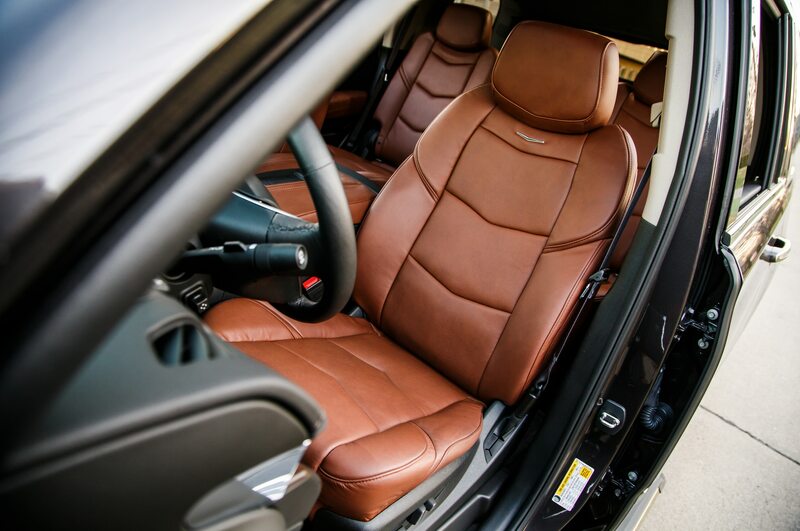 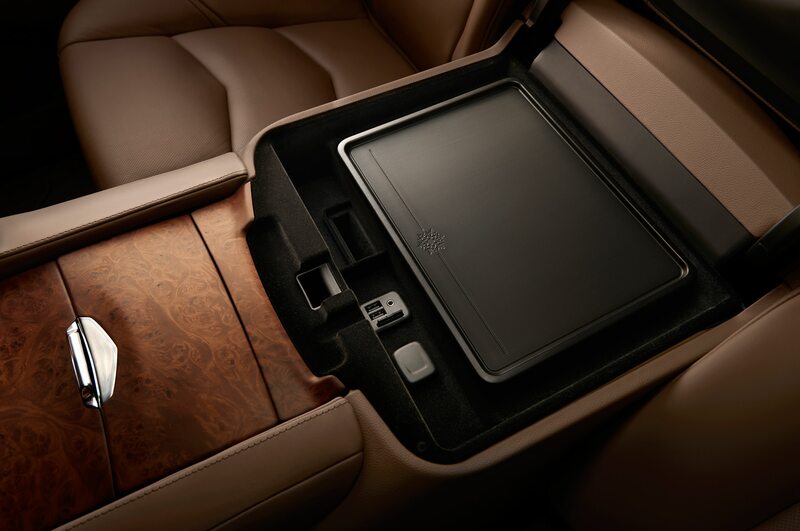 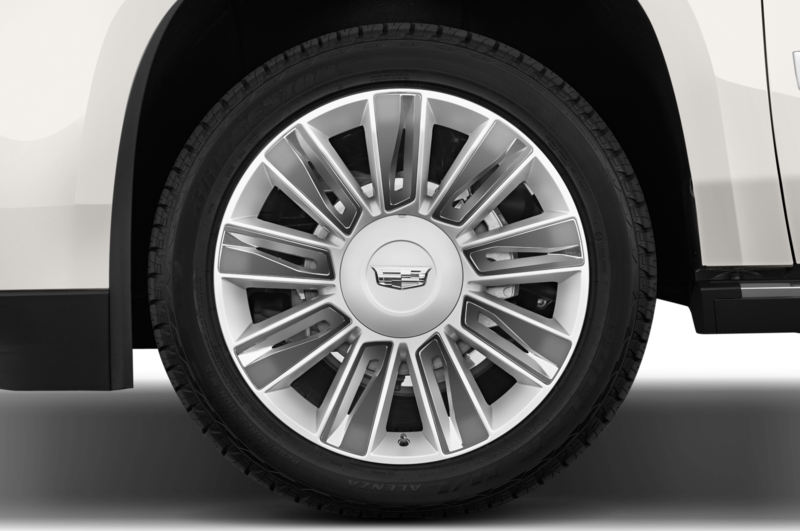 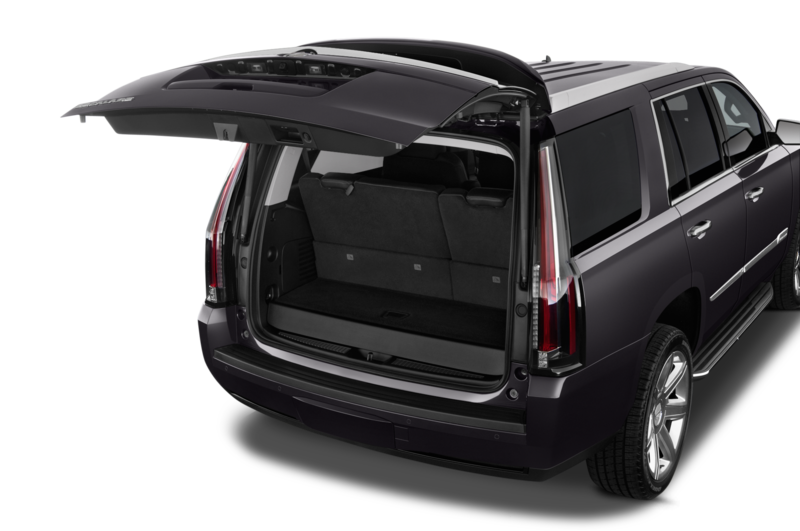 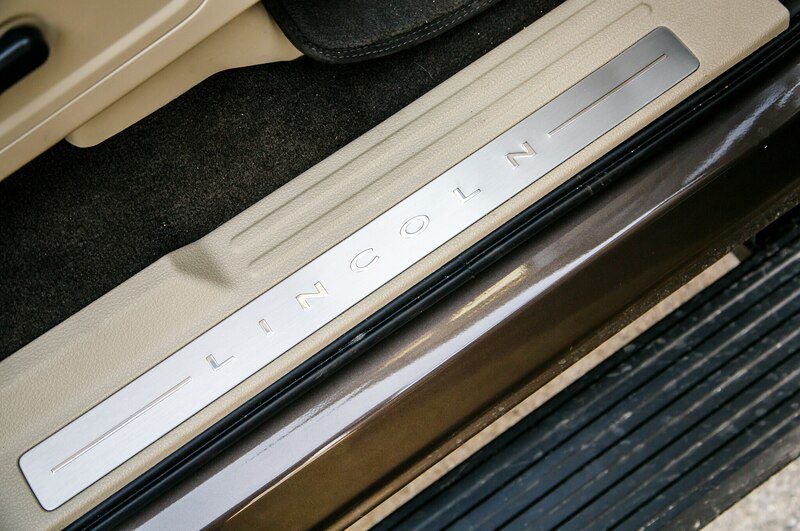 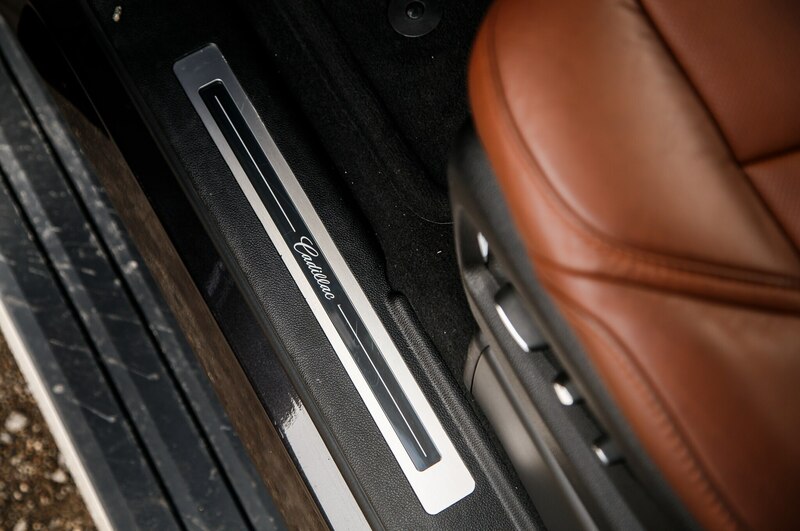 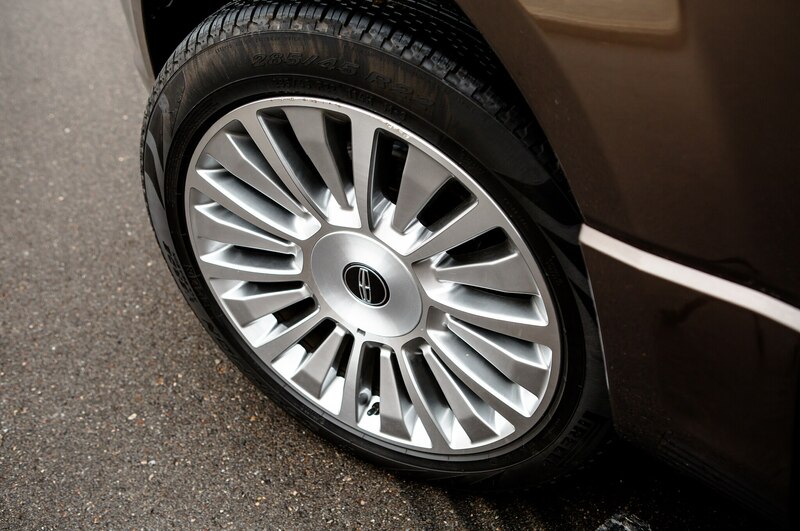 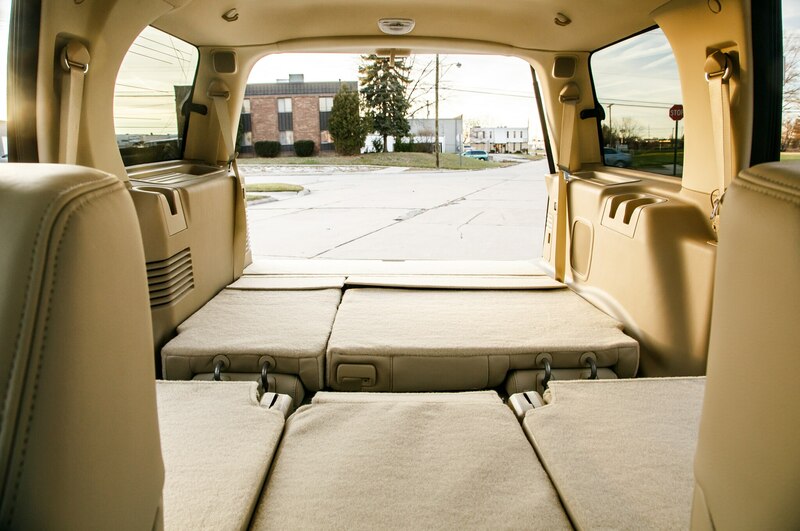 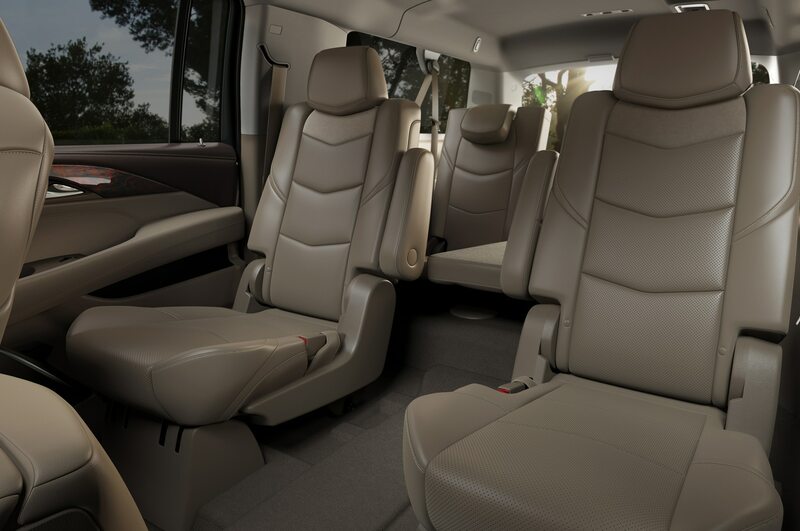 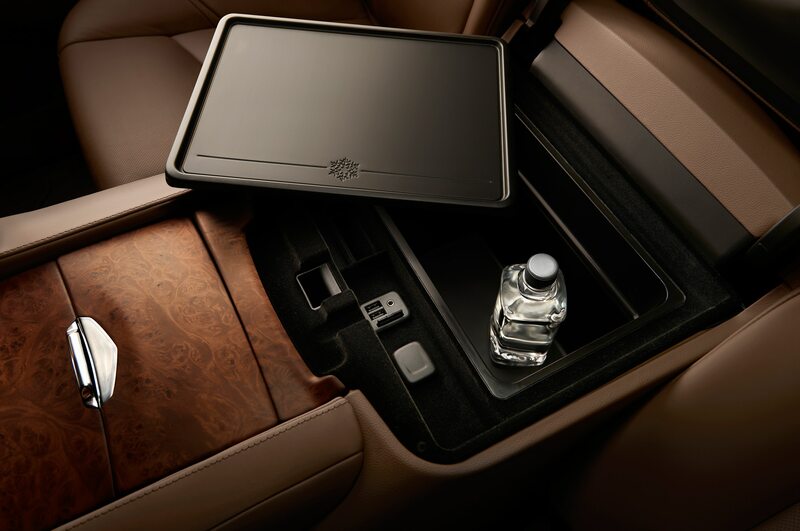 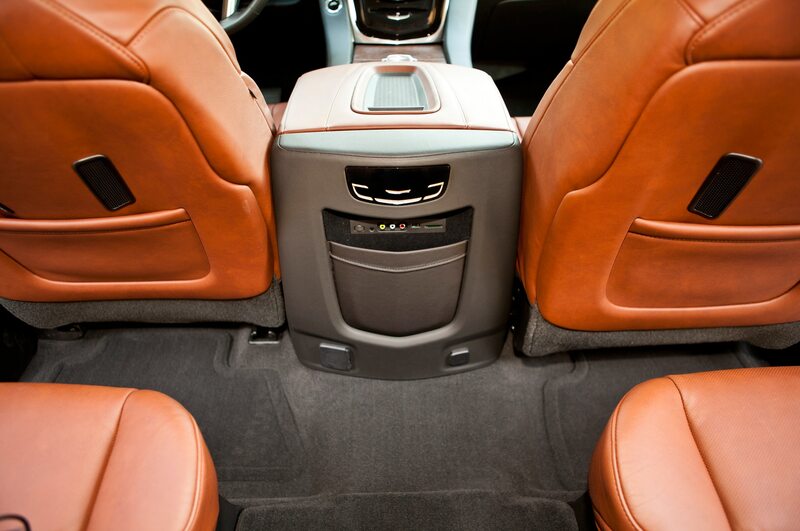 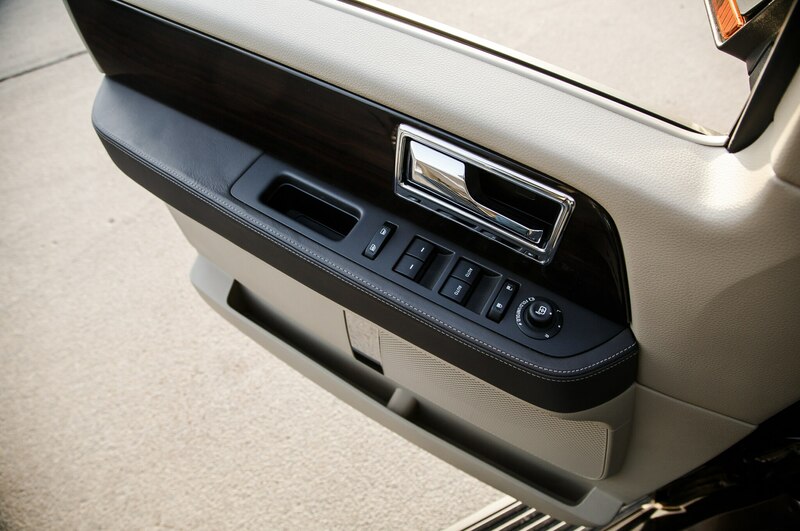 Compared to the Escalade, the Lincoln’s lower rear floor provides more legroom. 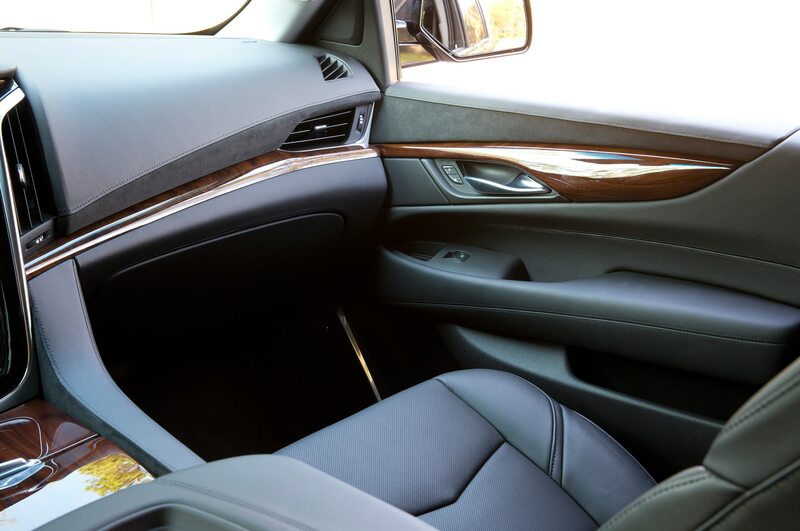 We’re plenty comfortable sitting in the third row on a sushi run at lunchtime, but those crammed in the rear of the Cadillac grouse about scrunched knees. 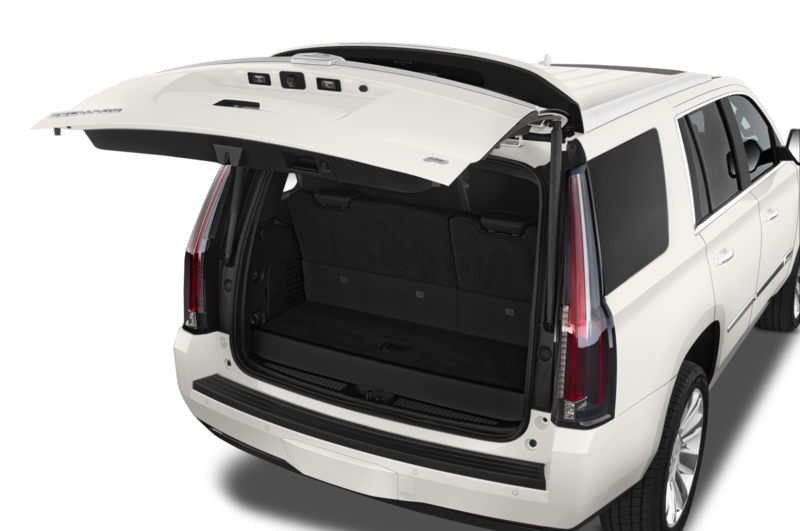 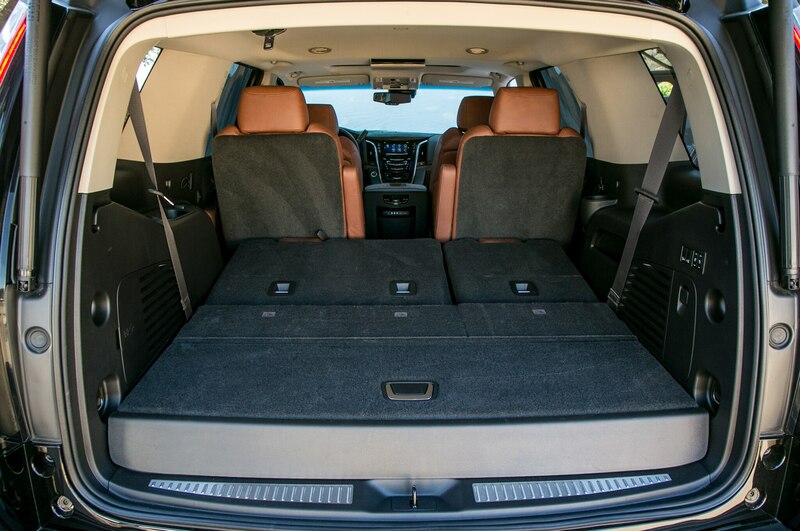 The Navigator’s cargo area also has a slightly lower liftover height, making it that much easier to fit boxes or luggage in the back. 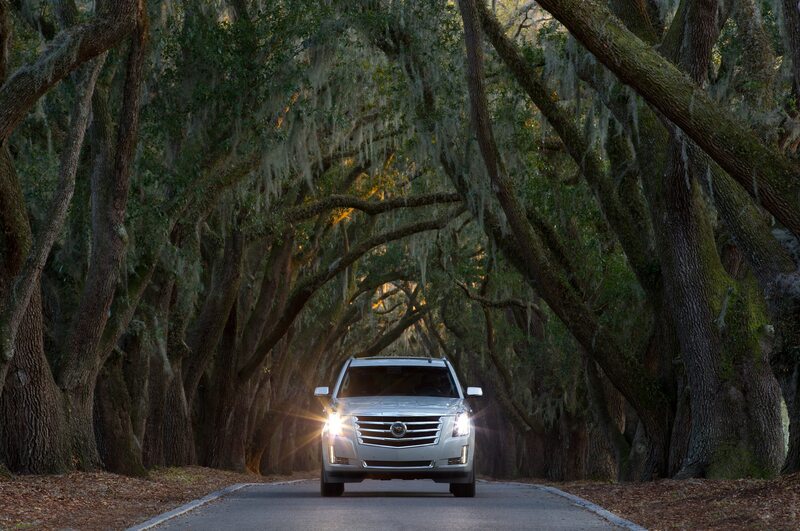 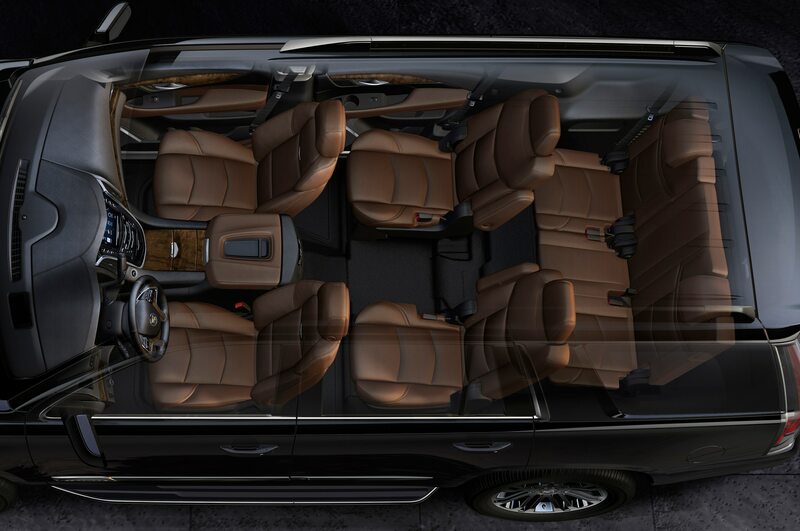 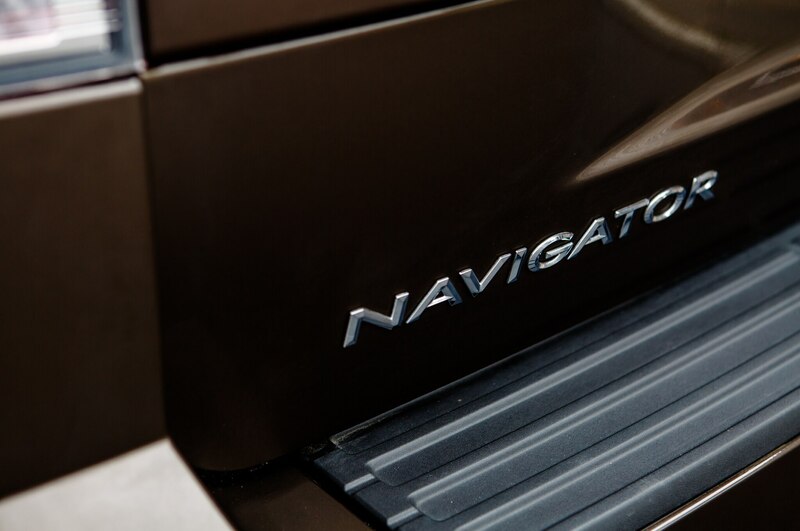 Whether you’re hauling people or boxes, the Navigator easily wins. 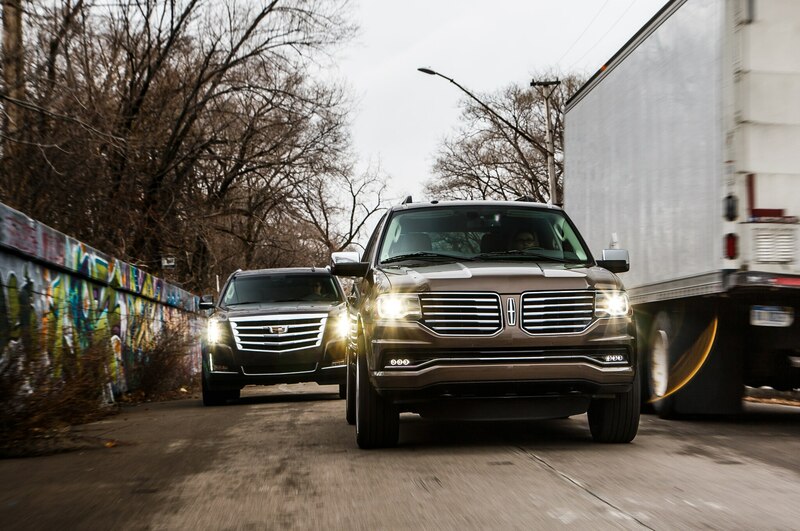 Of course, these big vehicles are not purchased for their utility. 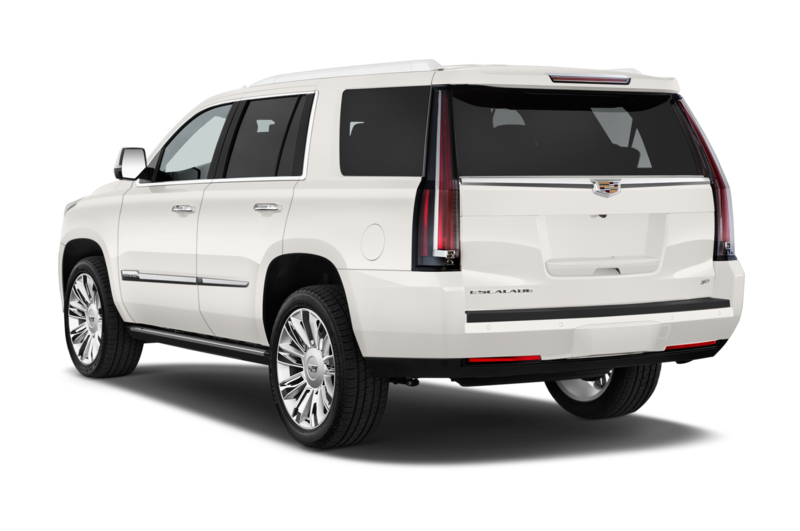 They are personal luxury cars, in the same manner as the big Eldorados and Continentals were in earlier epochs. 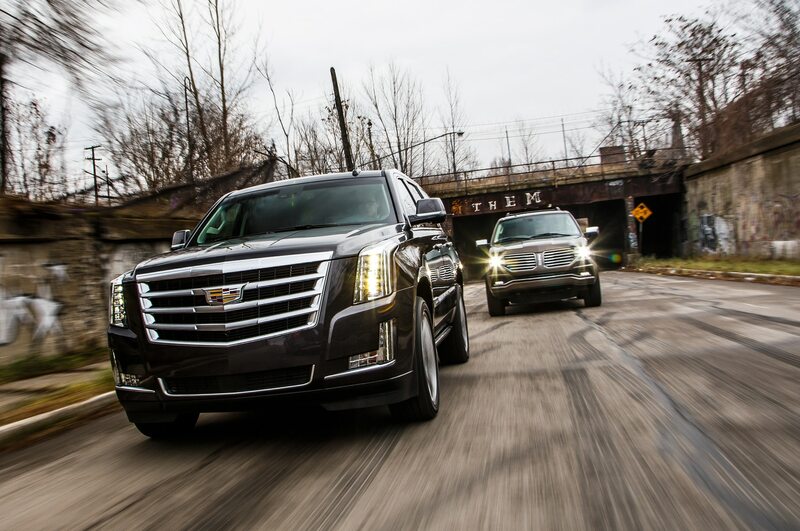 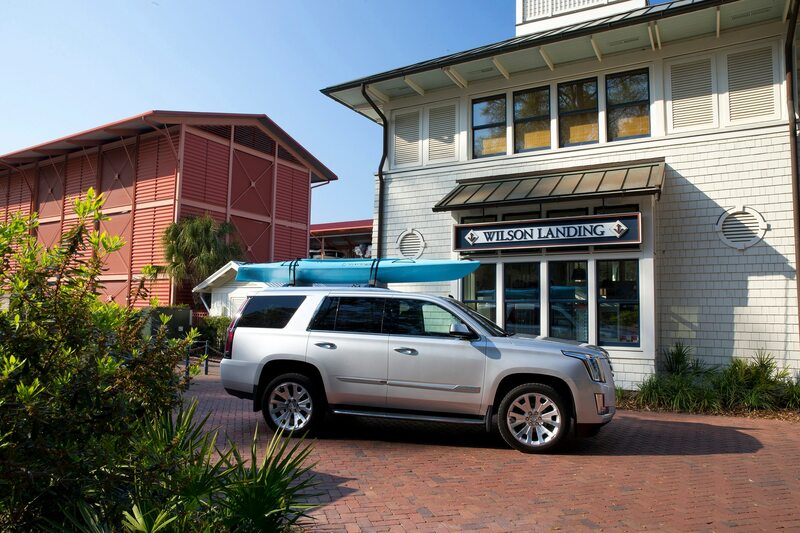 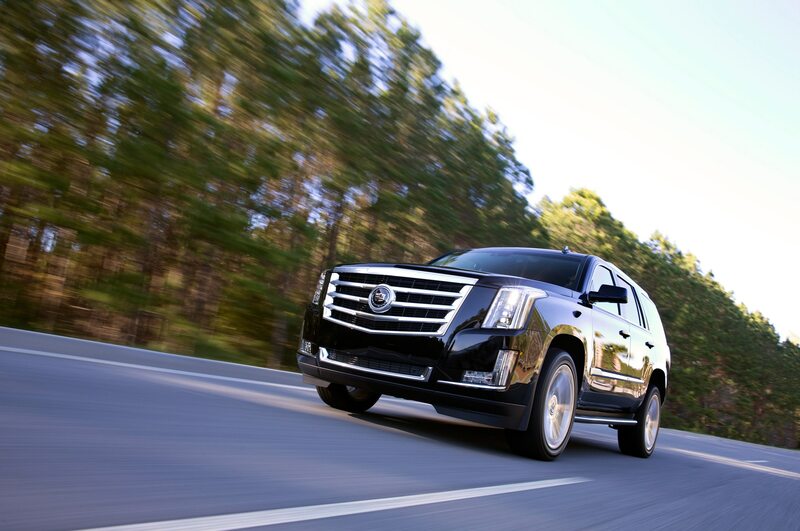 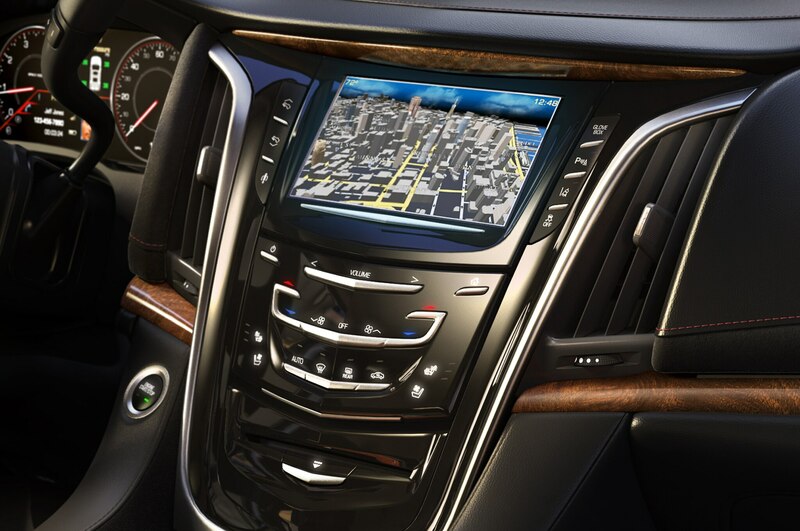 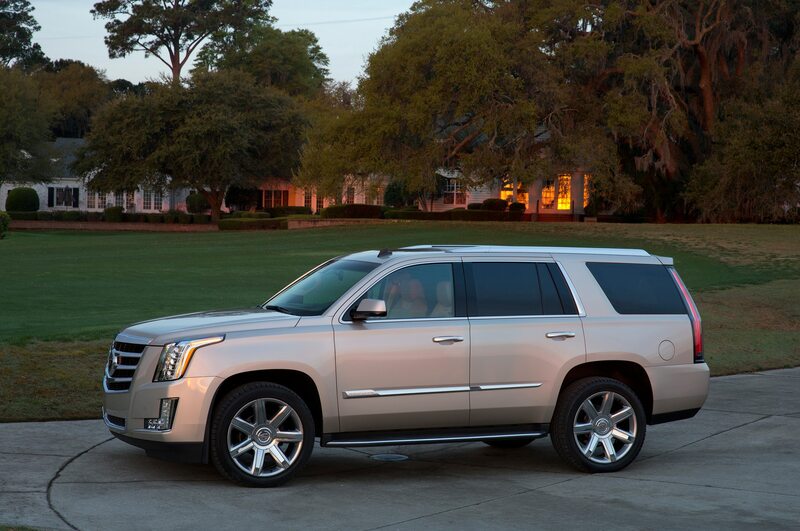 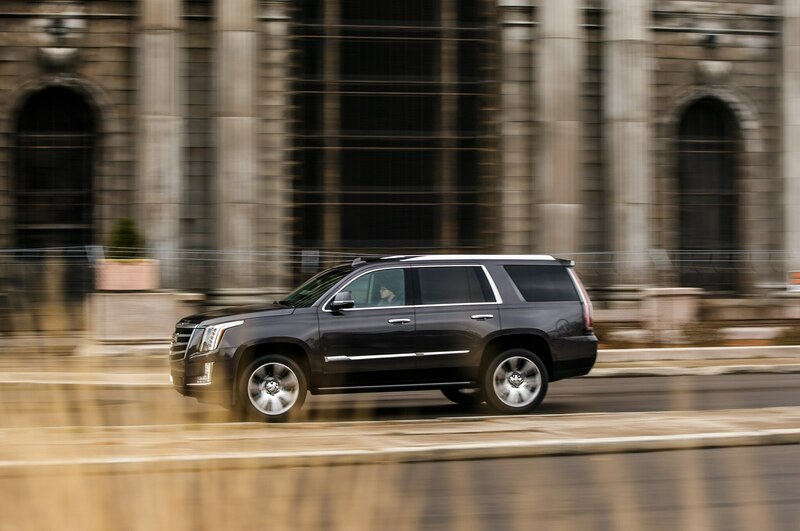 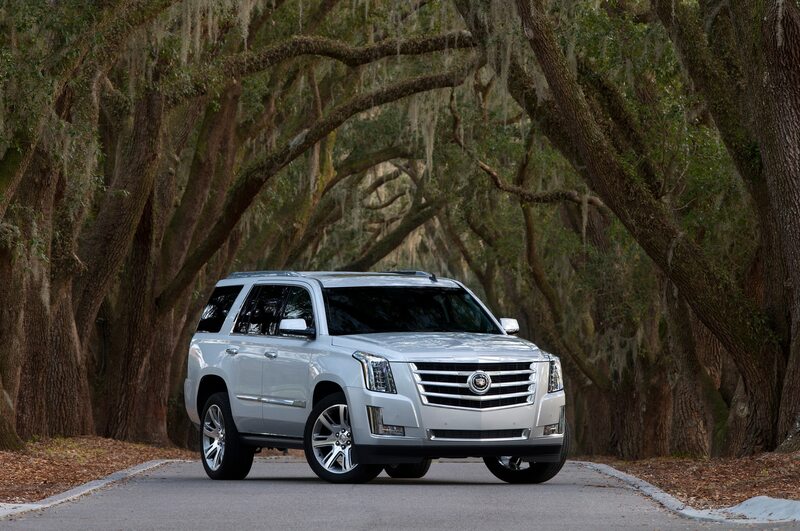 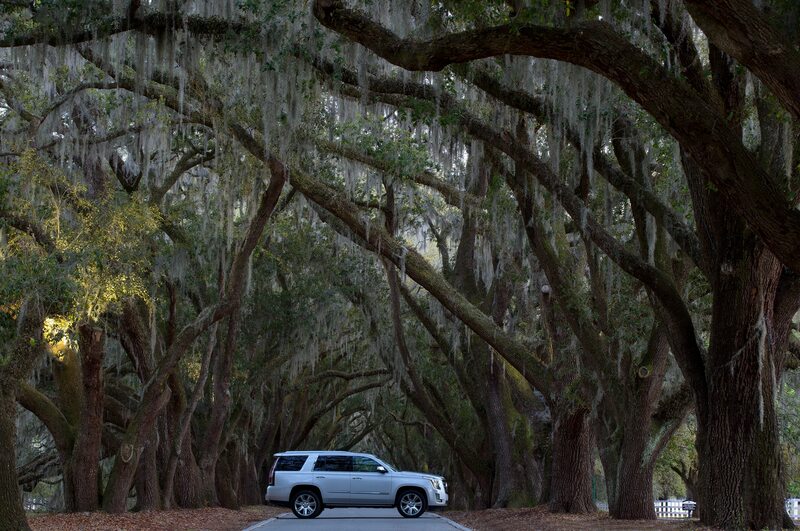 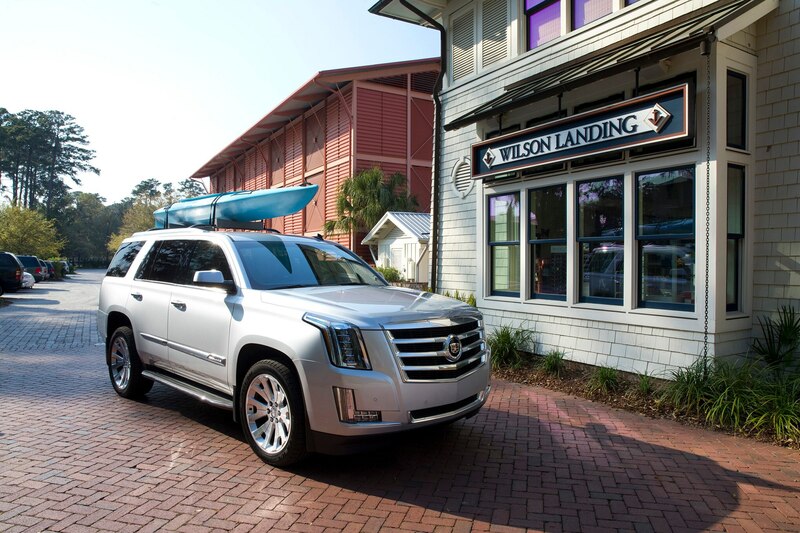 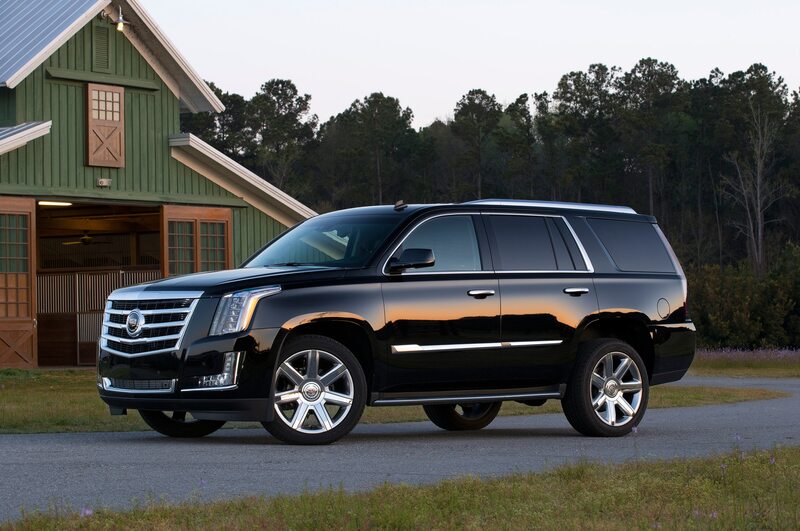 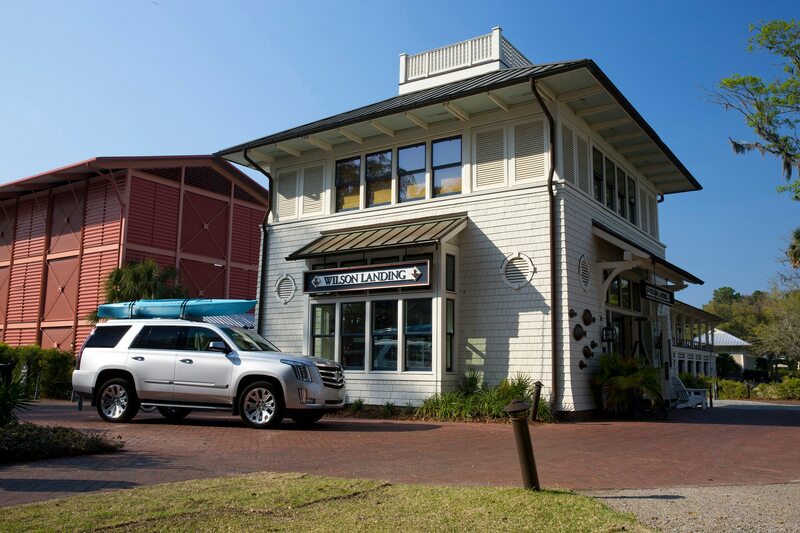 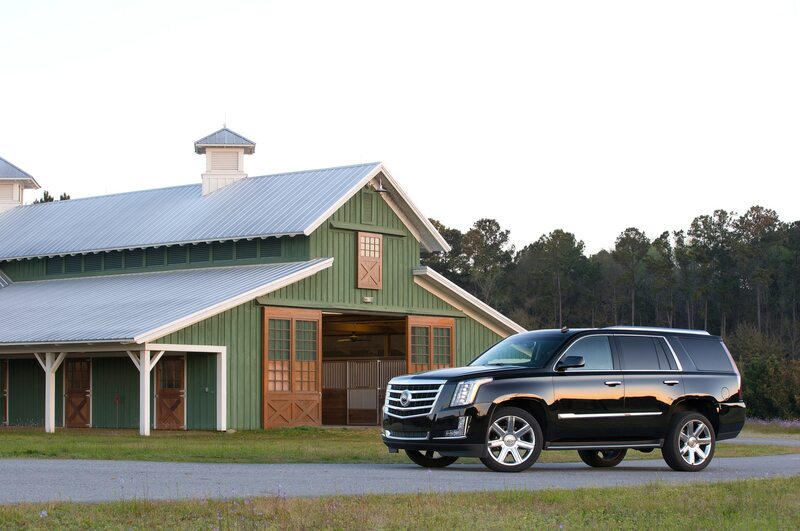 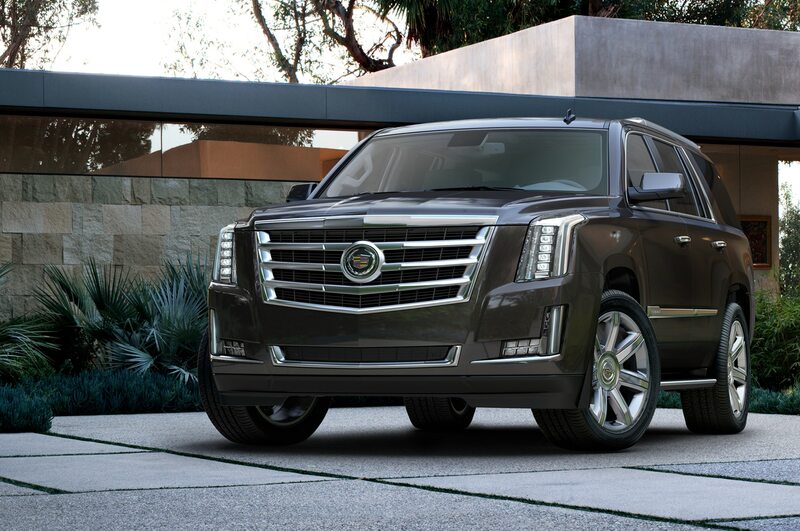 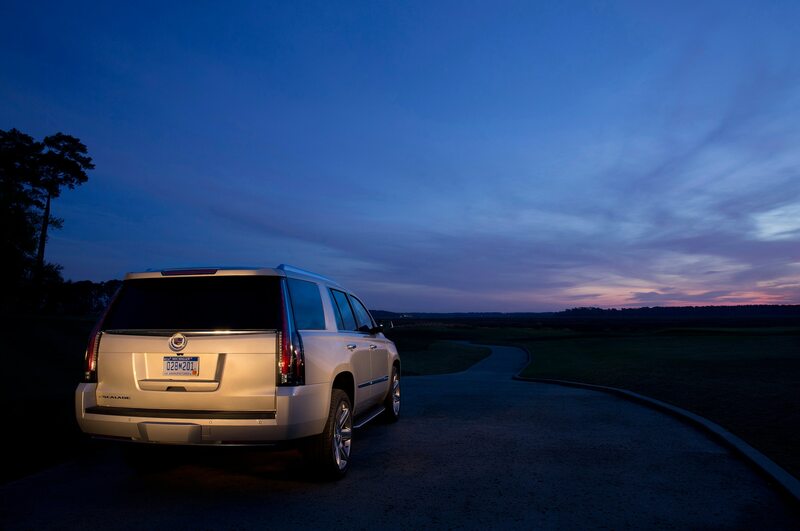 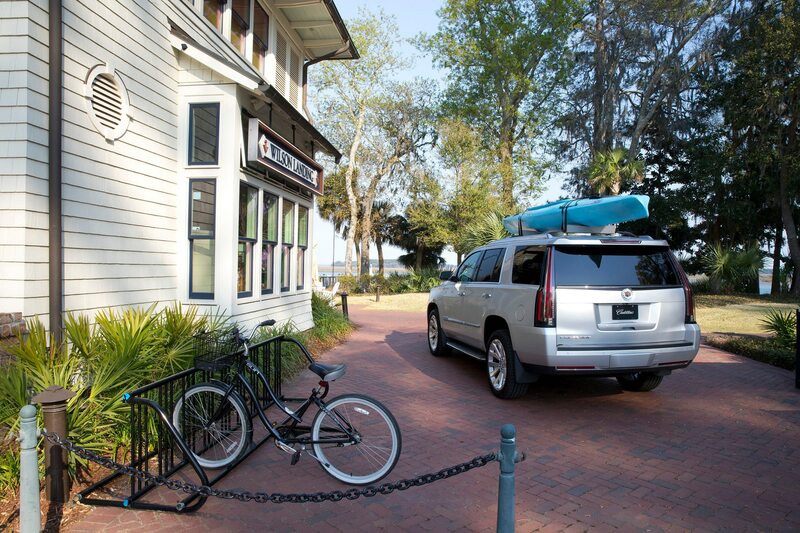 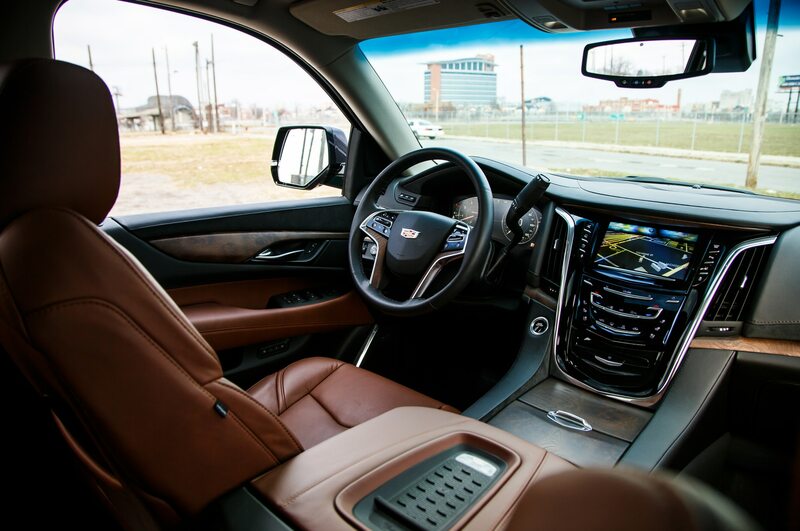 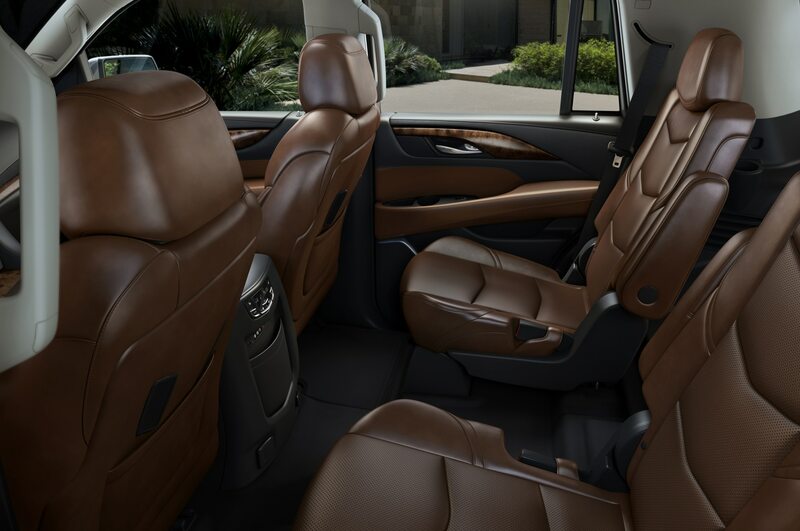 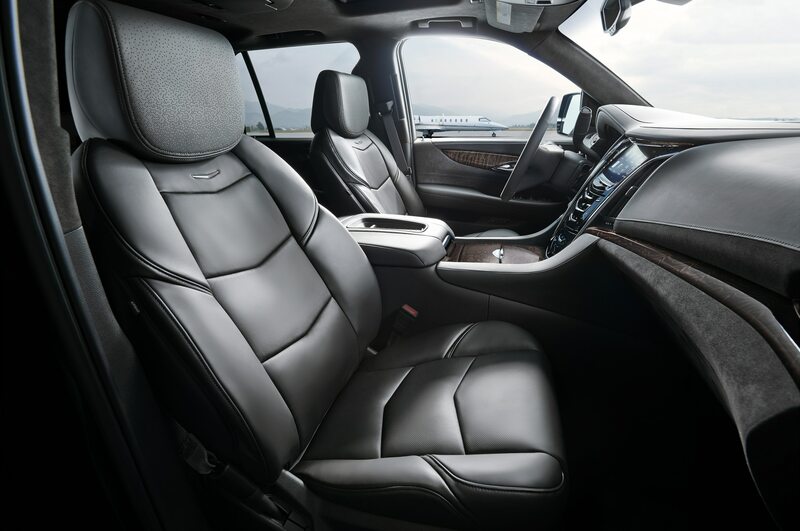 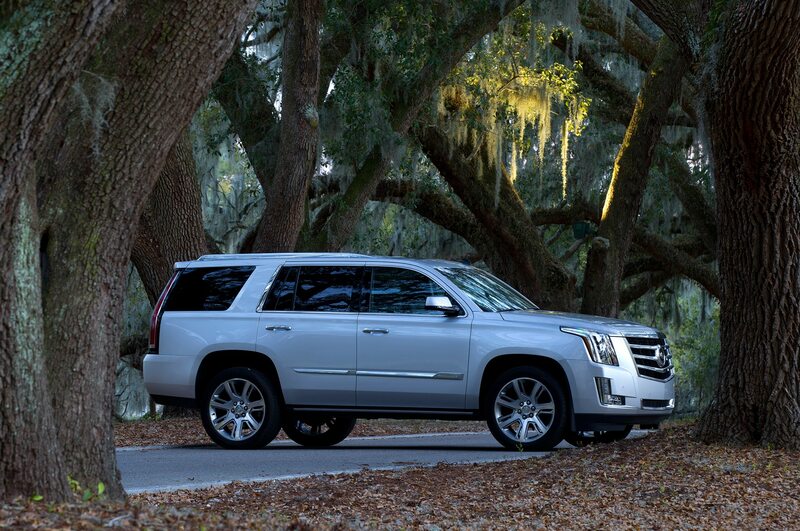 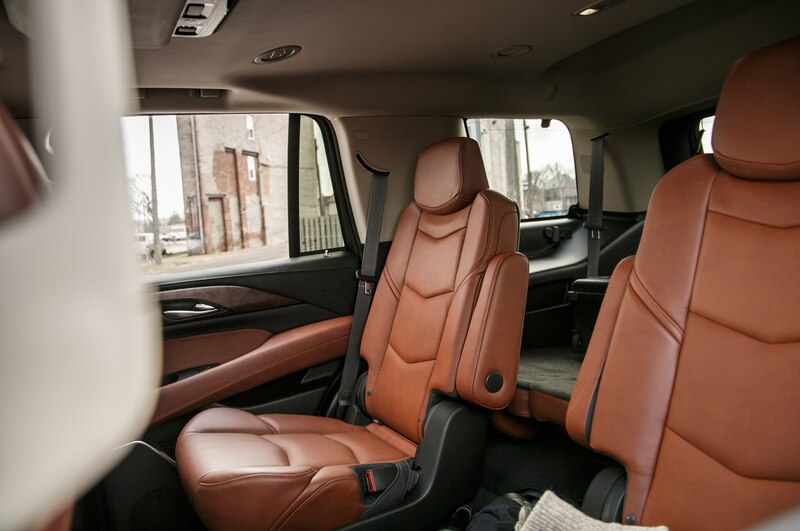 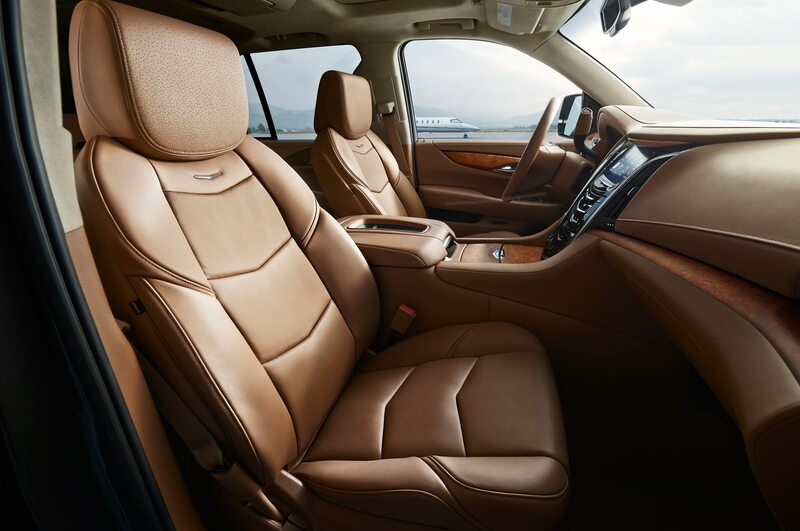 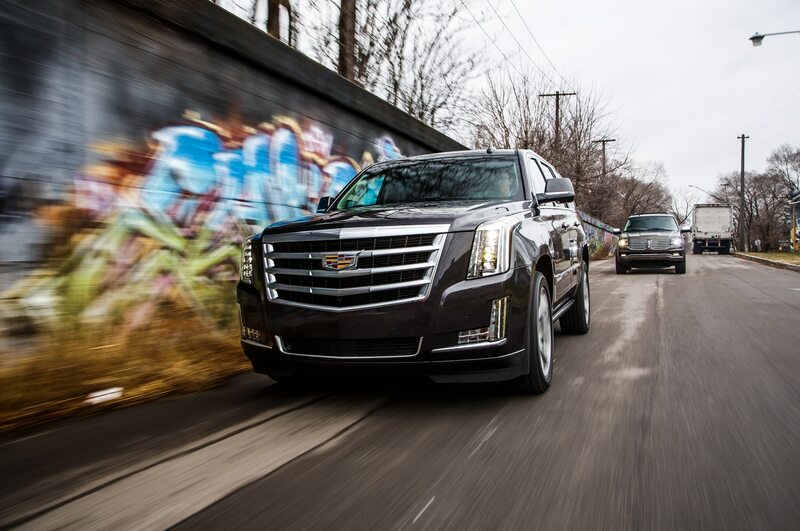 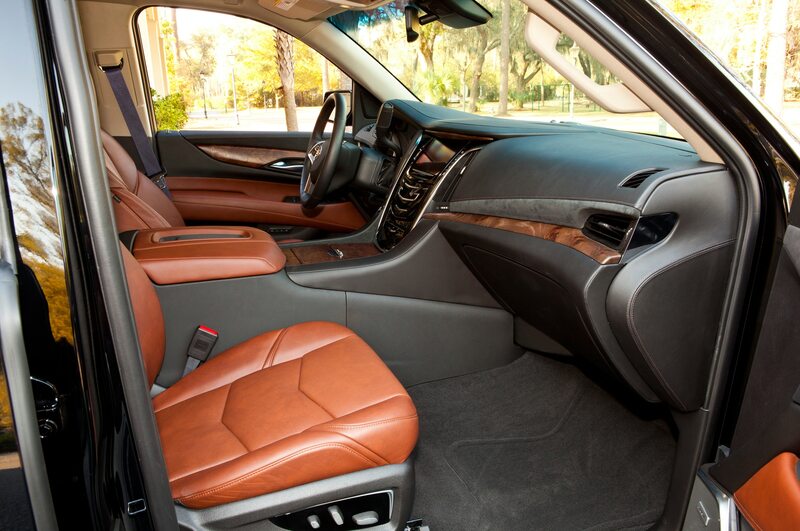 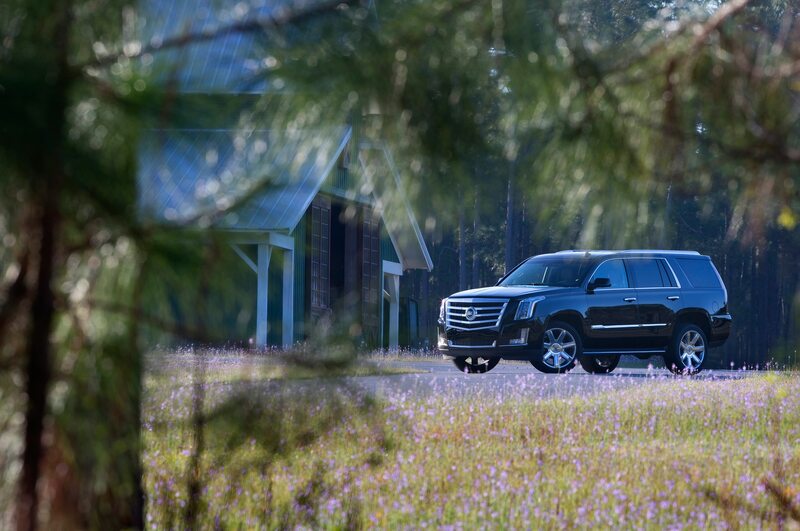 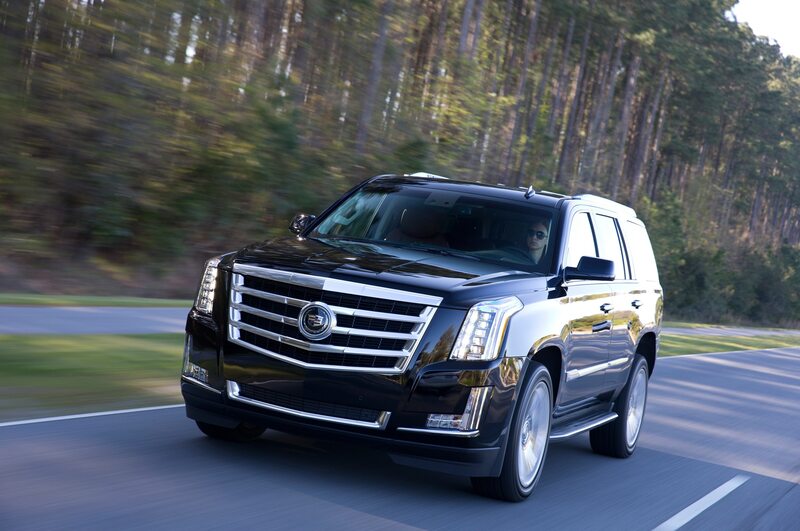 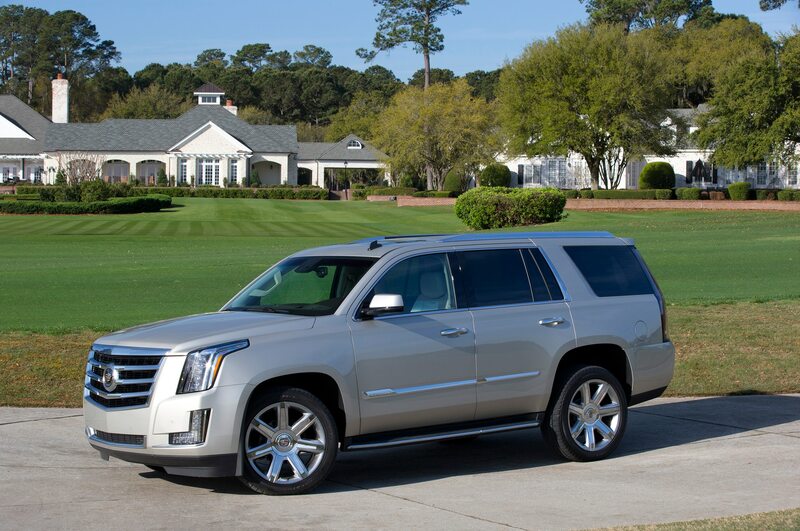 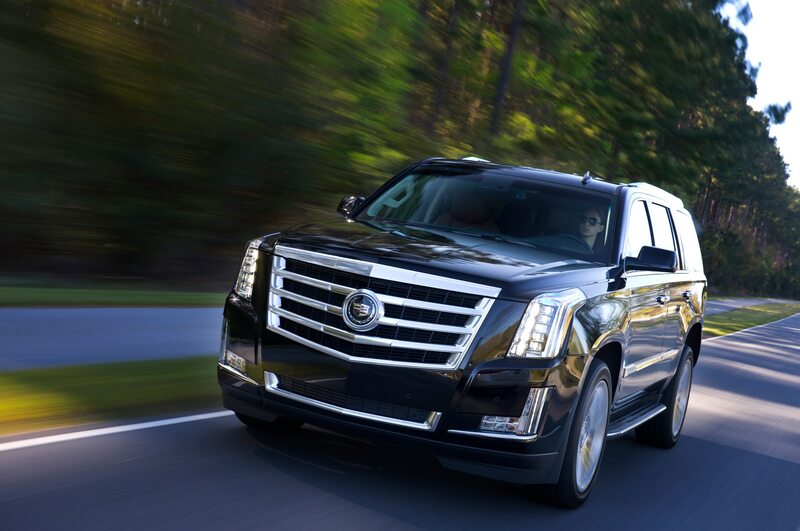 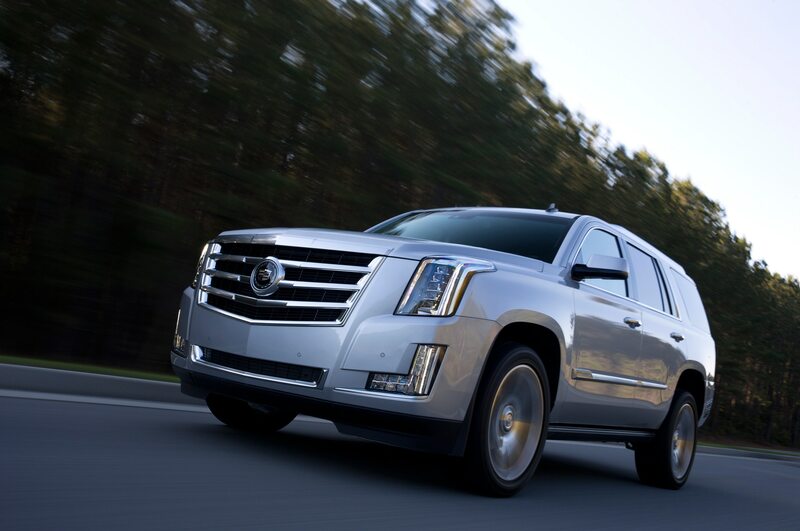 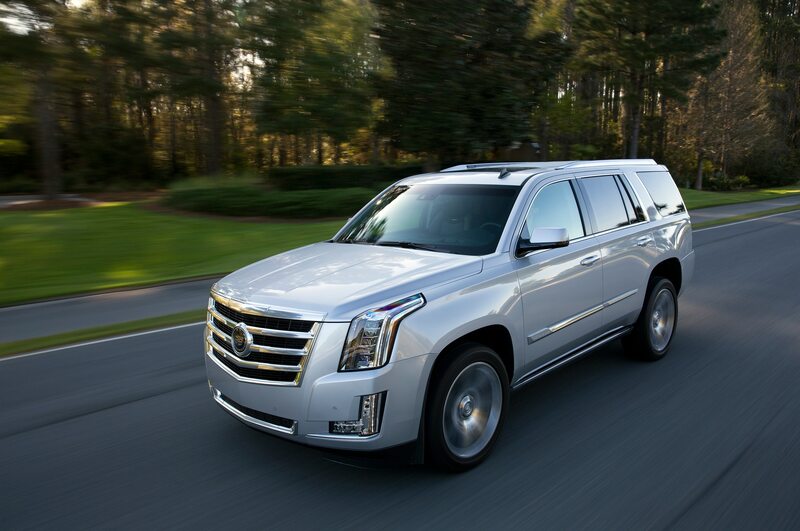 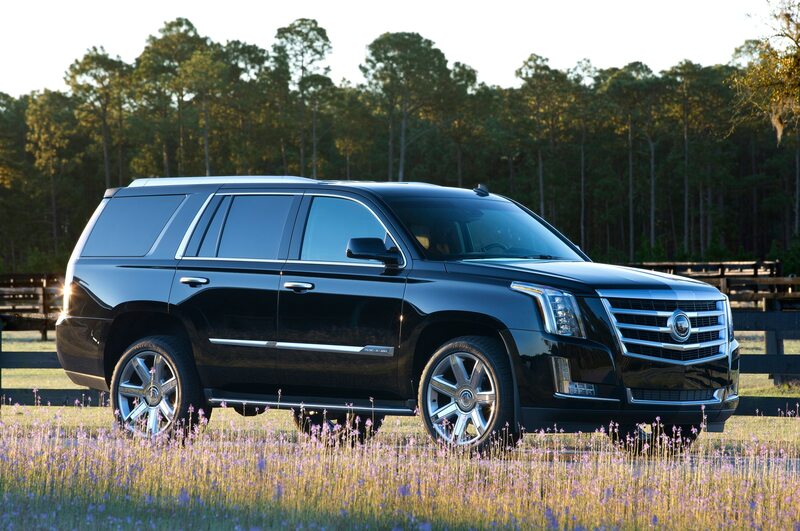 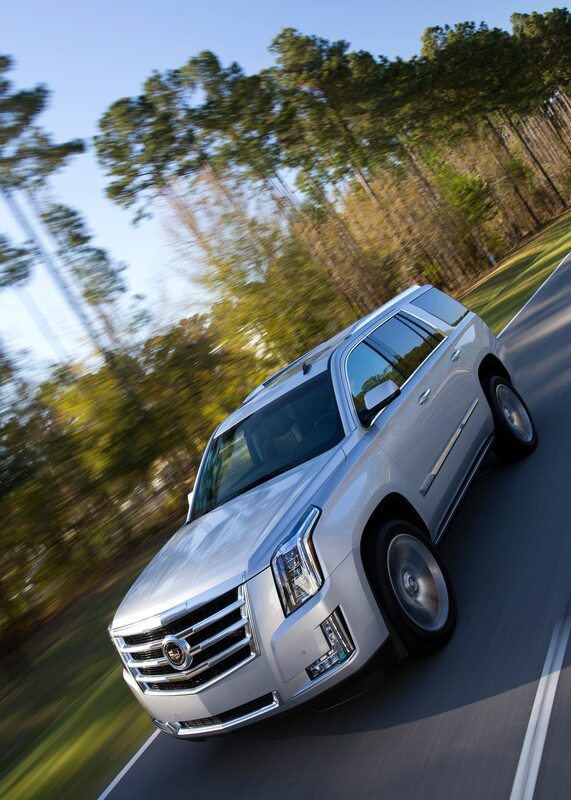 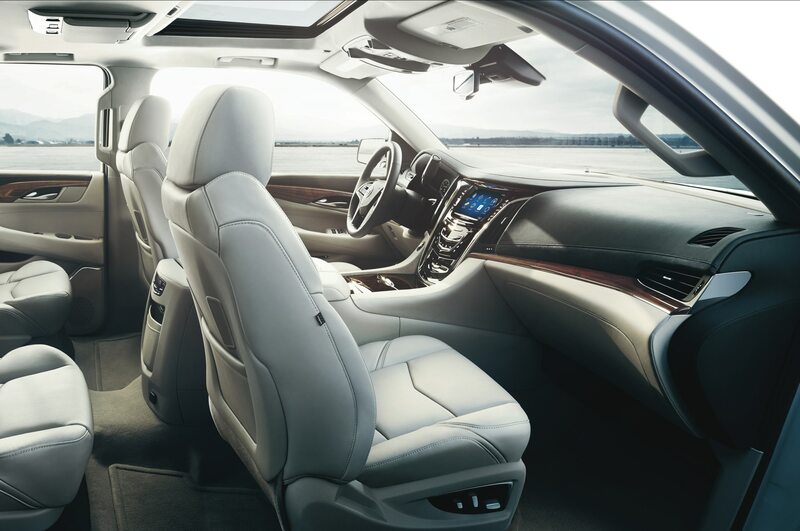 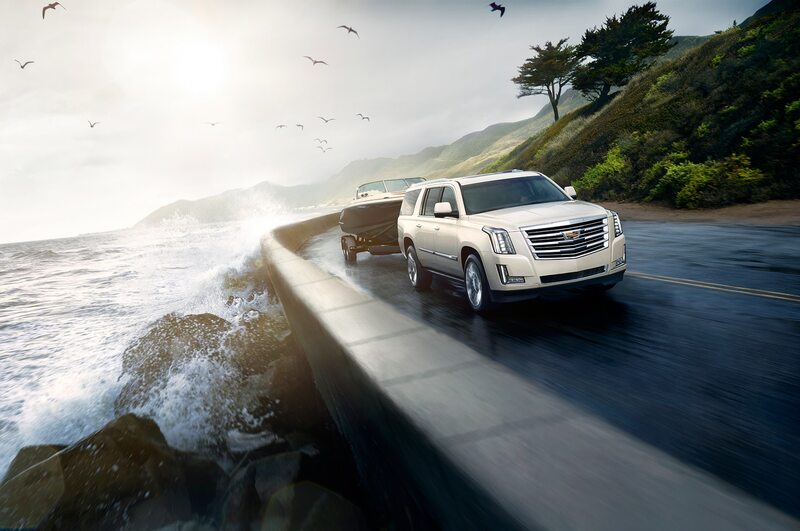 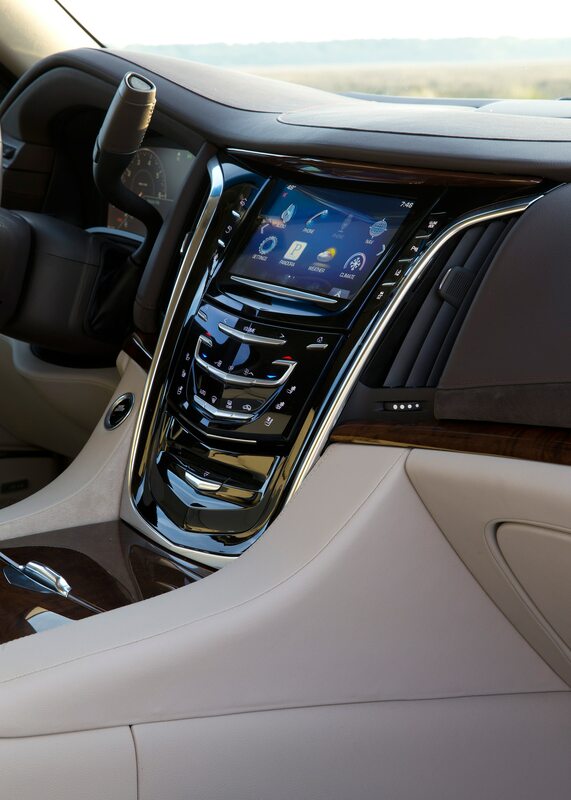 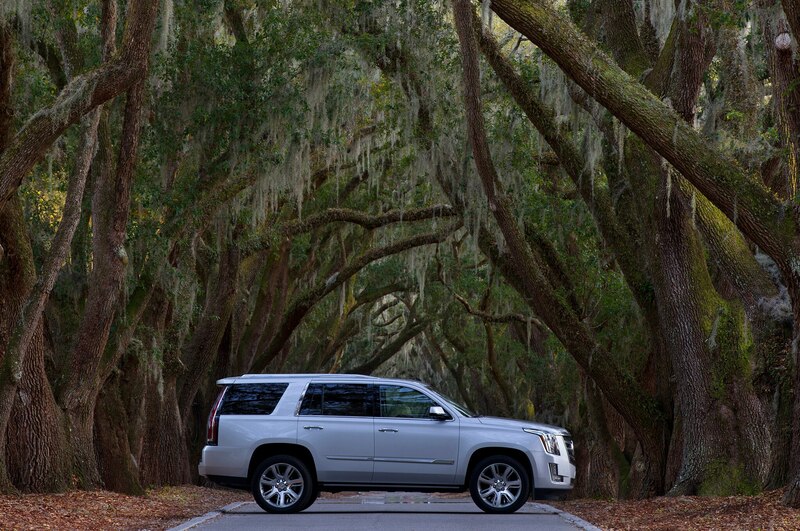 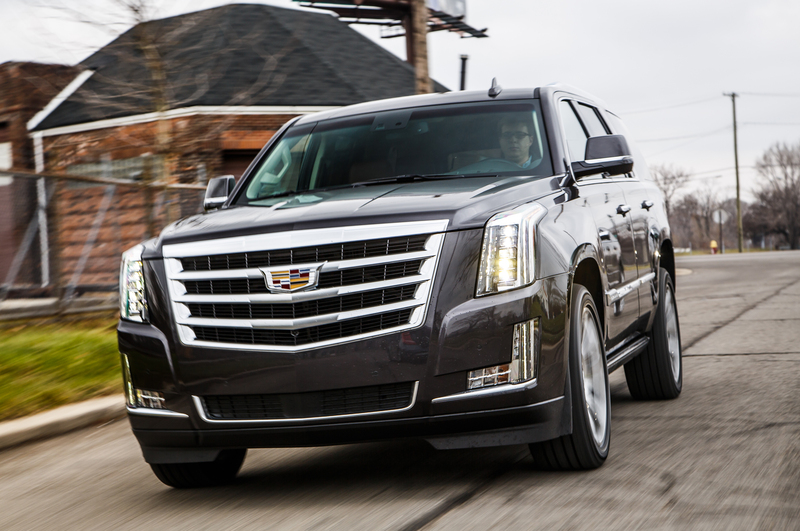 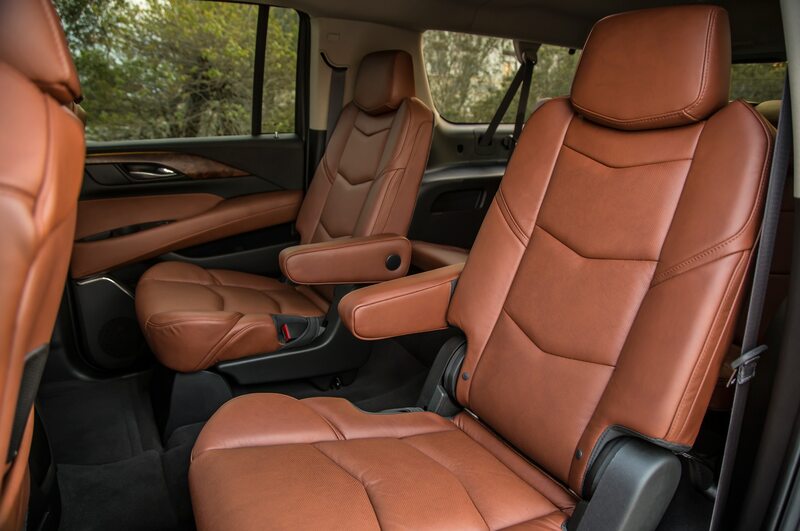 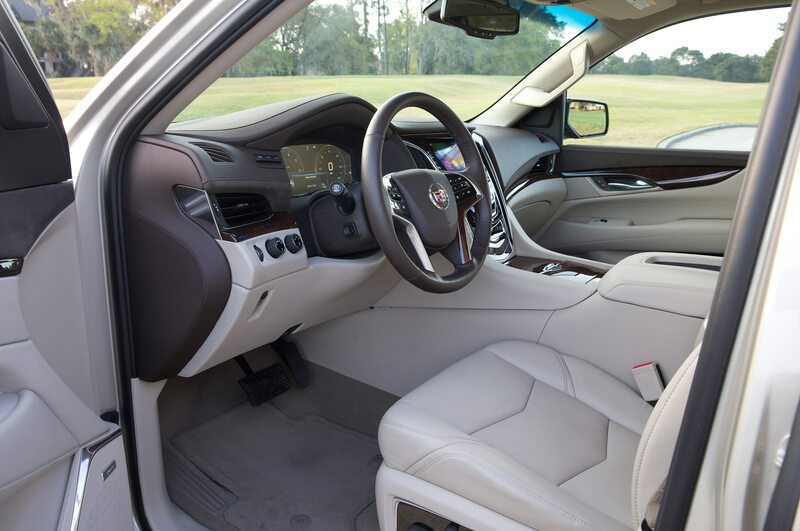 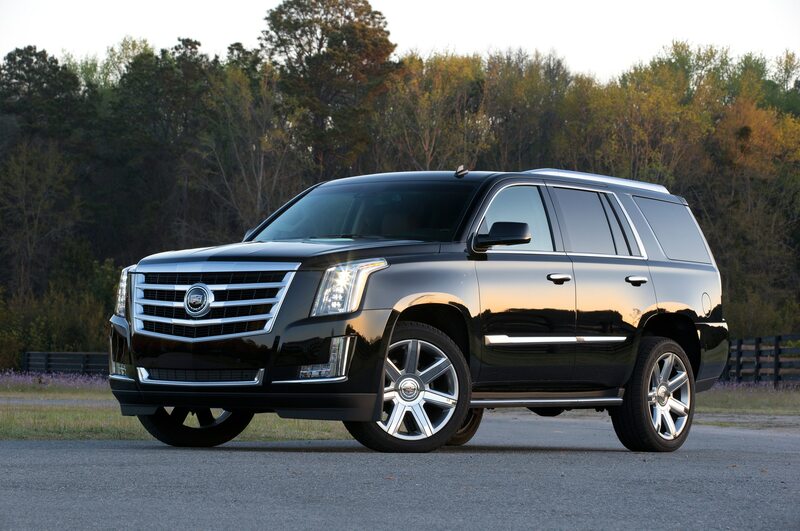 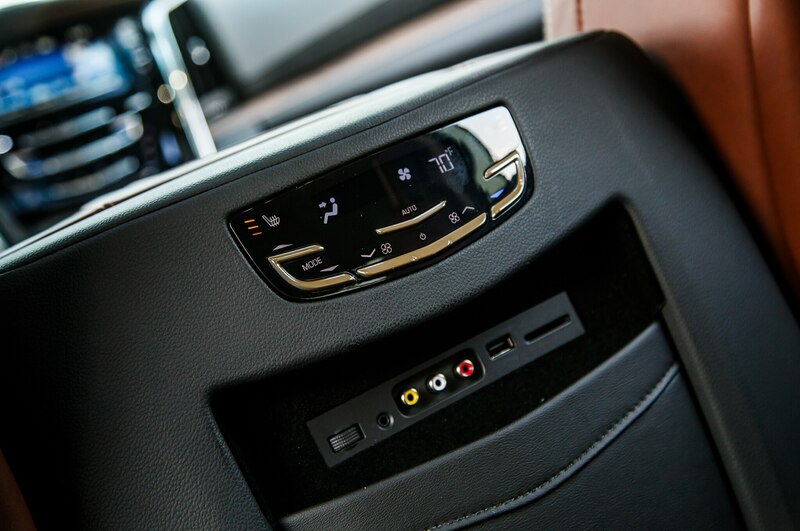 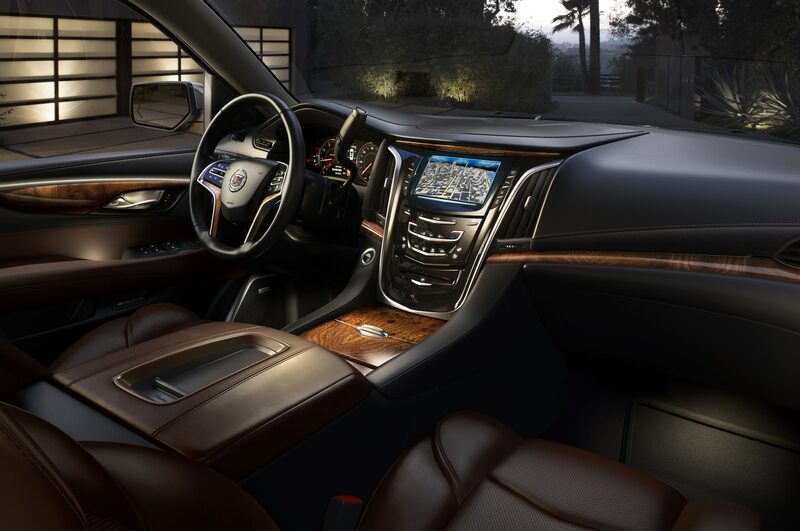 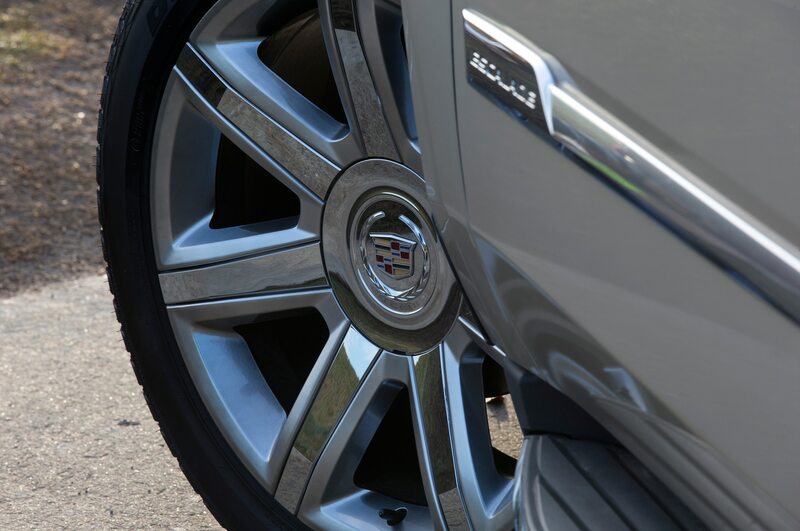 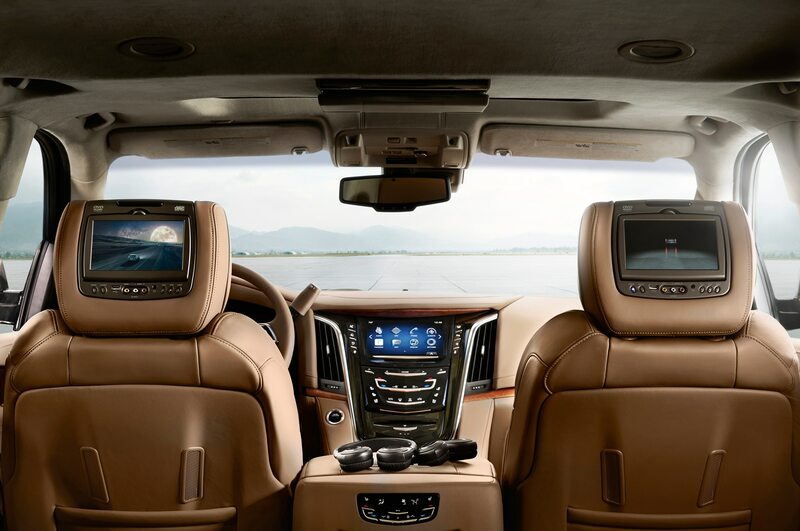 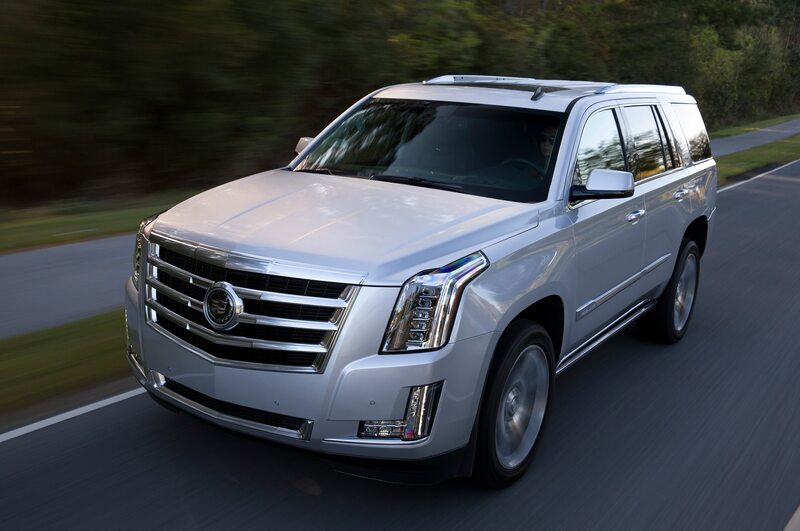 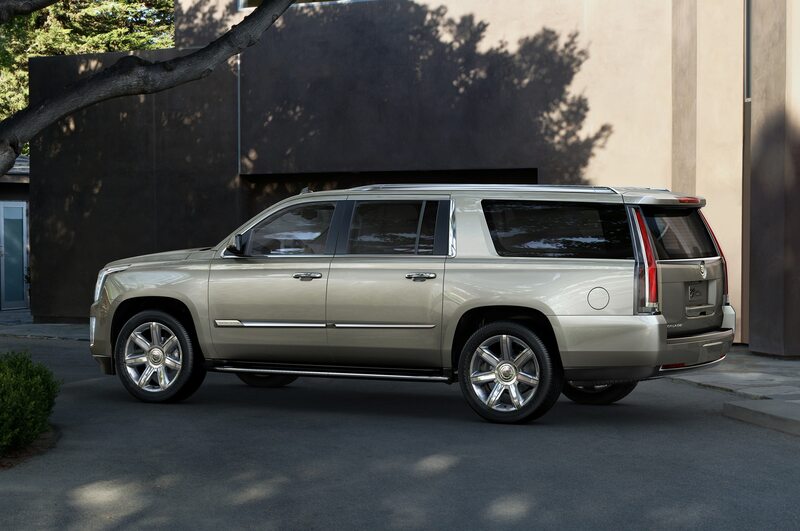 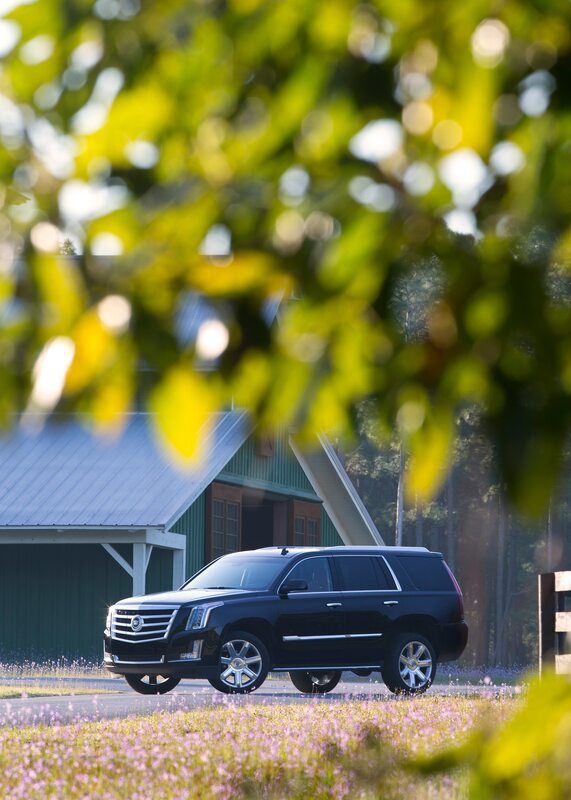 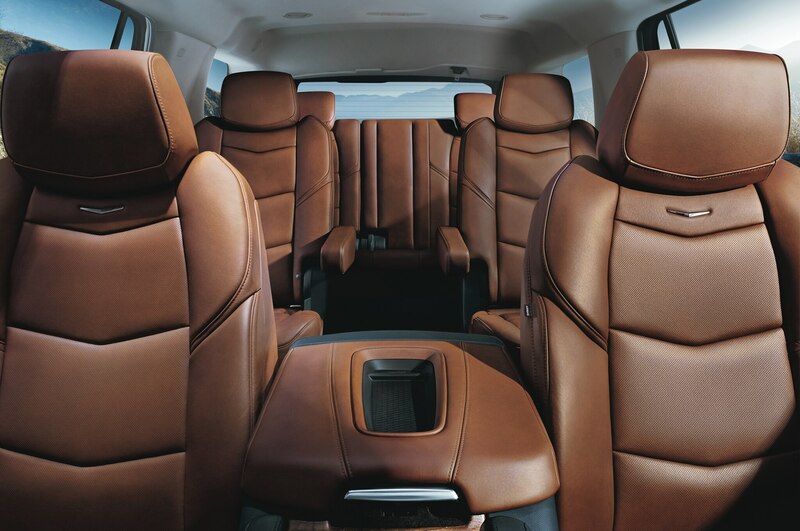 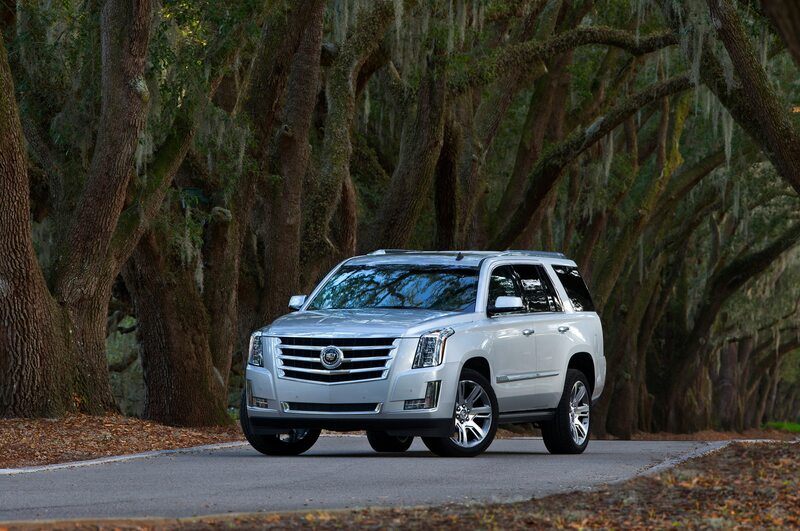 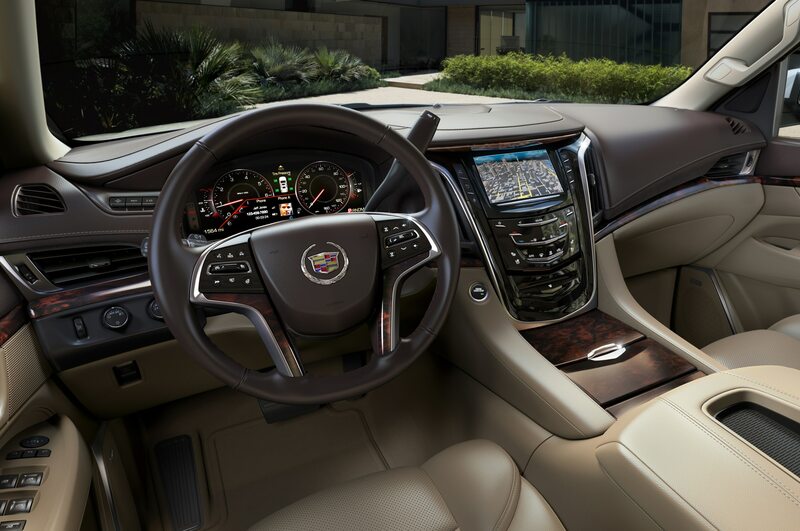 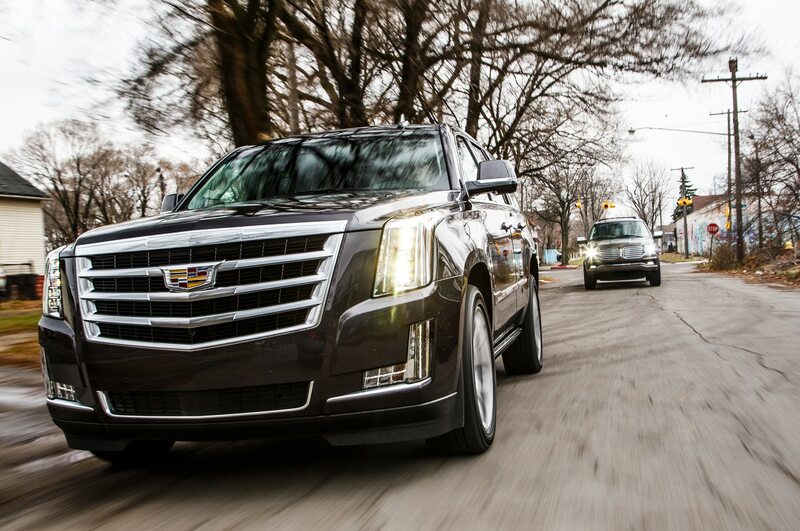 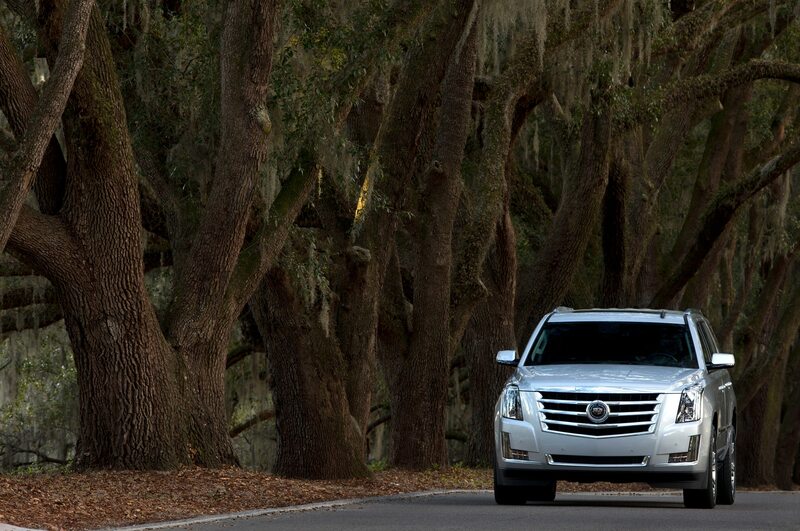 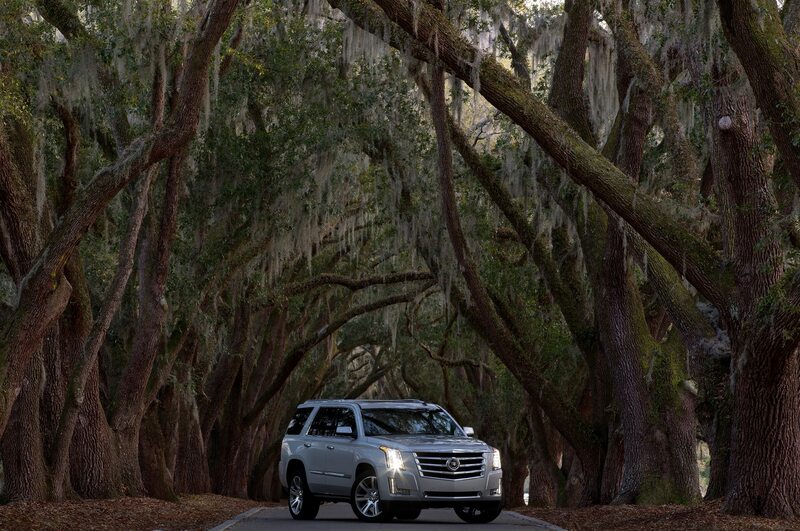 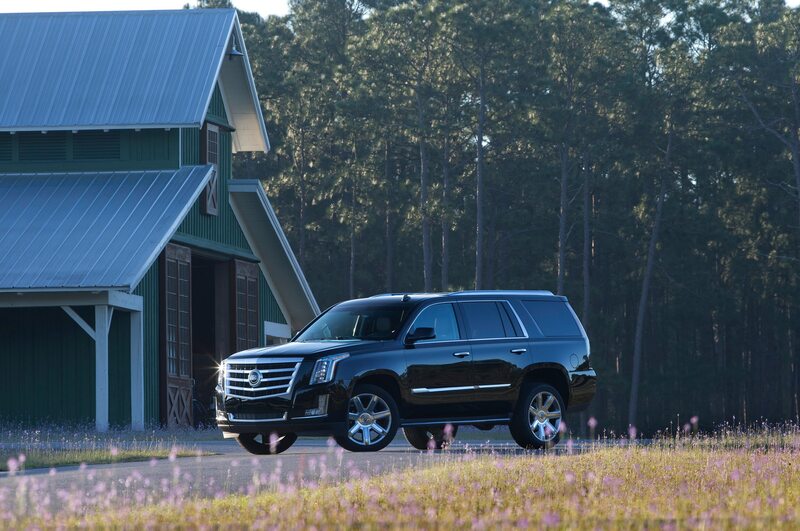 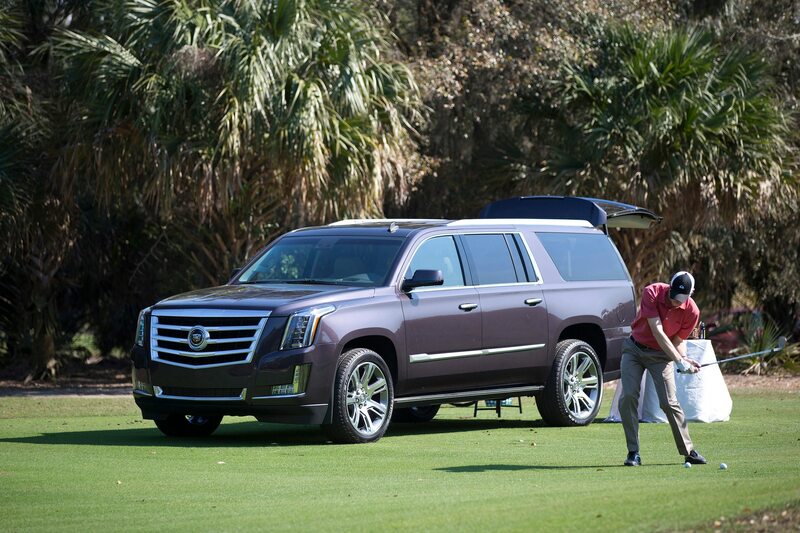 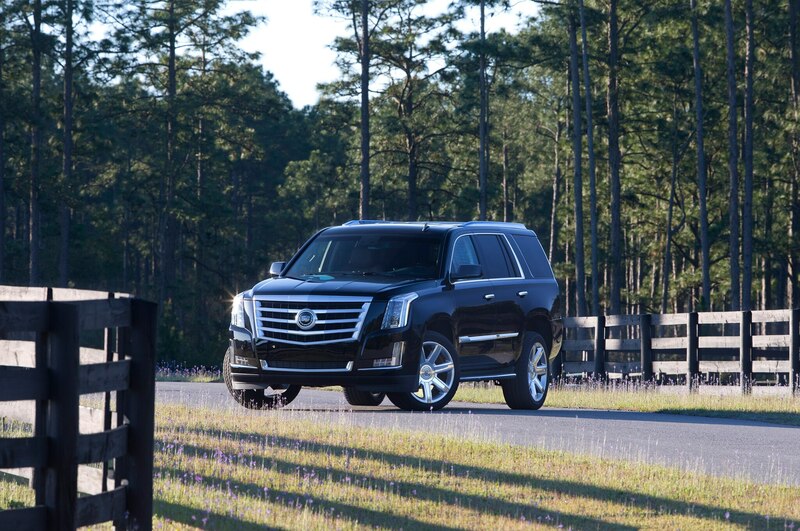 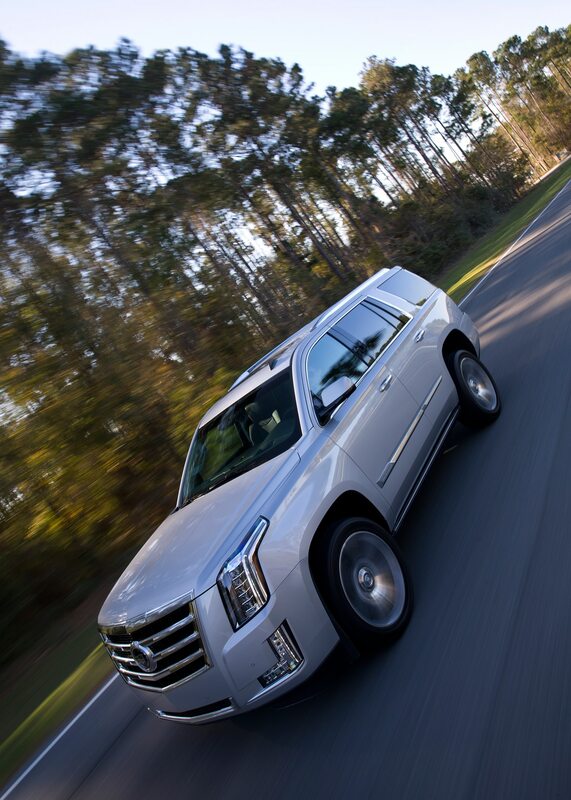 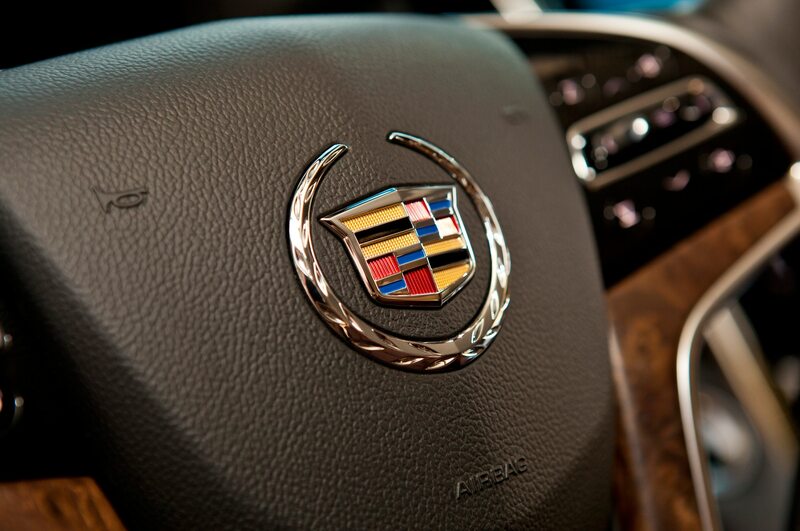 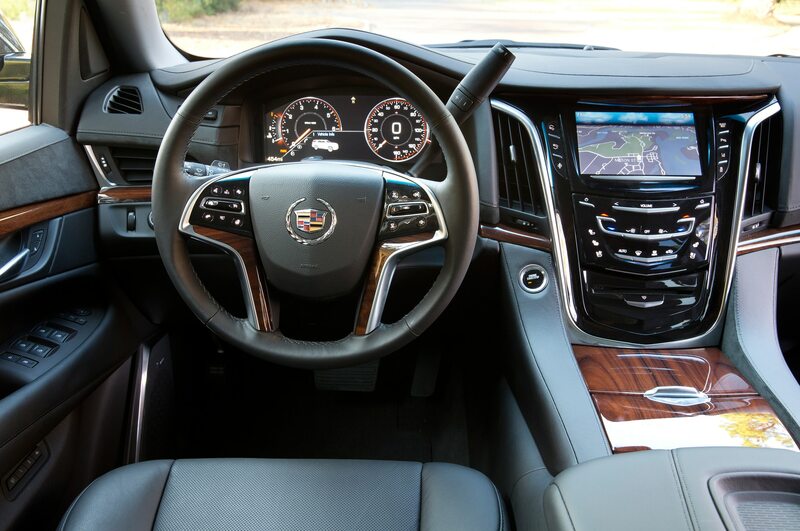 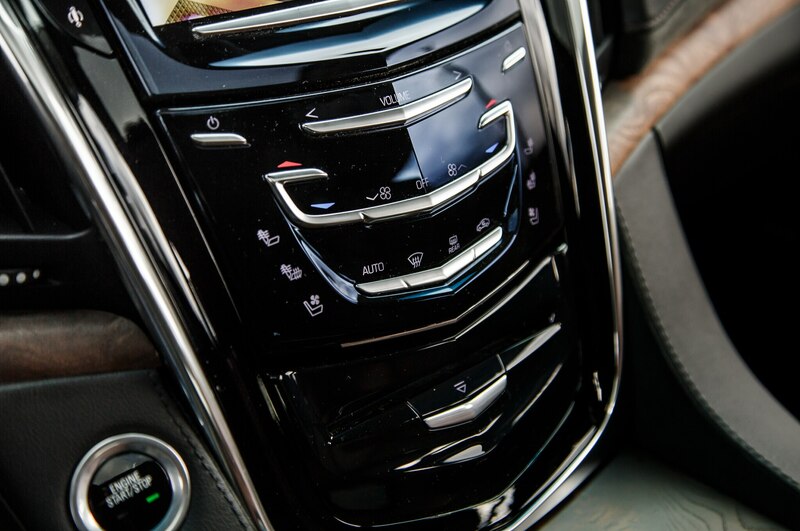 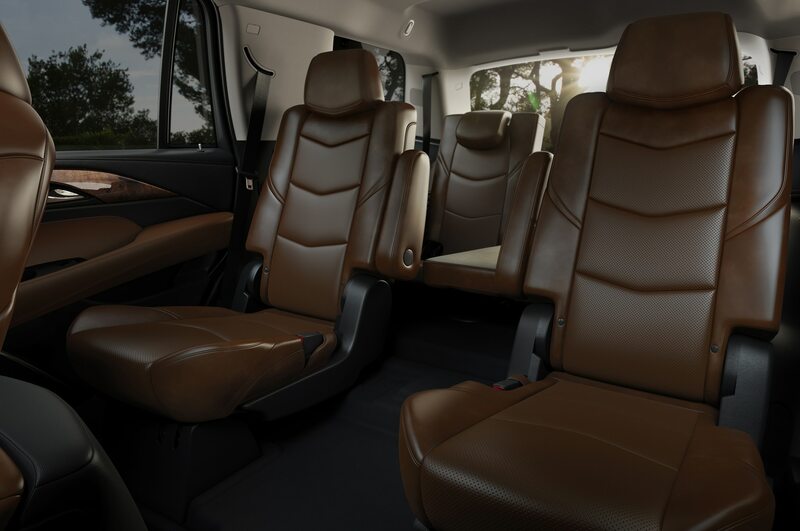 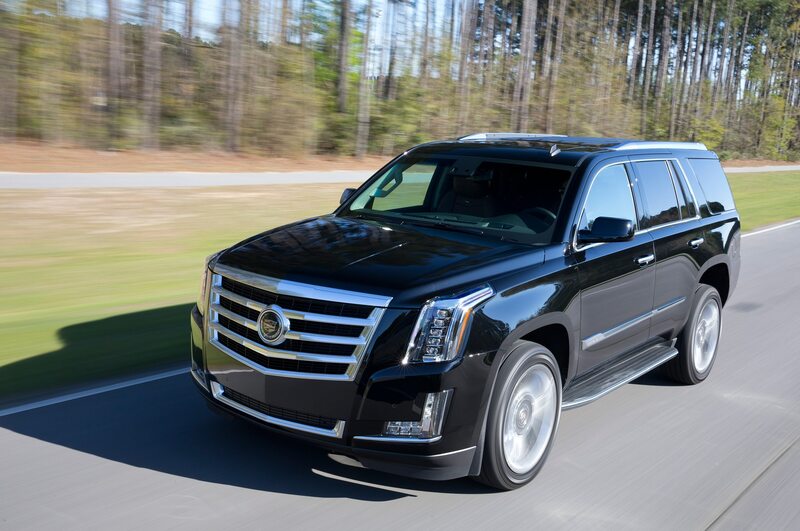 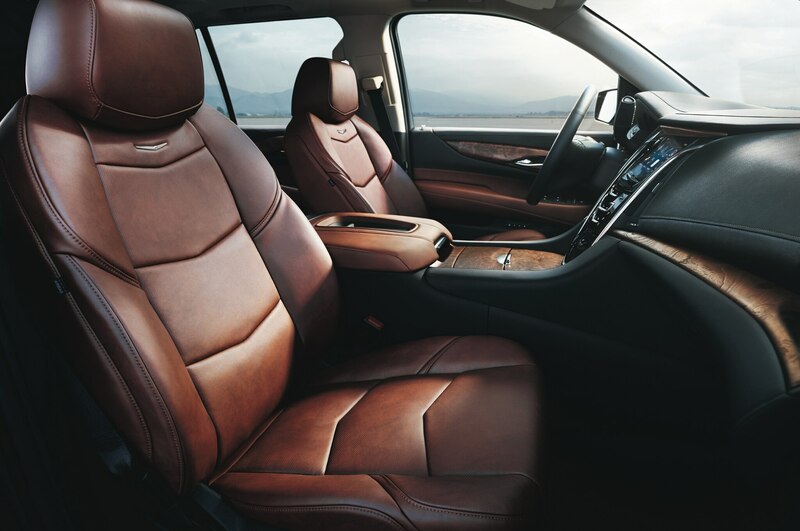 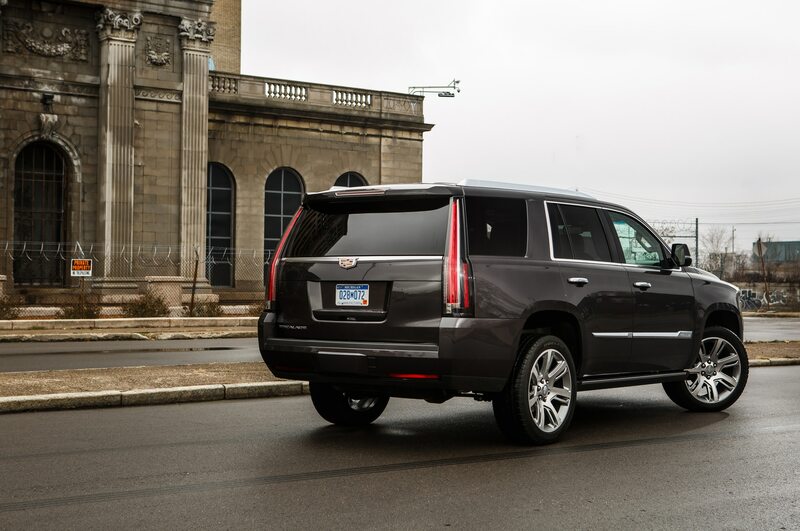 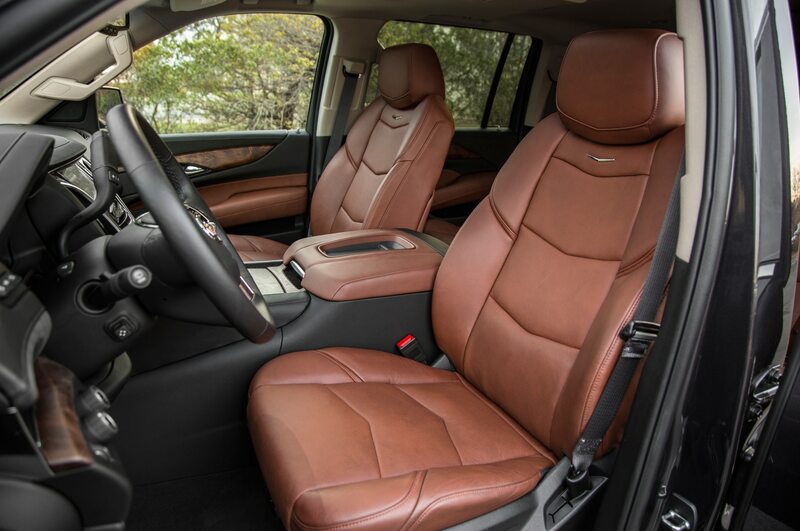 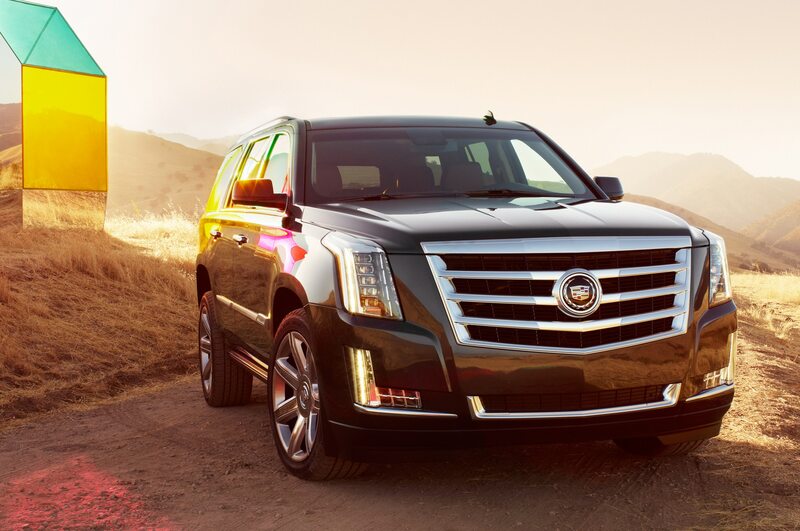 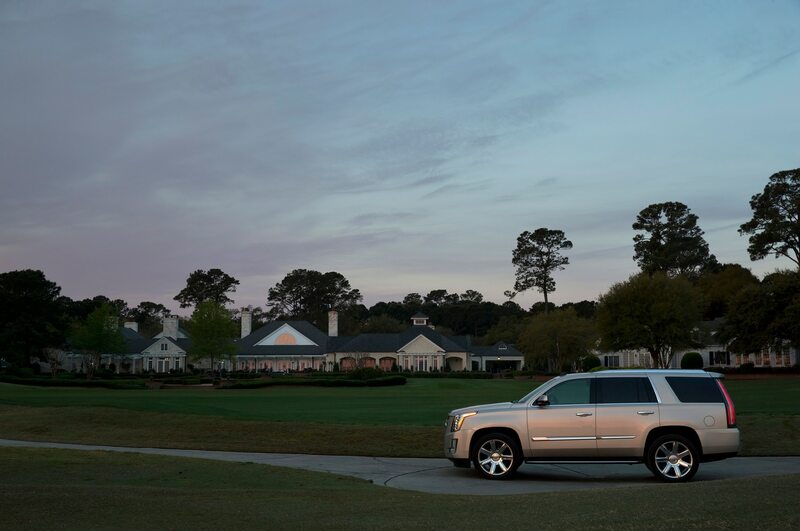 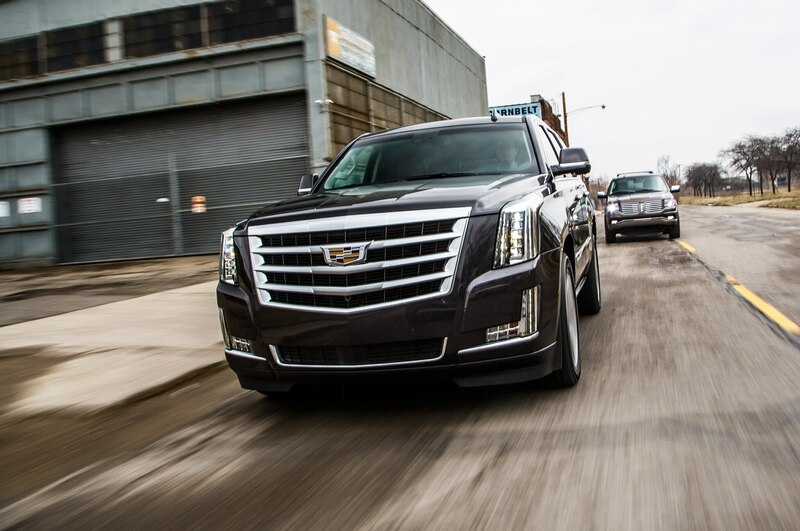 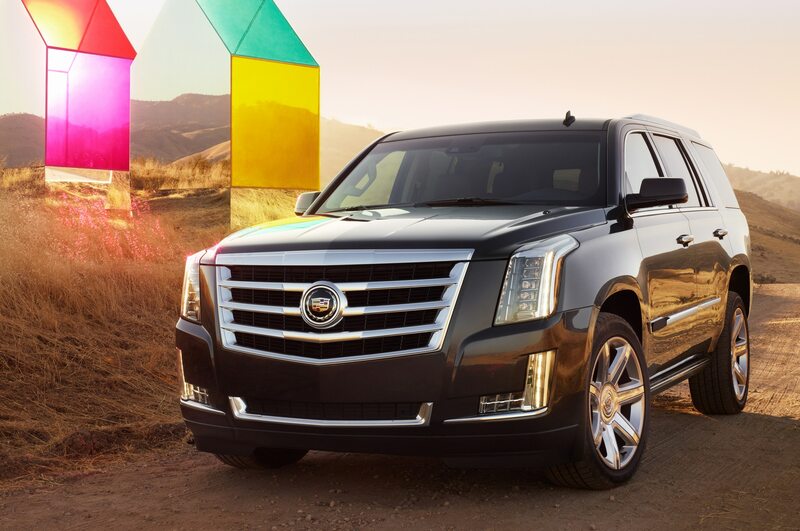 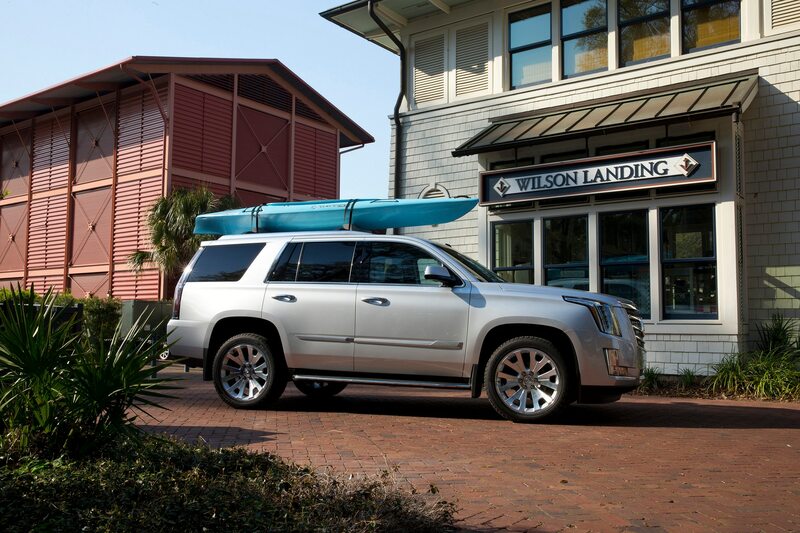 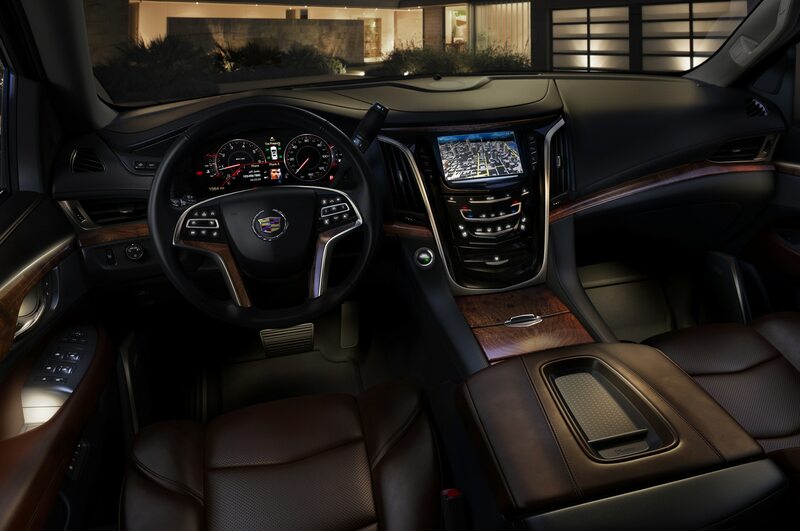 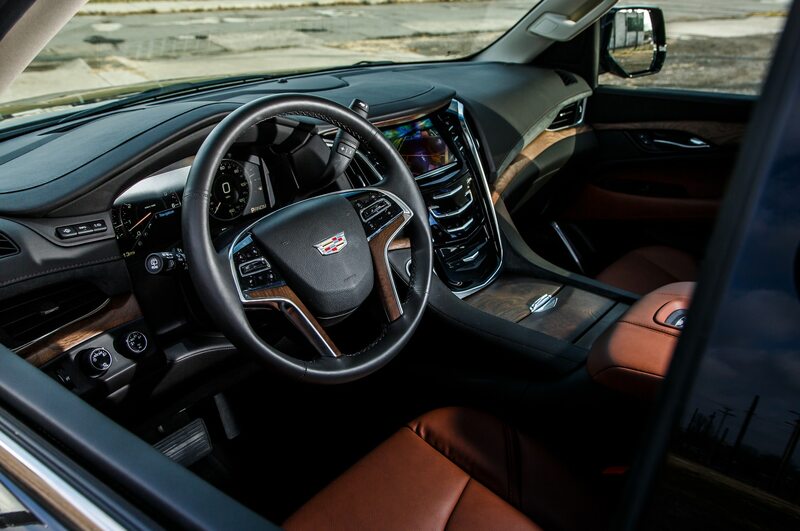 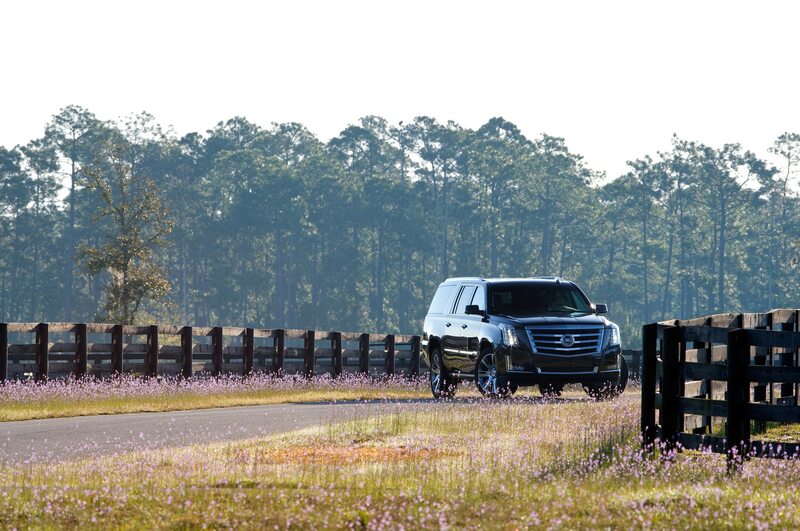 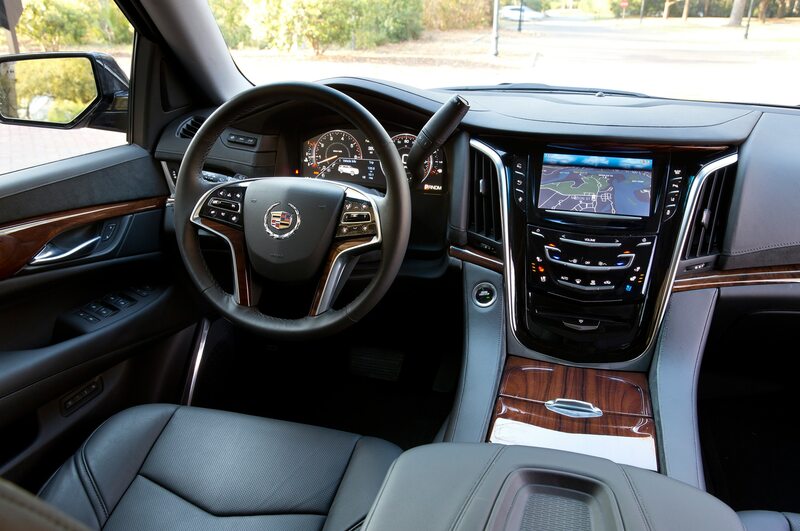 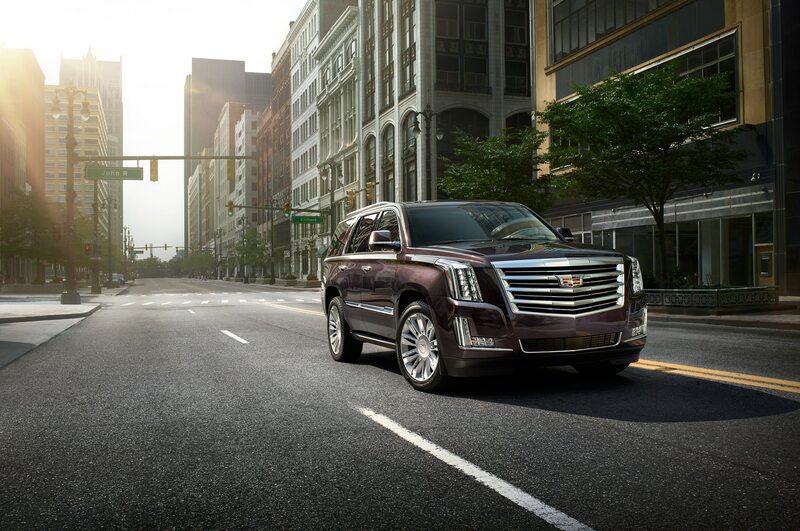 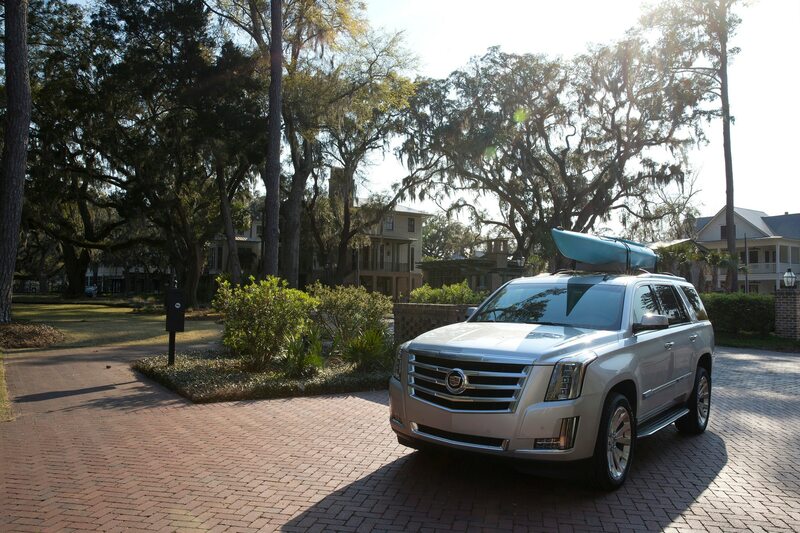 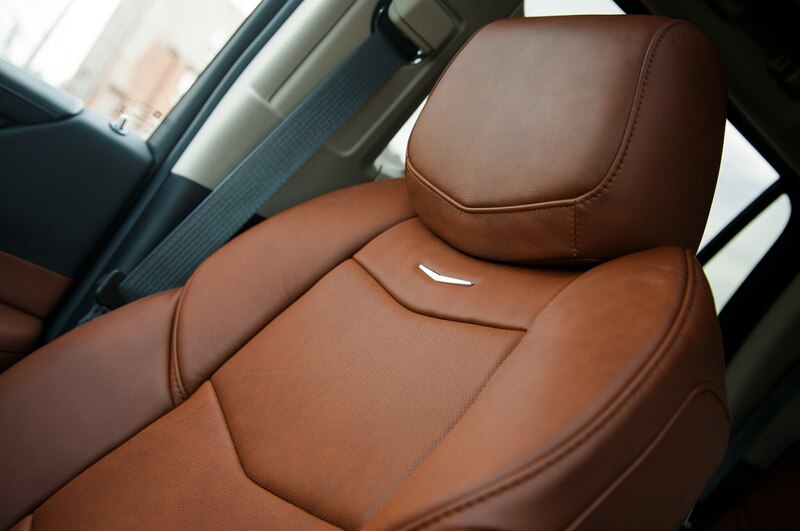 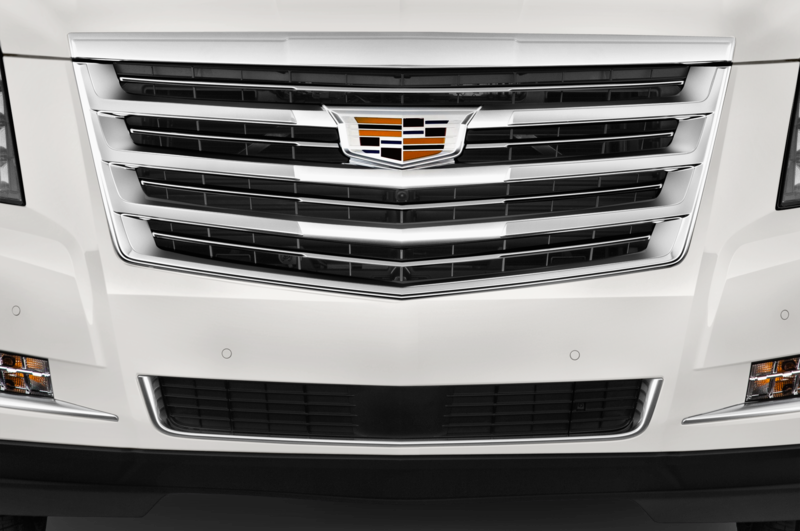 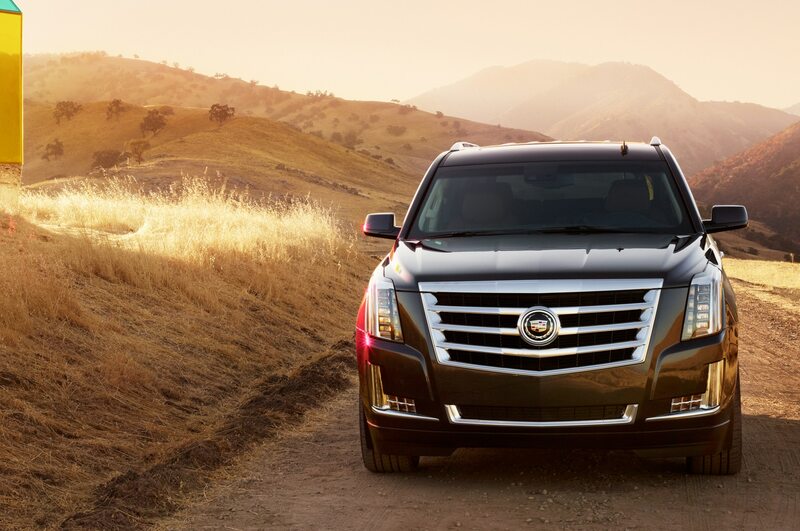 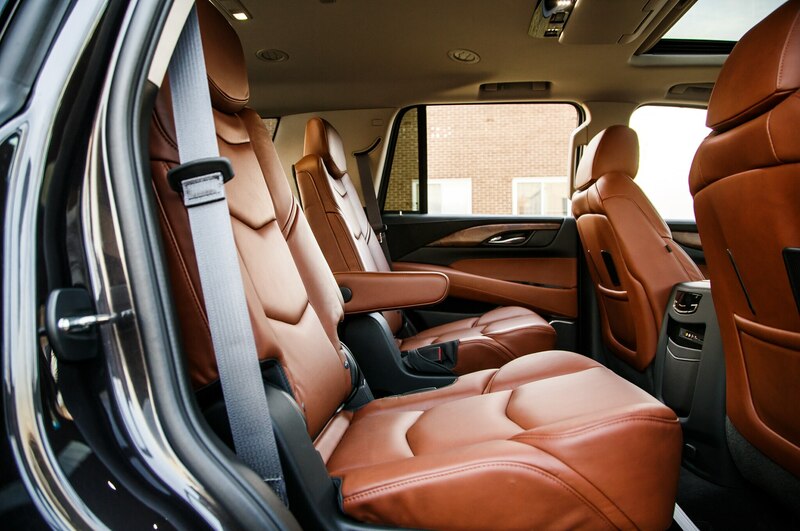 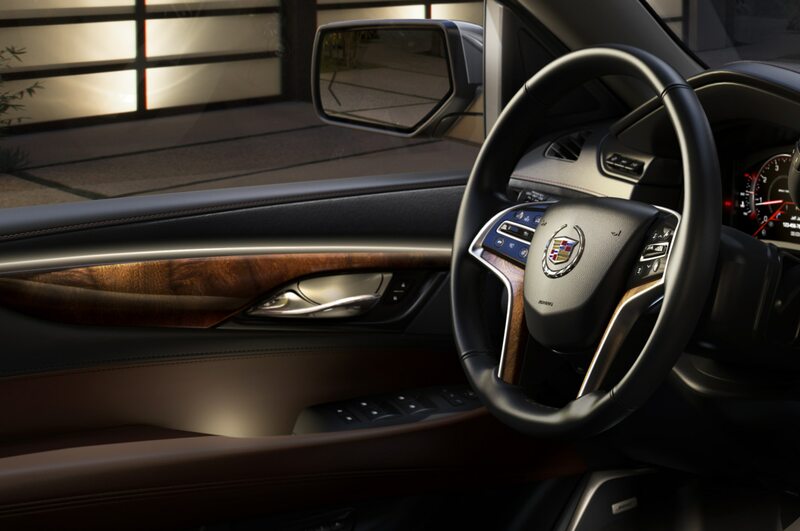 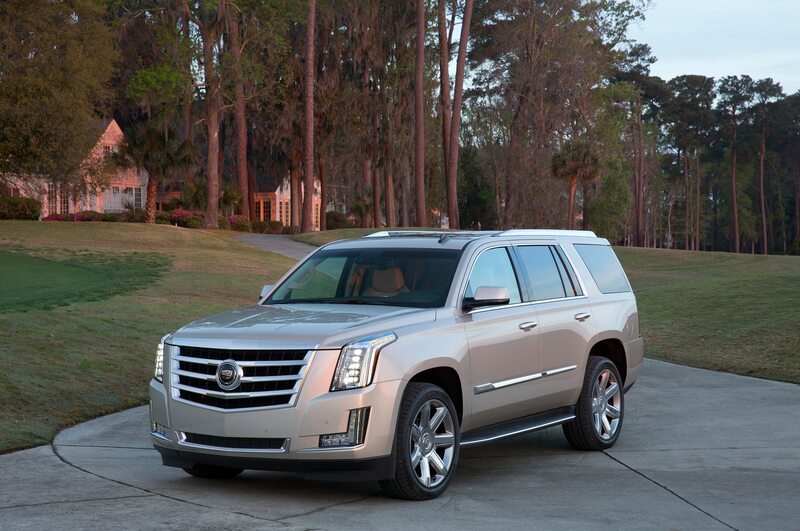 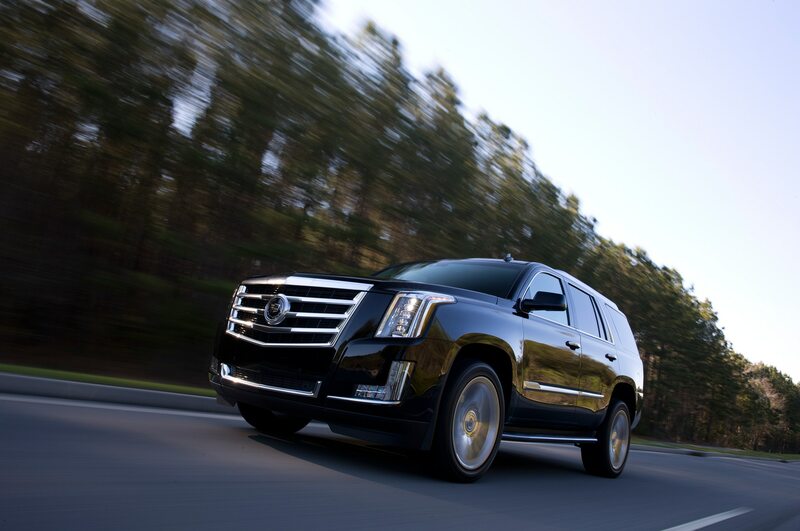 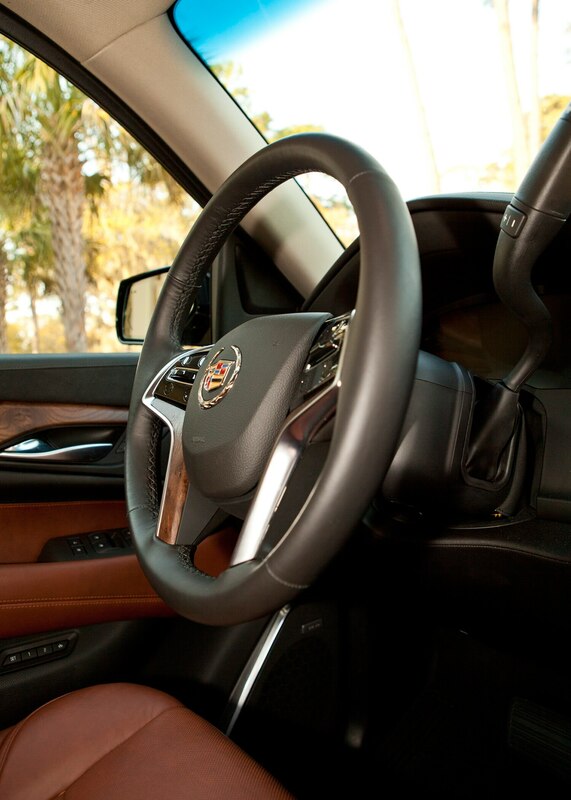 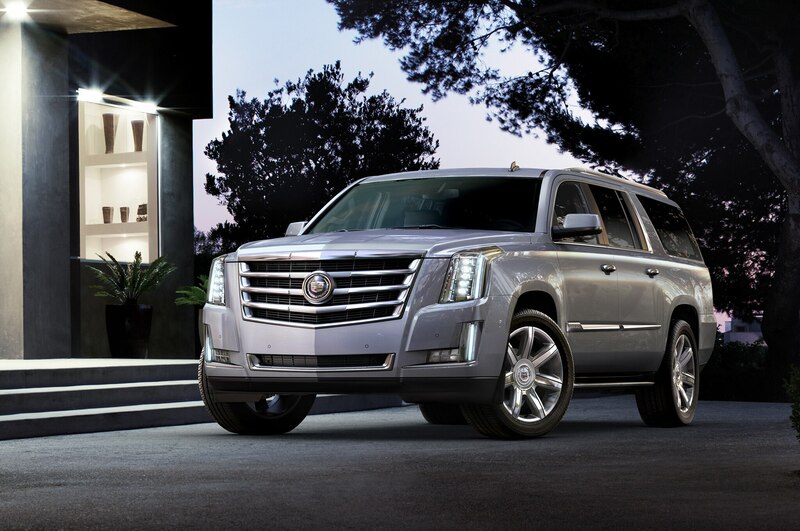 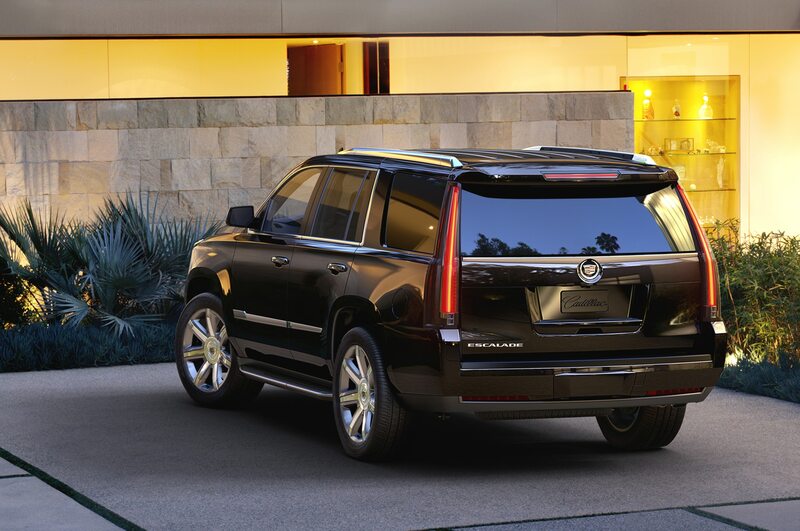 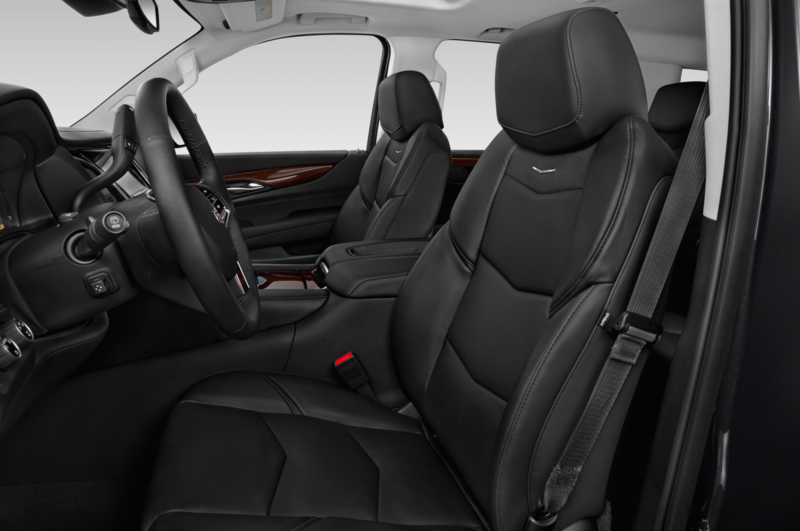 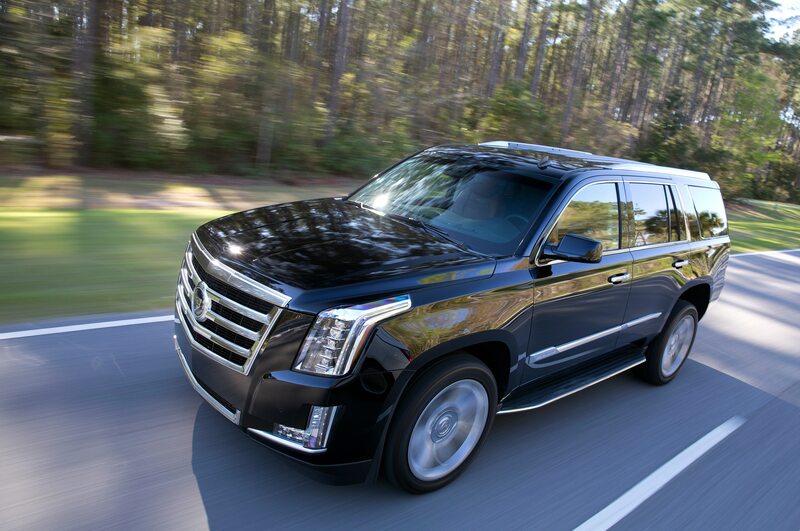 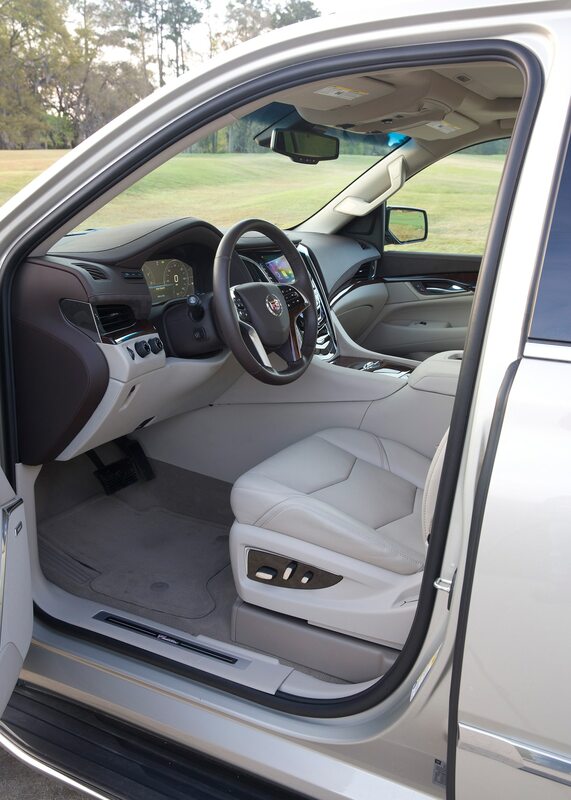 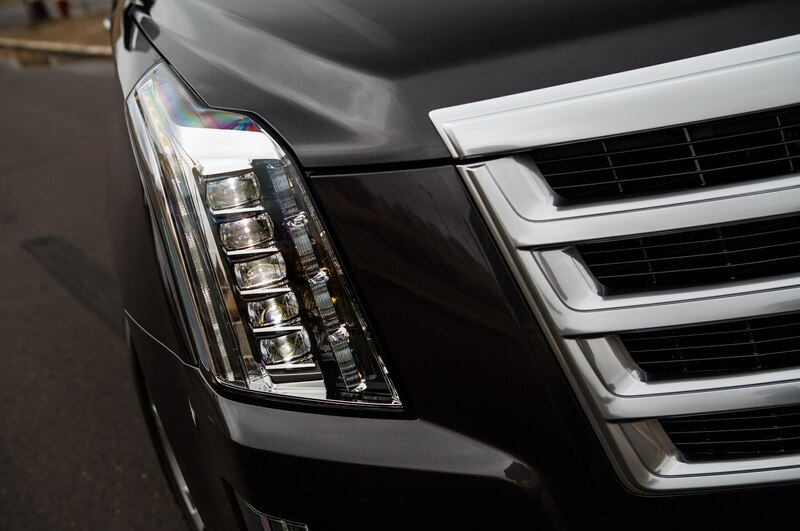 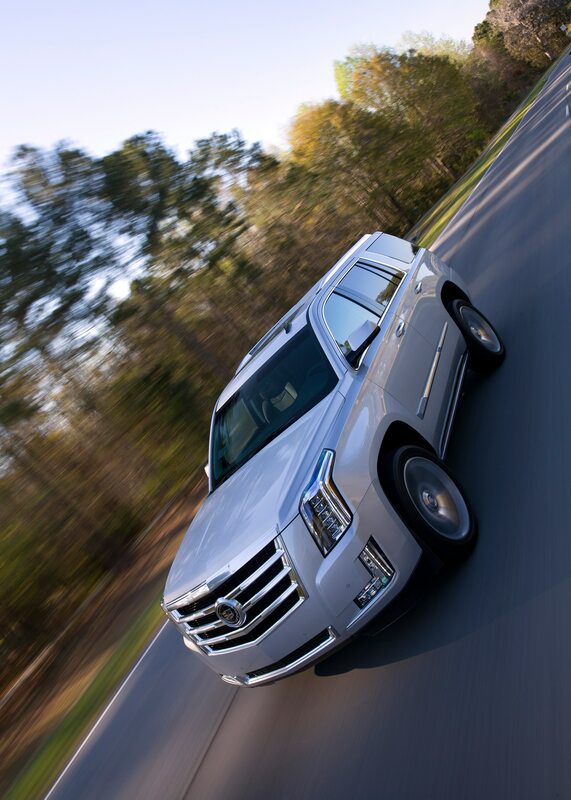 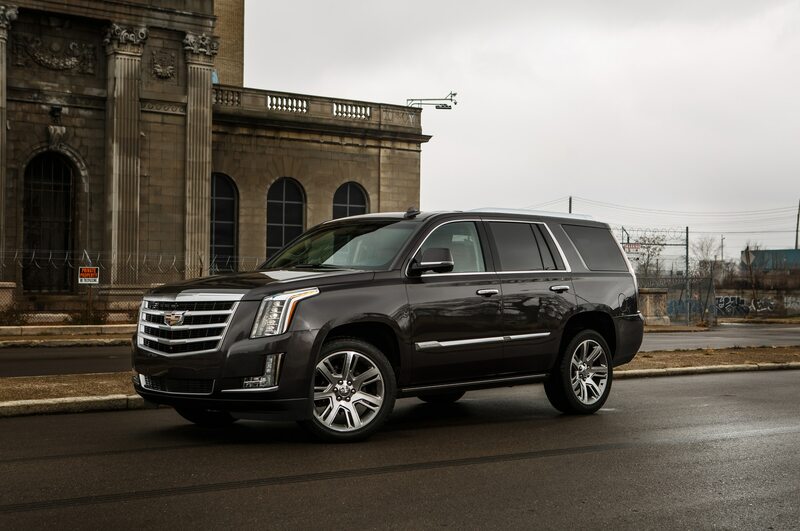 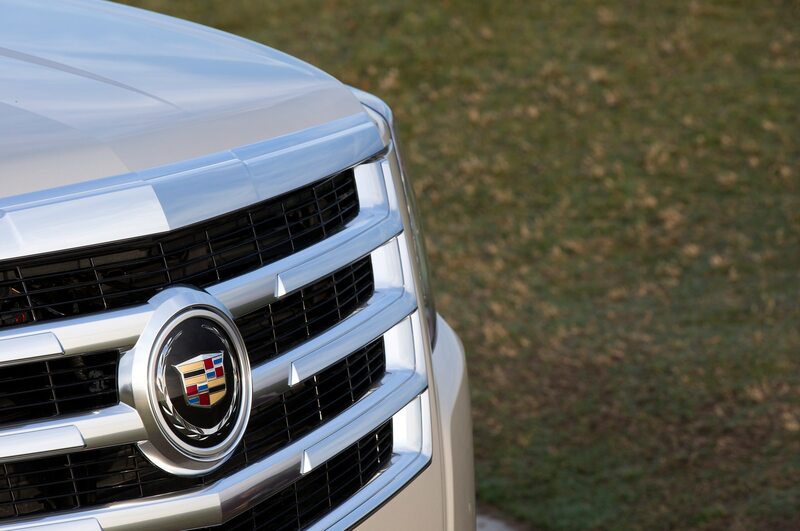 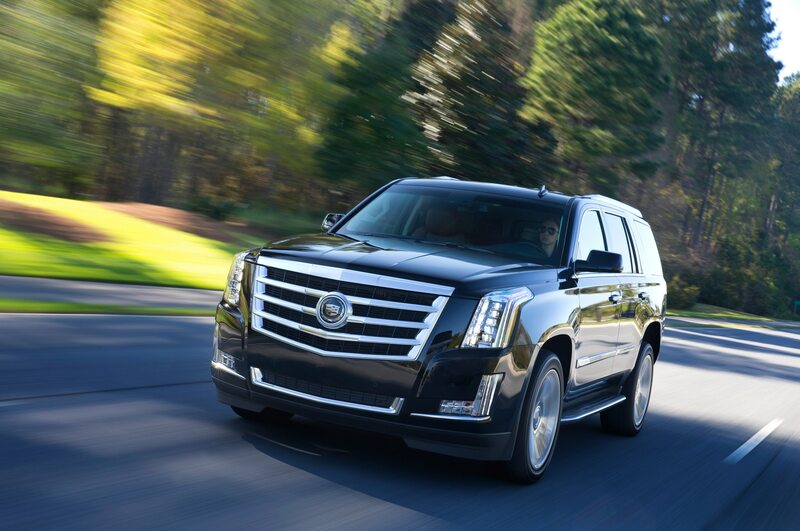 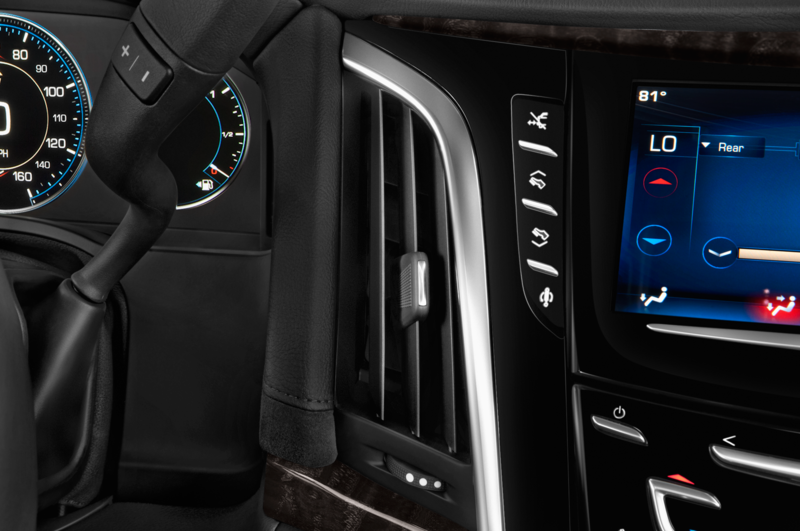 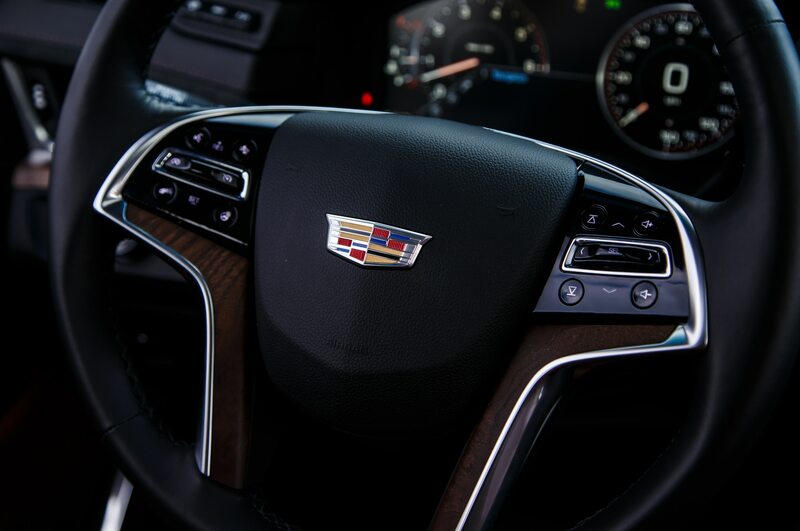 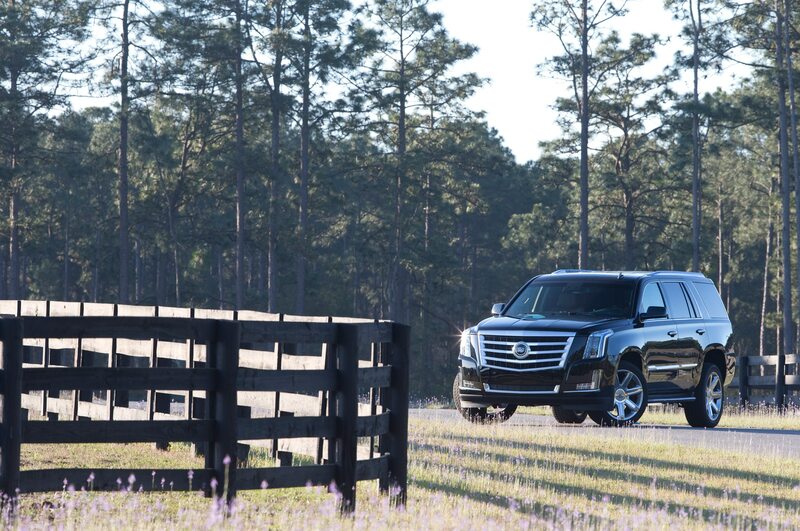 When you’re in the driver’s seat, it’s the 2015 Cadillac Escalade that impresses. 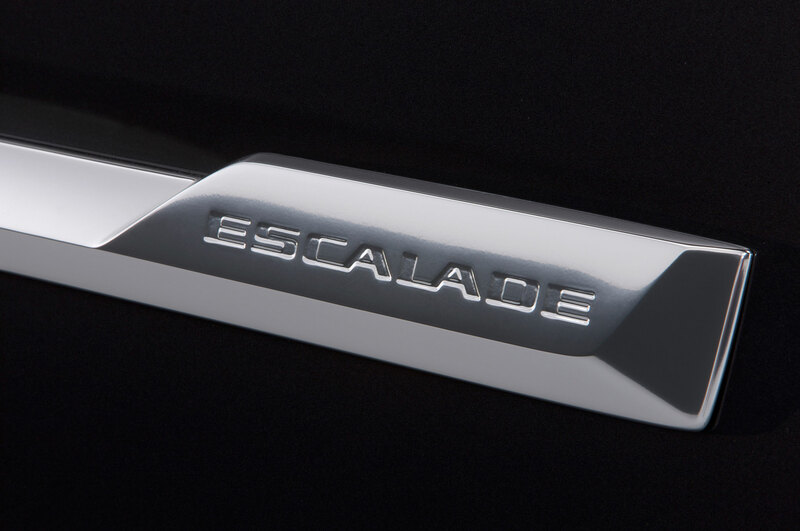 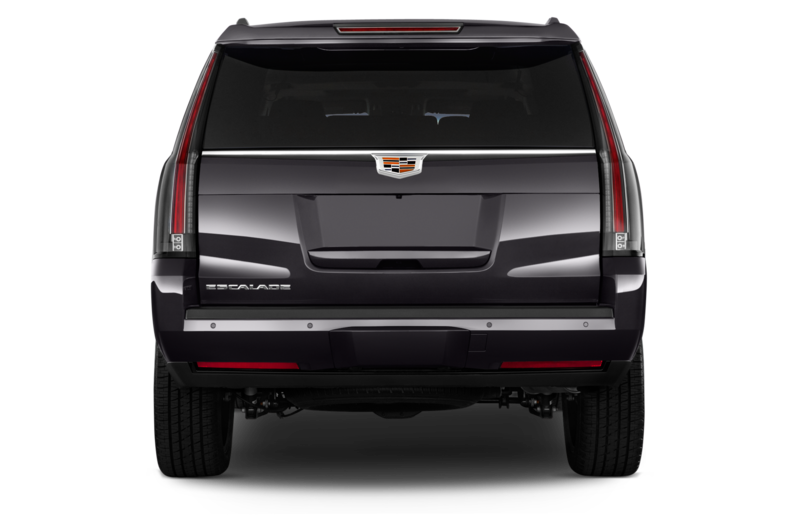 Though it remains a body-on-frame SUV, the newest Escalade has such carlike reflexes you can drive it like you would a much smaller crossover. 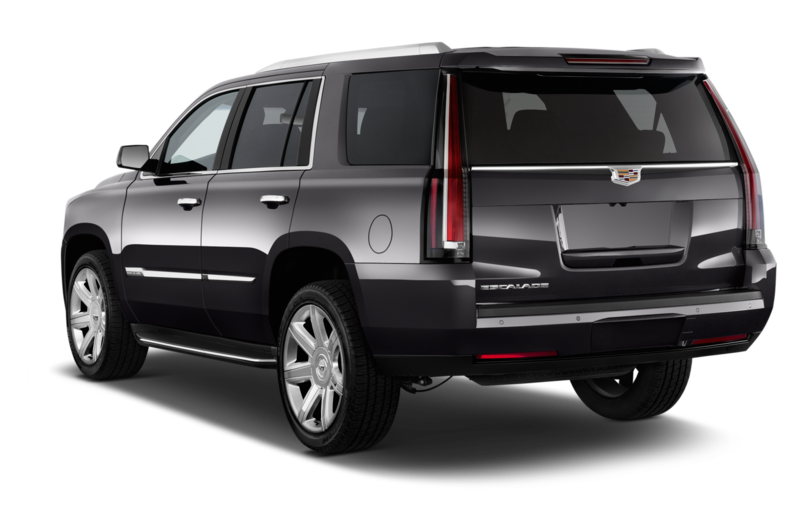 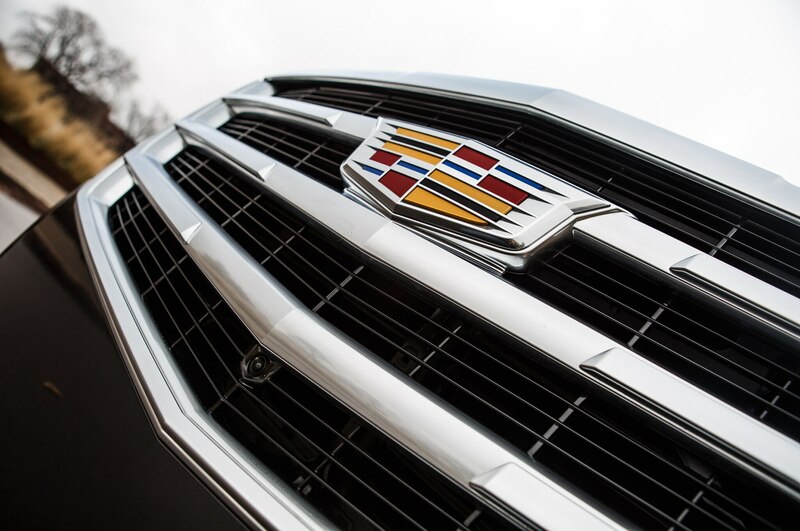 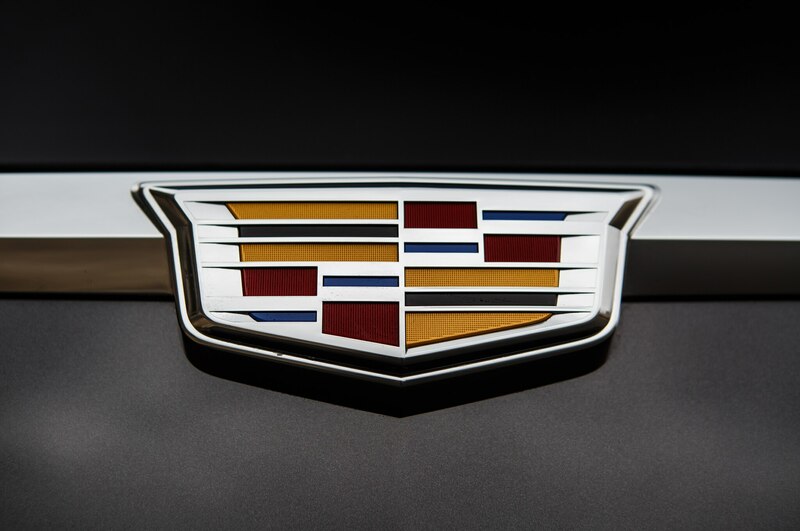 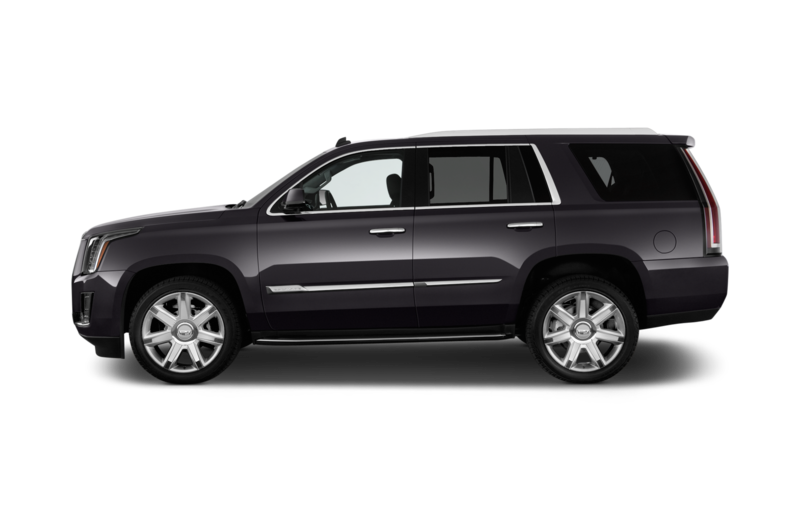 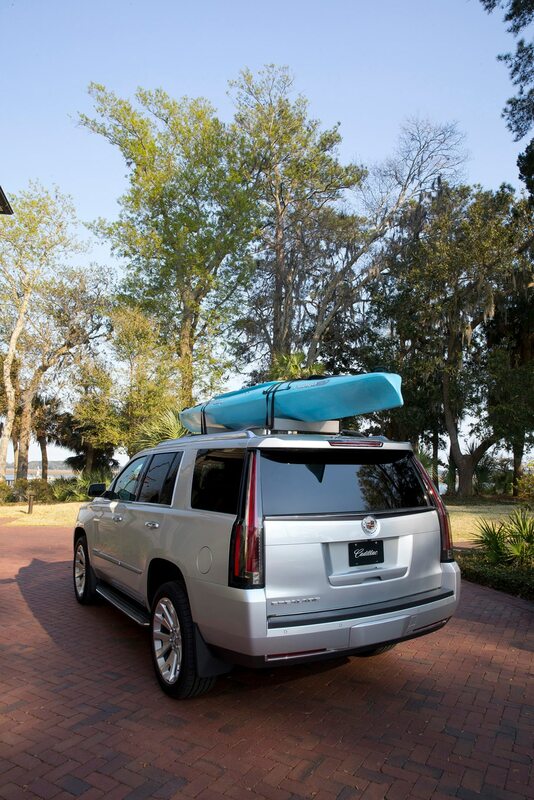 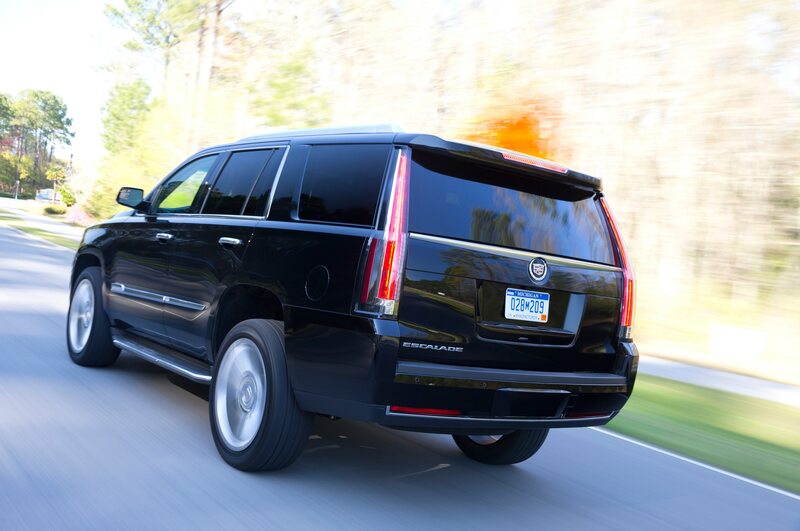 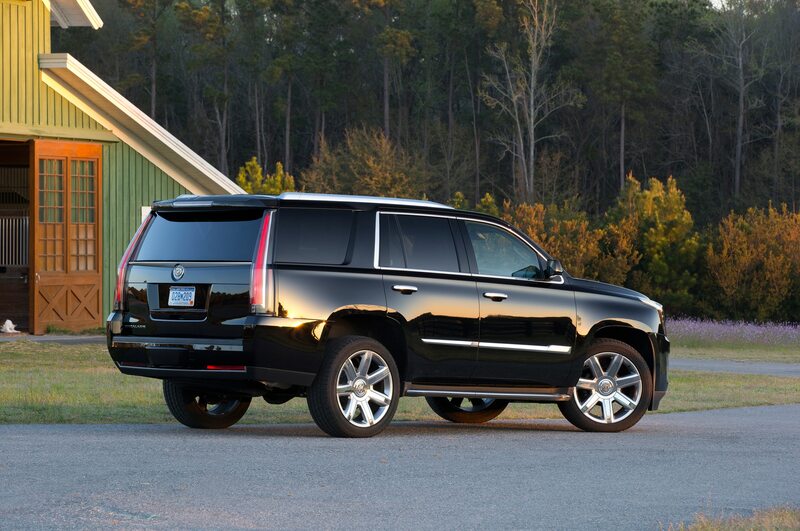 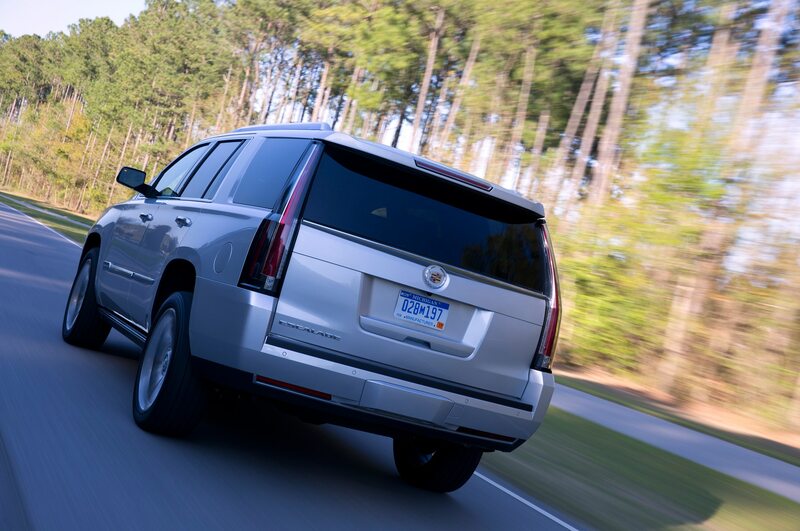 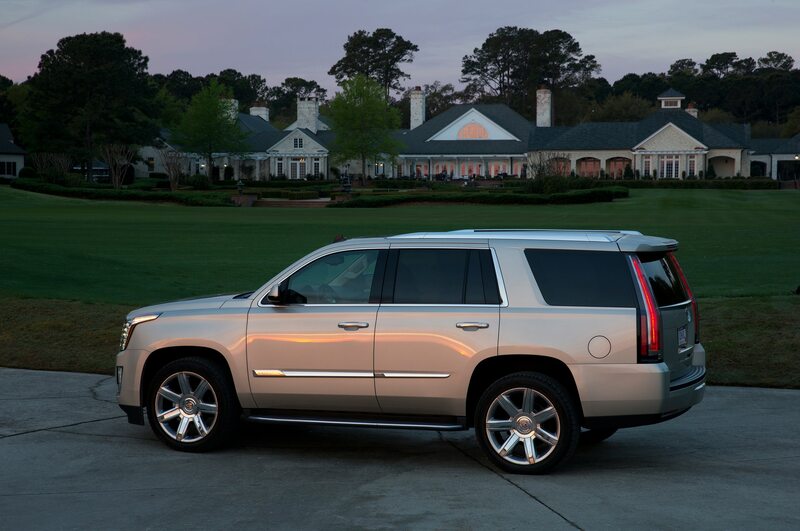 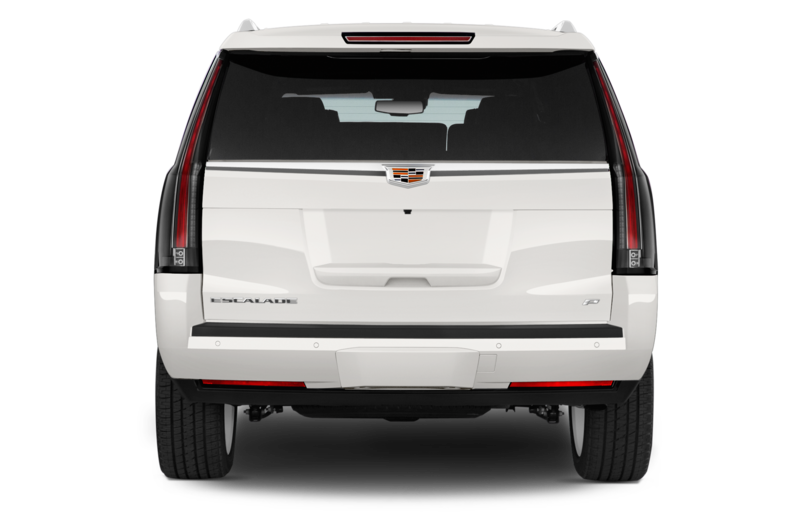 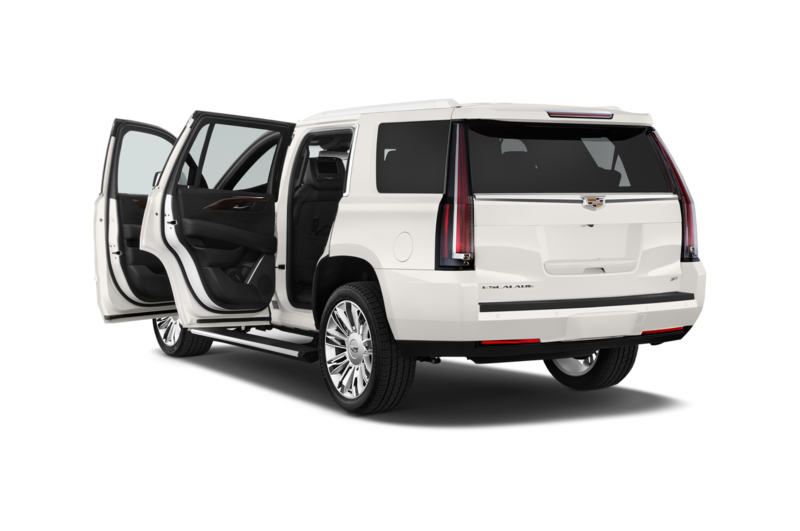 The Cadillac is nimble and composed, with light steering and little of the boatlike body roll of older Escalades. 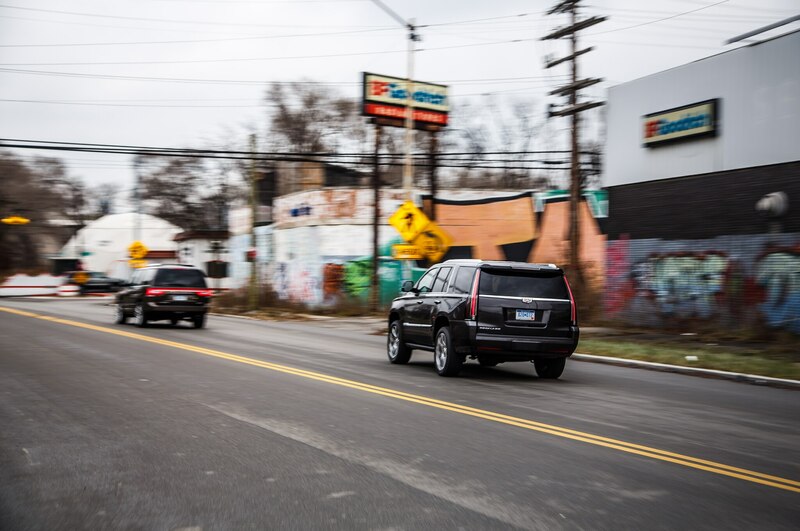 Despite the SUV’s length, we quickly find ourselves comfortable slipping in and out of freeway traffic, and we don’t even sweat when negotiating busy city streets. 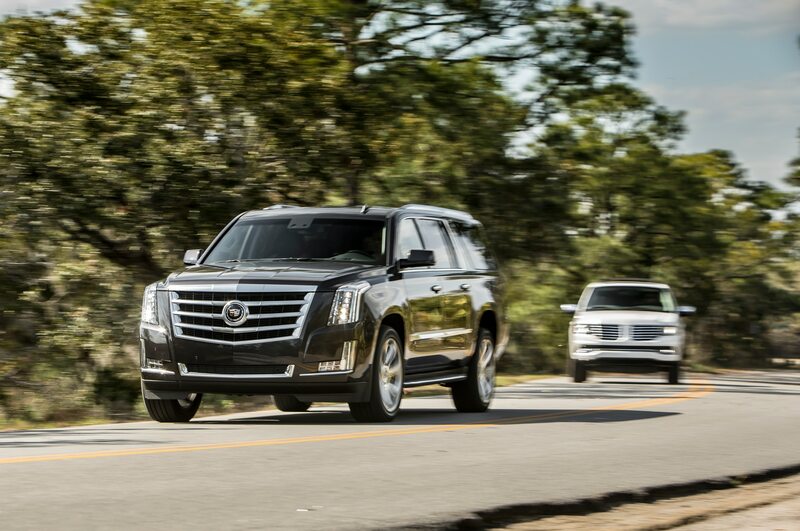 This is a thoroughly new, modern taste of how a big SUV should drive. 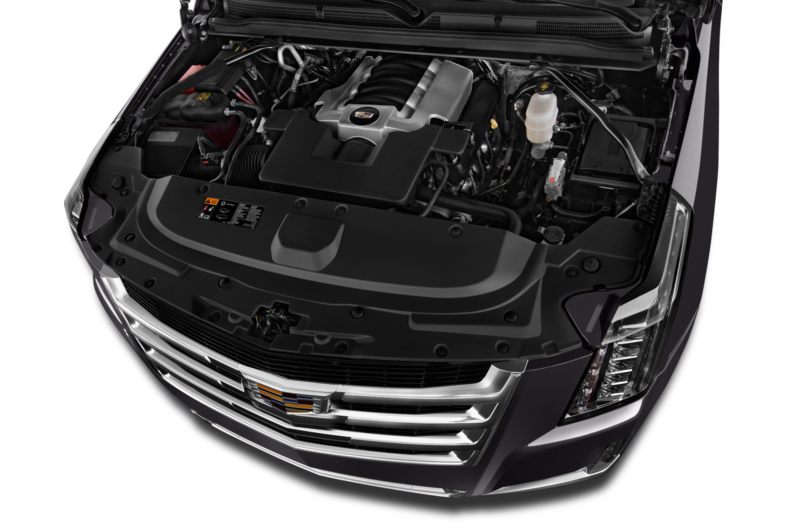 The 6.2-liter V-8 engine is a bit of a throwback, but with cylinder deactivation and an eight-speed automatic transmission, fuel efficiency is up to an acceptable level for such a large, capable vehicle. 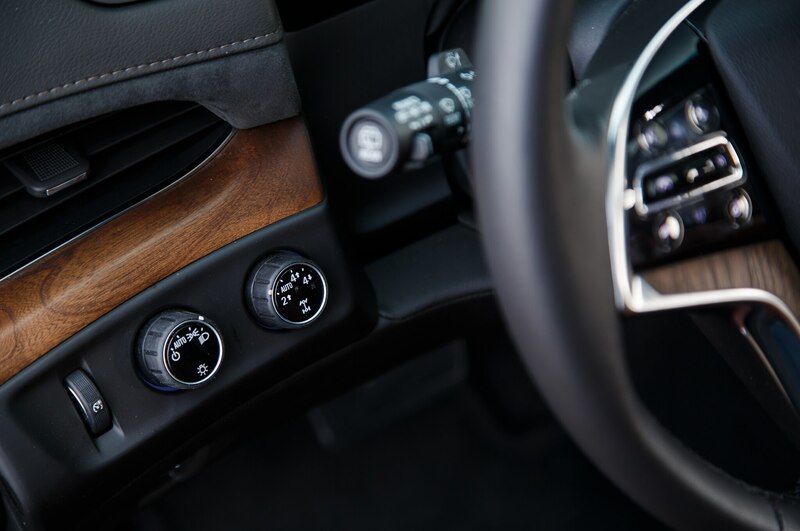 We still love that hearty pushrod power when accelerating onto the highway, the eight-speed changes gears so deftly as to be unnoticeable to most drivers. 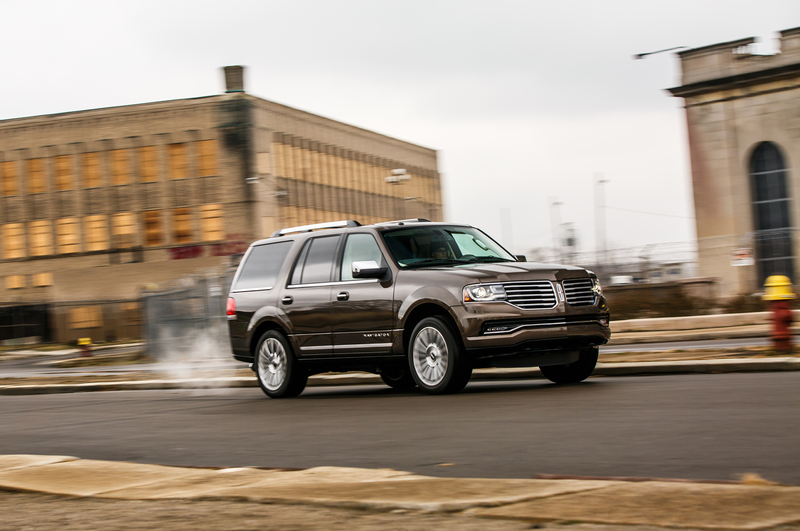 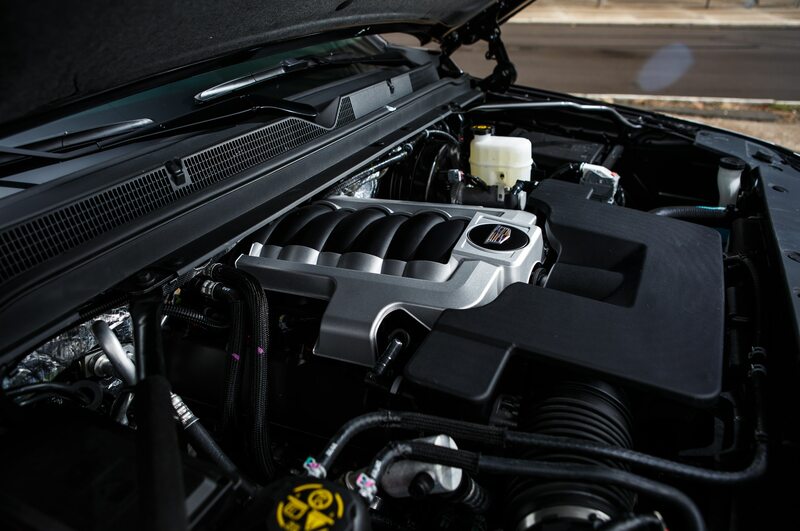 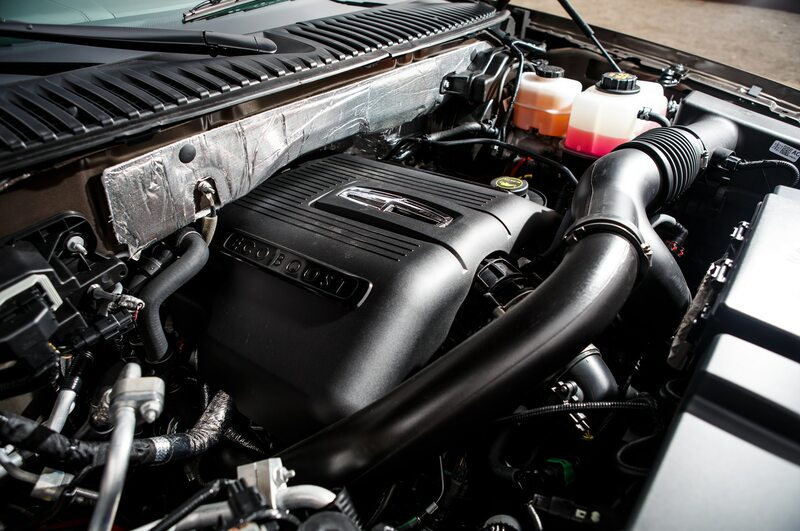 The 2015 Lincoln Navigator has dropped its V-8, hoping that the popular 3.5-liter twin-turbo EcoBoost V-6 is the replacement for displacement. 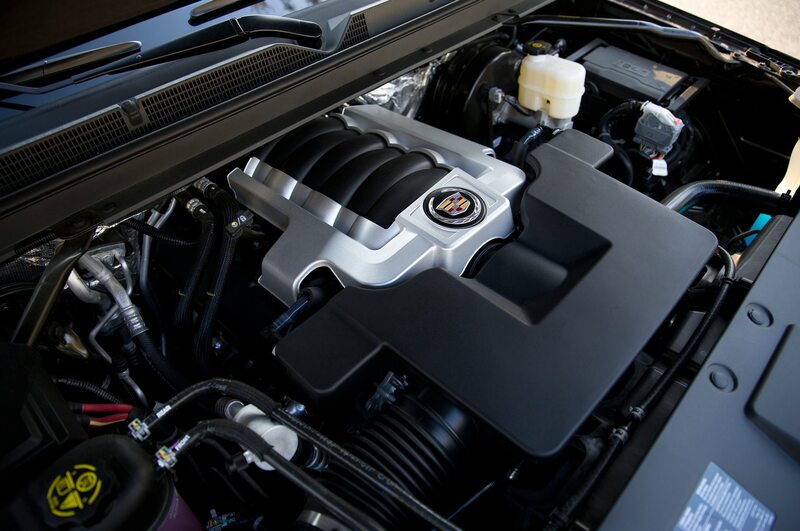 The engine makes 40 fewer horsepower than the Cadillac’s V-8 and certainly doesn’t sound as good. 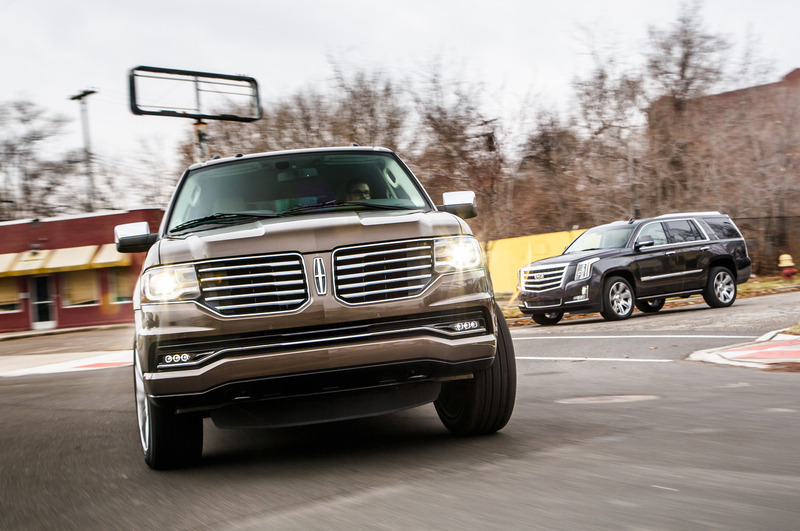 But the EcoBoost’s torque curve swells so much earlier in the rev range (2,750 rpm versus 4,100 rpm in the Escalade) that the Navigator more definitively shoves you into your leather seat. 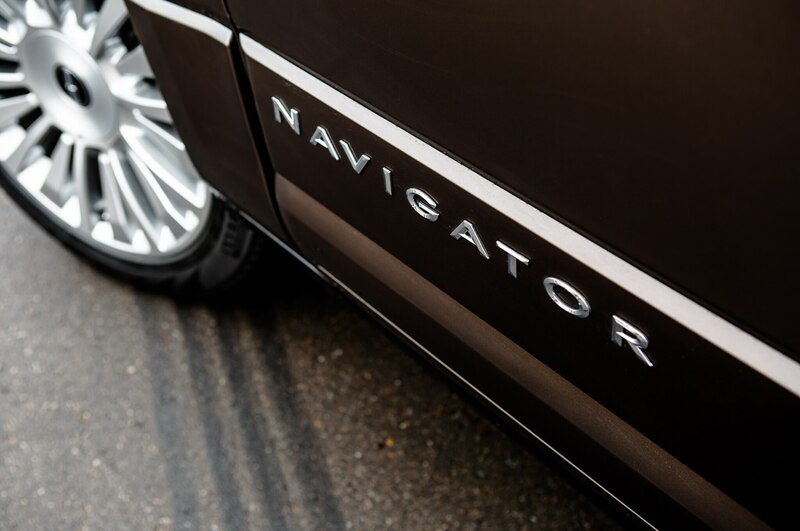 The rest of the Navigator driving experience is less modern, reminding us more so than does the Escalade that these luxomobiles are essentially body-on-frame pickups. 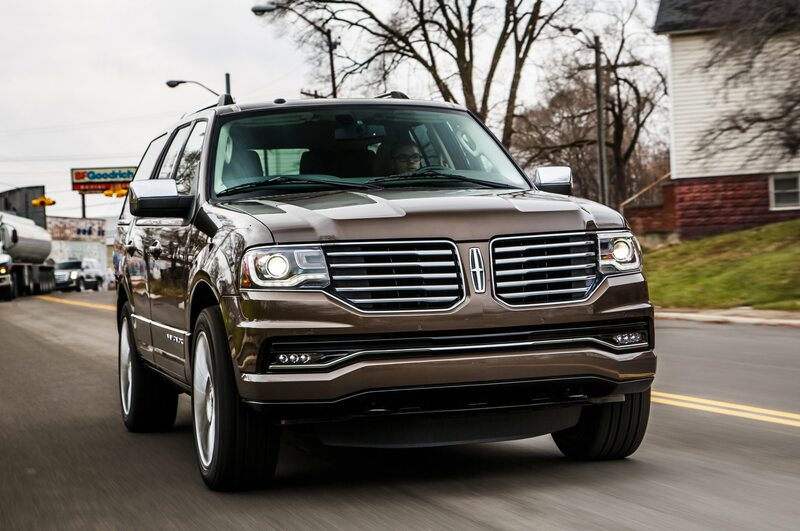 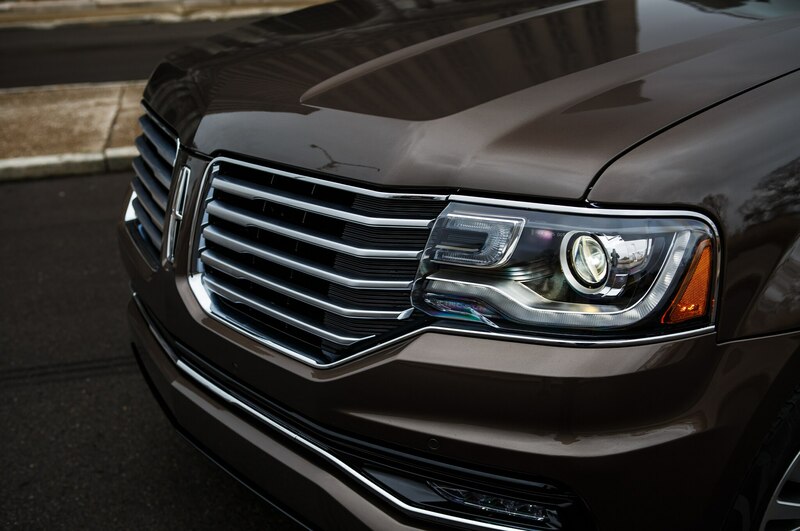 Despite its Continuously Controlled Damping adaptive suspension, the Lincoln’s heavy steering and extreme body roll sap any confidence to thread the Navigator into smaller gaps. 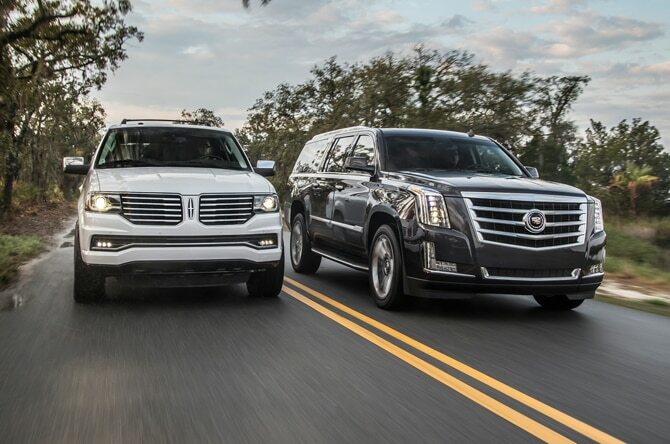 If the Escalade drives like it’s 80 percent of its real size, the Navigator feels 10 percent larger than it really is. 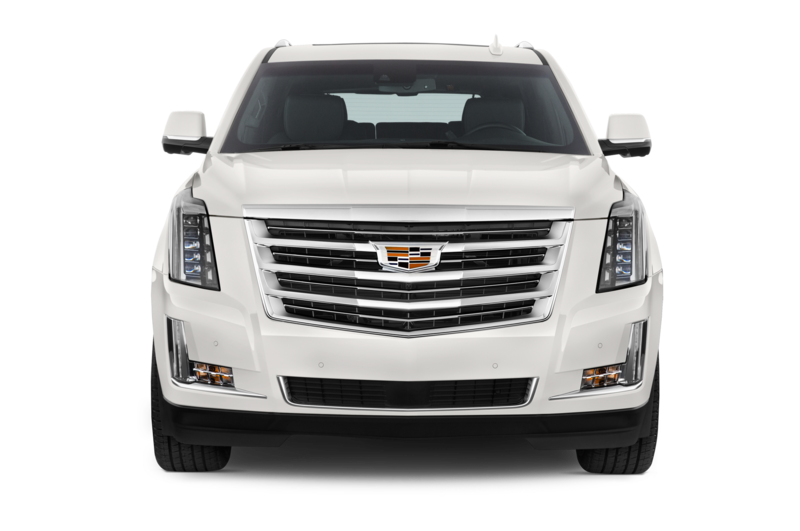 Where Cadillac has made its full-size SUV easy and almost fun to drive, piloting the Lincoln is still something of a chore. 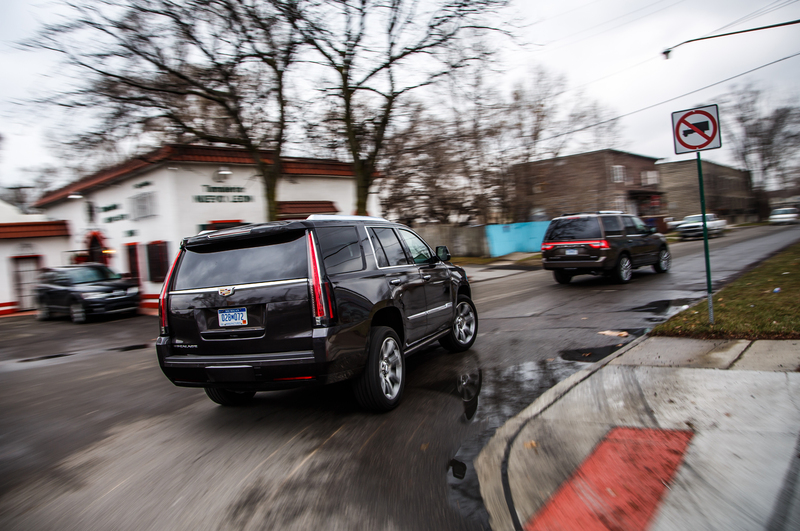 At the pump, the SUVs return basically the same fuel efficiency. 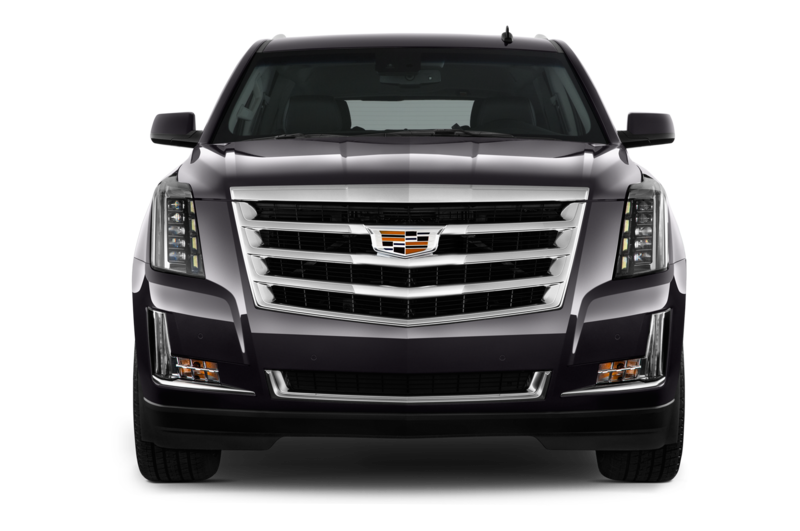 The ability of Cadillac to shut off several cylinders, plus the super-low cruising rpm enabled by its eight-speed transmission, versus the six-speed in the Lincoln, actually allows the big V-8 to score 1 mpg better on the highway than Ford’s downsized V-6. 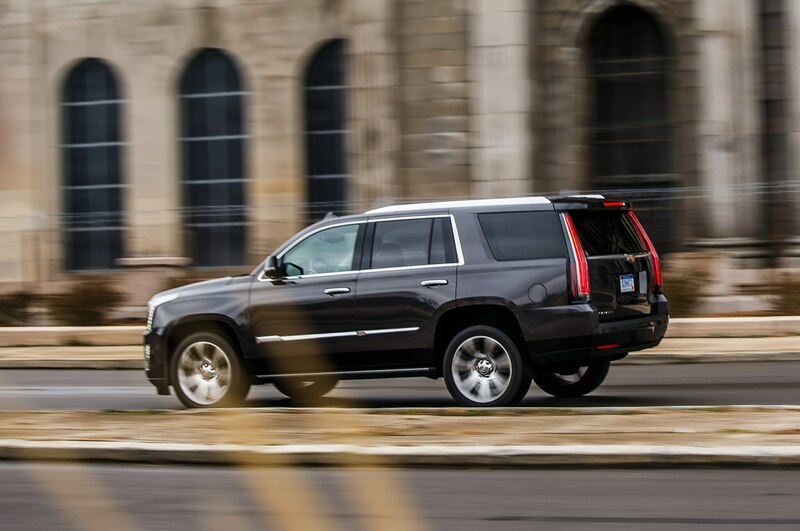 Both manage 17 mpg in the city, which isn’t bad for a large, four-wheel-drive SUV but still sounds rather low by modern standards. 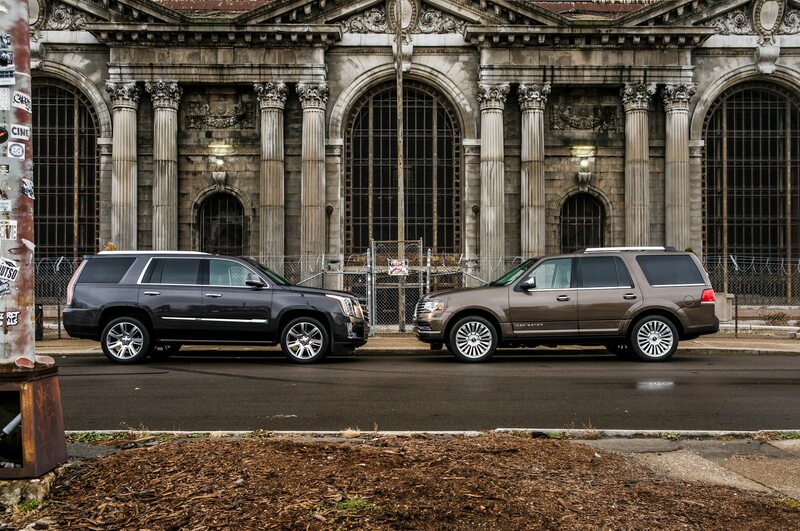 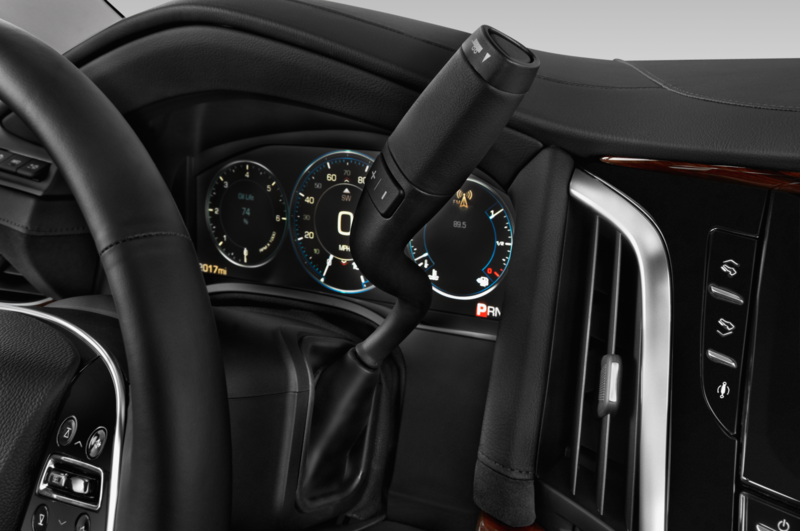 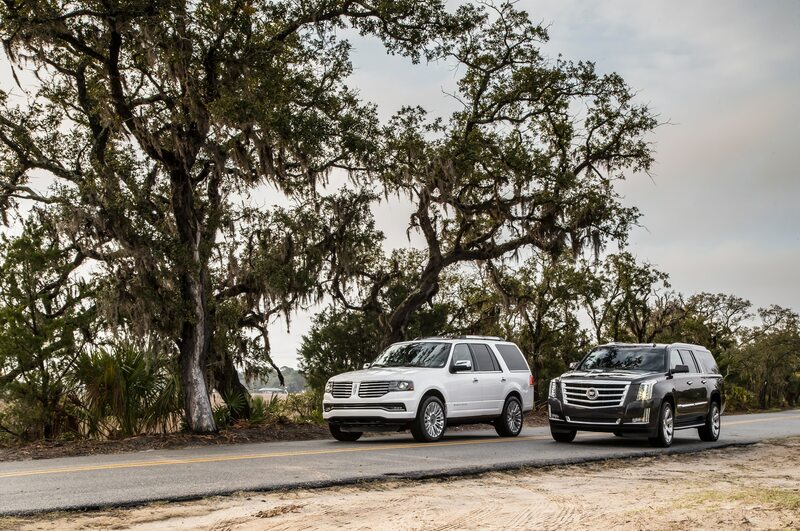 The 2015 Cadillac Escalade and the 2015 Lincoln Navigator are the Shinola watches of the luxury SUV world. 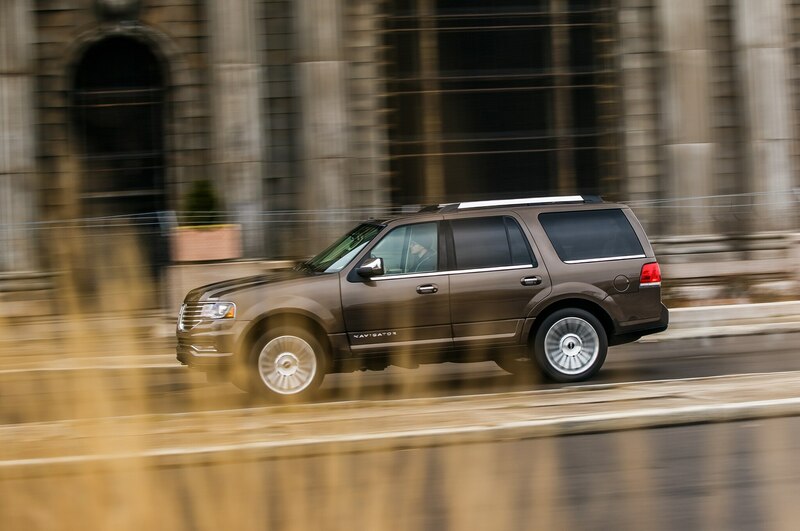 Prettier and more finely crafted than a Chevy Tahoe, Ford Expedition — the comparative Timexes of this segment — but no more functional, the Escalade and Navigator appeal to shoppers for purely subjective reasons: style, interior luxuries, badge prestige, conspicuous consumption. 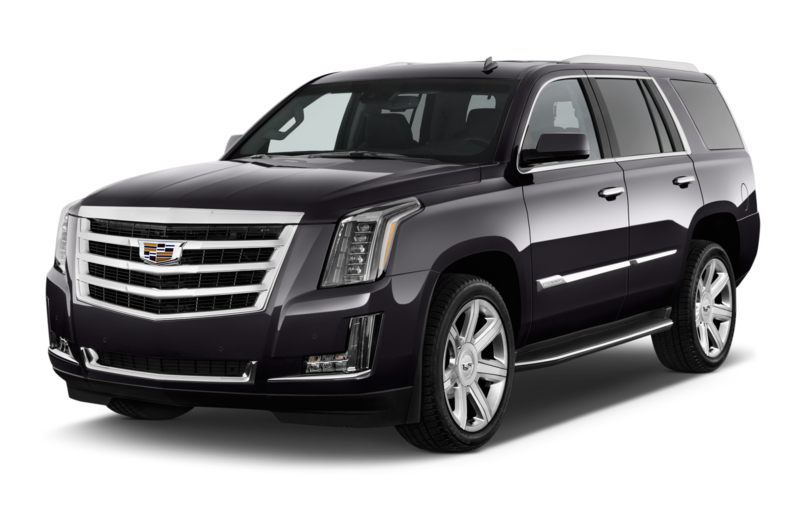 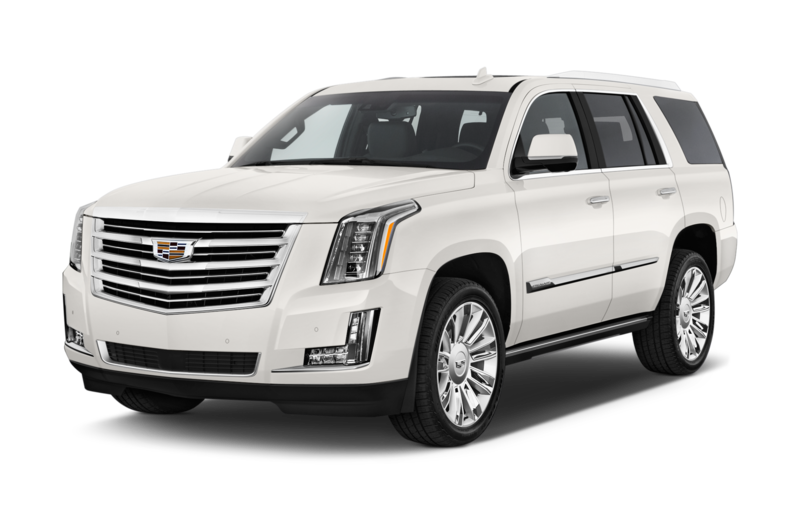 If you want a full-size luxury SUV, push aside rational concerns that the Lincoln is roomier and more affordable, and treat yourself to the glitzy 2015 Cadillac Escalade. 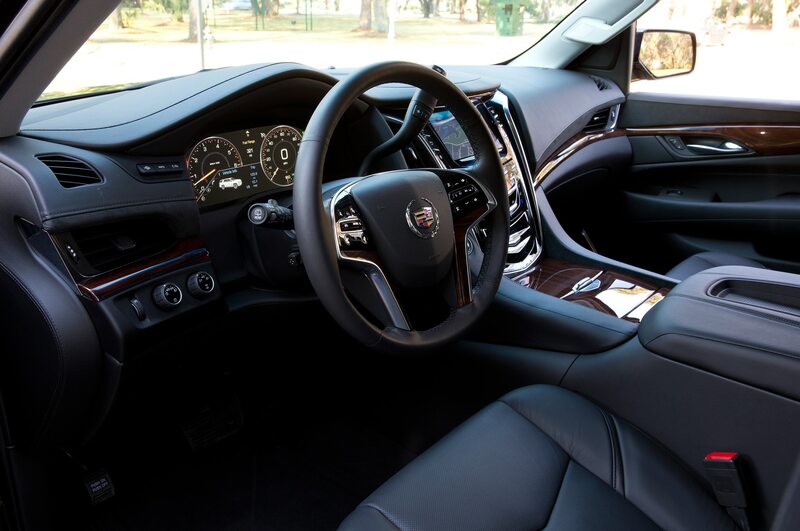 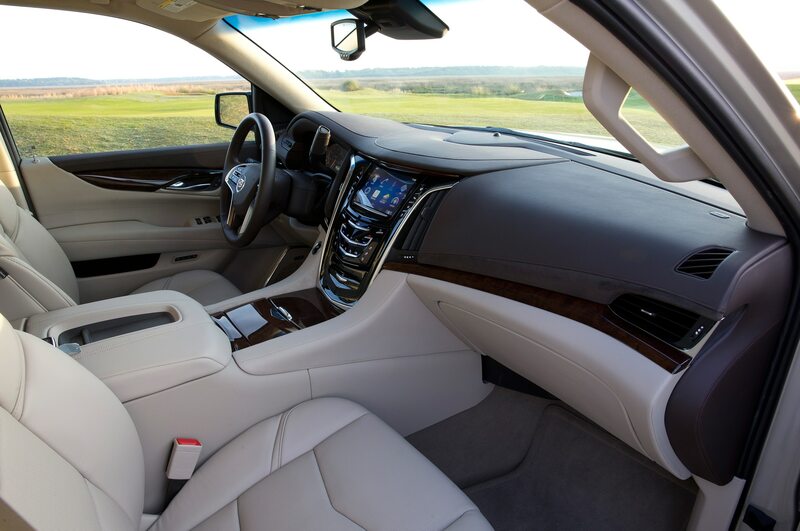 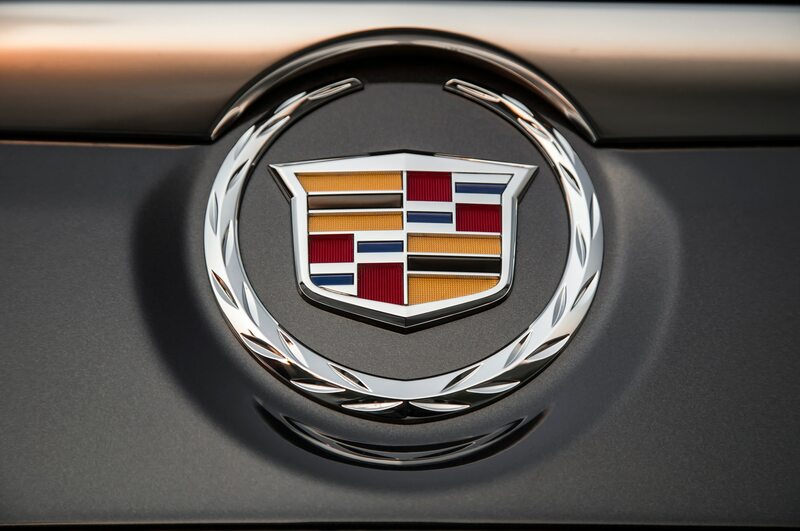 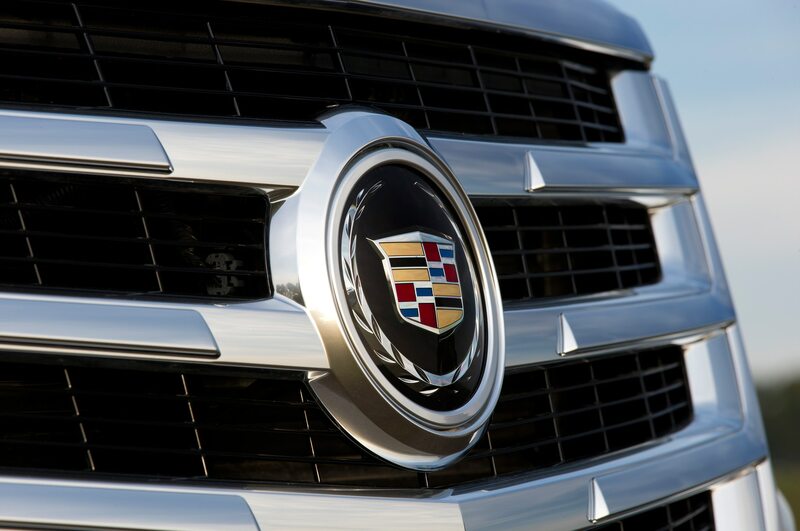 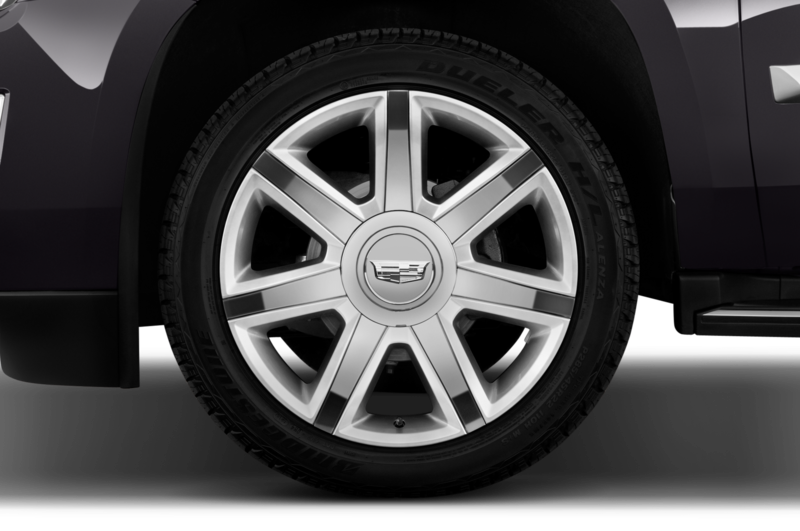 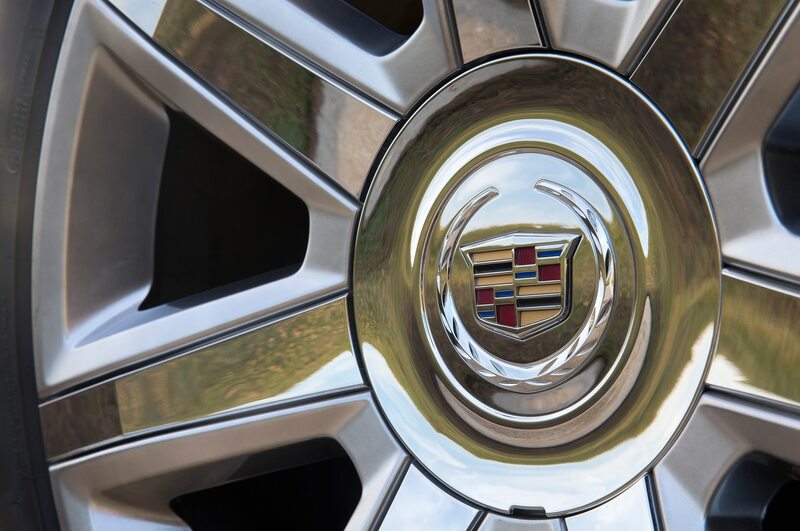 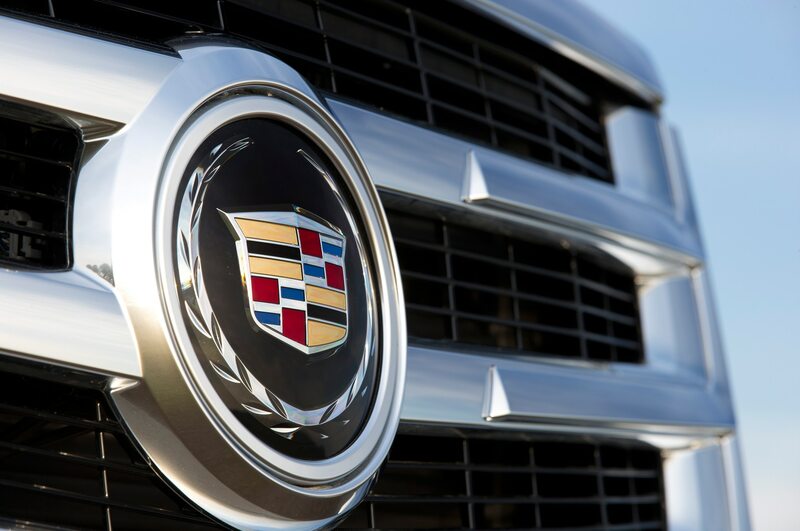 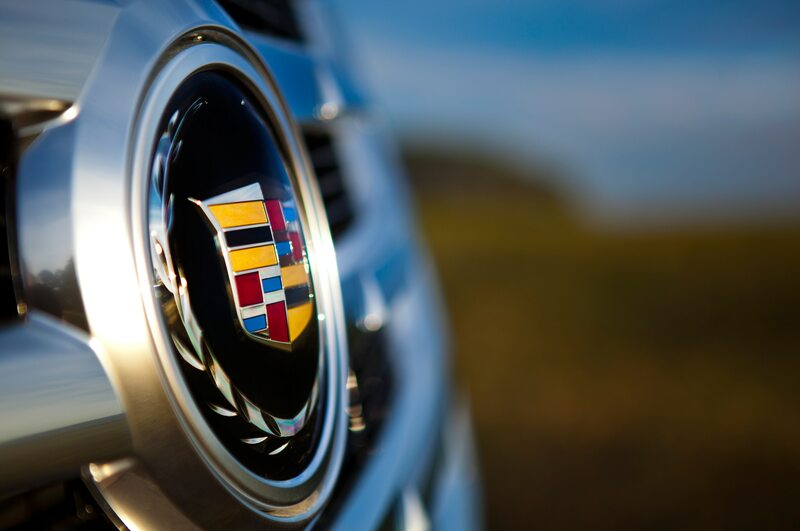 The Navigator is a wonderful vehicle that will satisfy many buyers’ needs to blend utility and comfort, but the Cadillac represents a fresher, more modern recipe for what a large personal luxury vehicle should be in 2015. 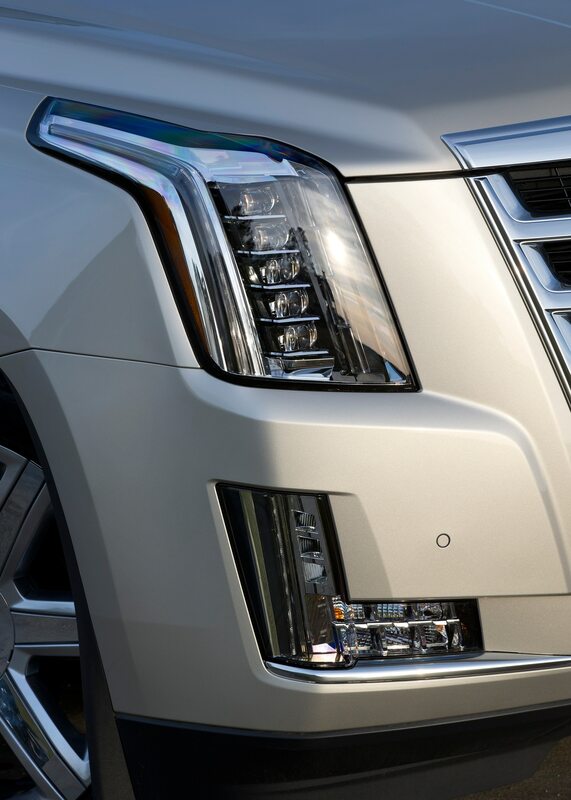 Part of a $5.4 billion investment in U.S. manufacturing. 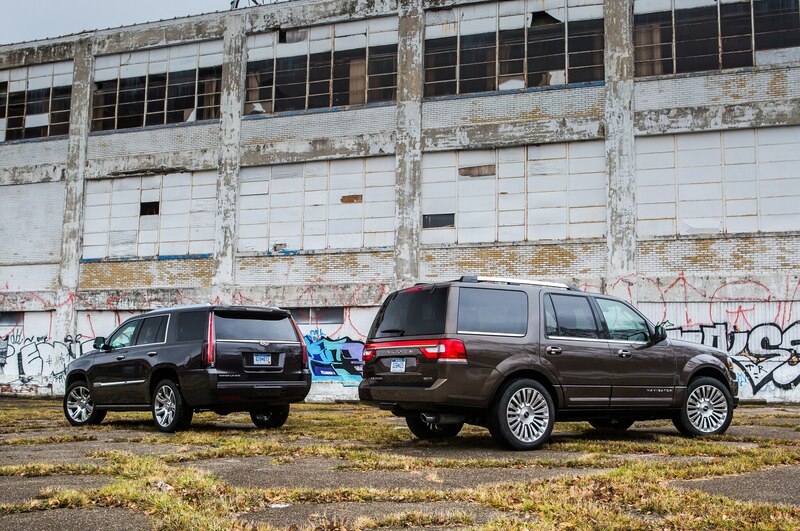 SUVs adds a fancy trim level.